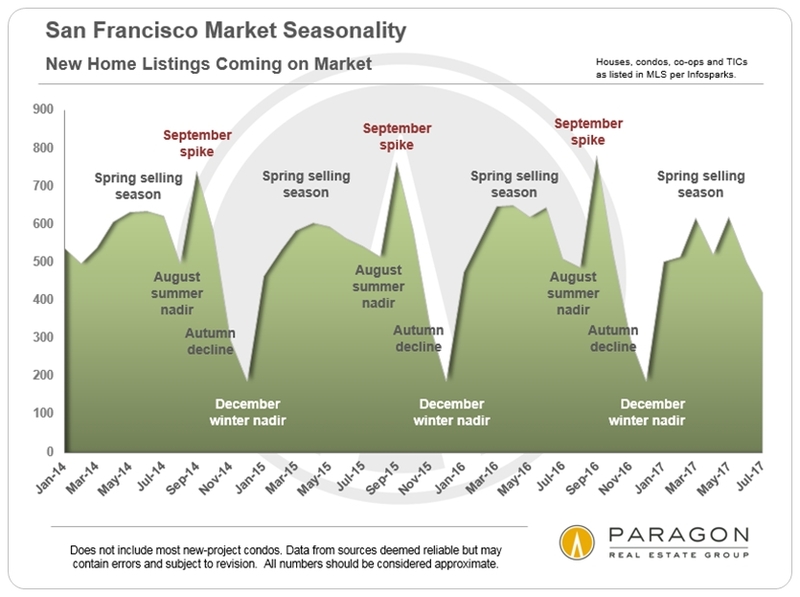 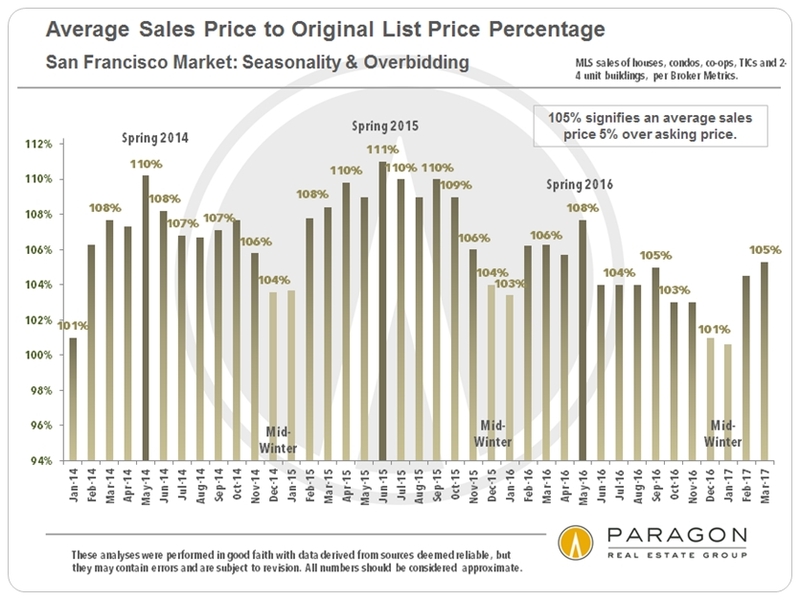 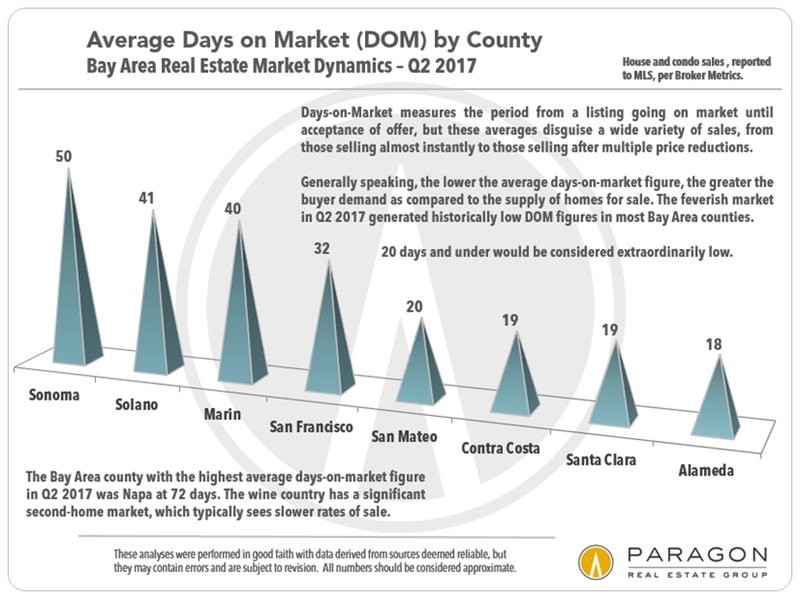 Quick Market UpdateDecember through February constitute the slowest sales months of the year and are subject to significant seasonal issues, so coming to definitive conclusions about where the market is heading based on their data is difficult. 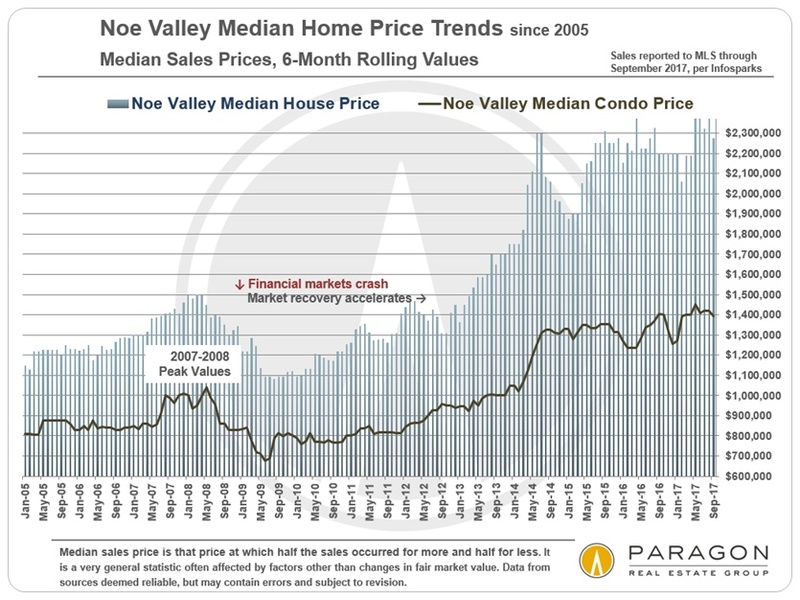 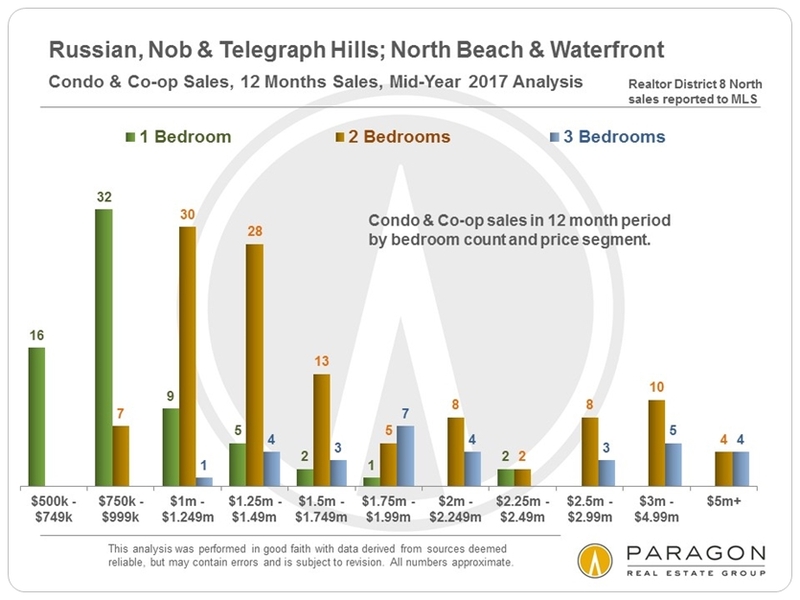 However, for what it is worth, comparing the 3-month period to the same period a year ago, the median house sales price at $1,290,000 is up 4.5% and the median condo sales price at $1,050,000 is down 4.1%. 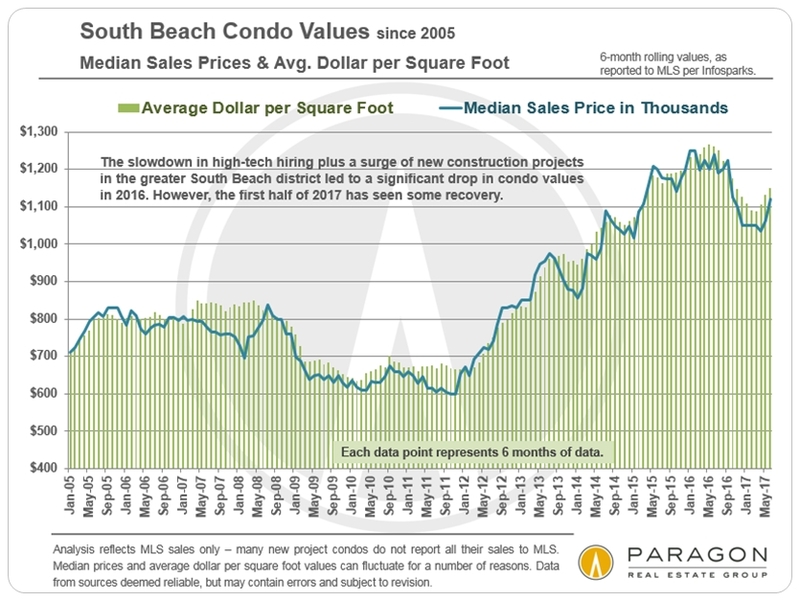 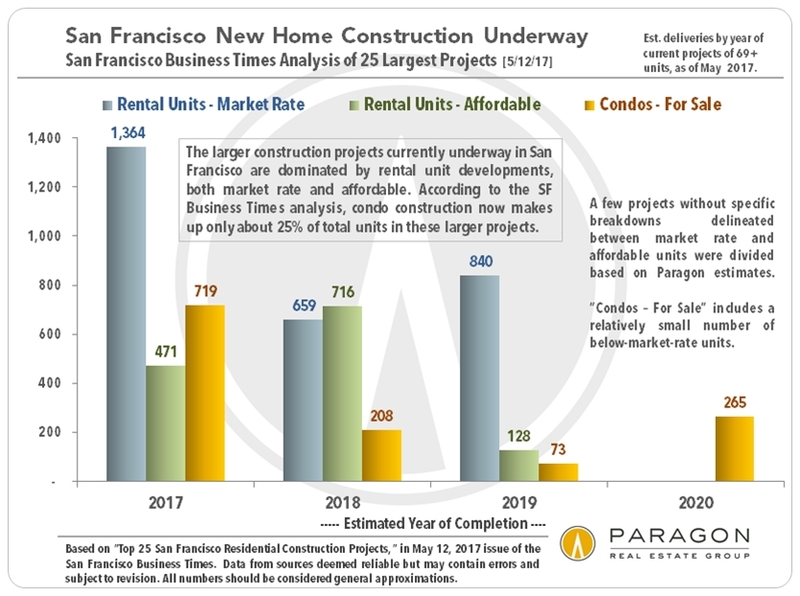 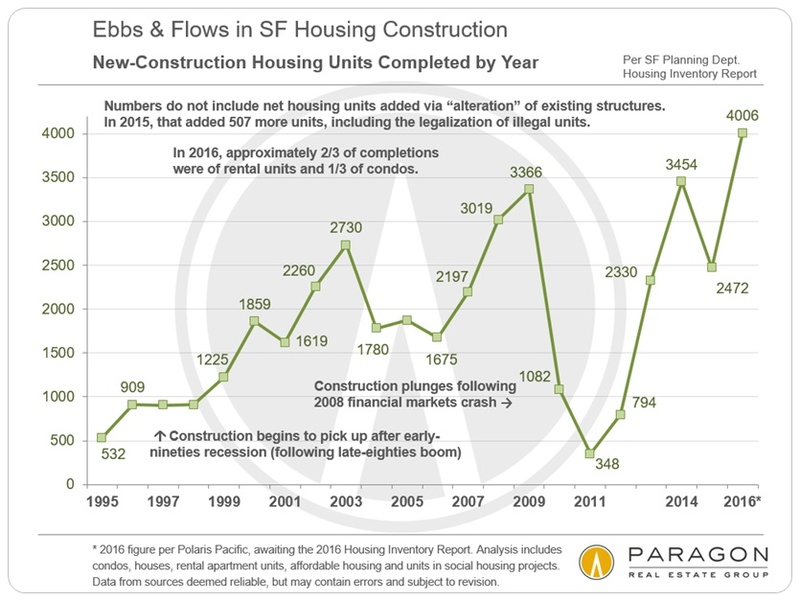 As mentioned in earlier reports, the big dynamic affecting the condo market has been the surge of new-construction inventory hitting the market in the past year, just as demand started to soften. 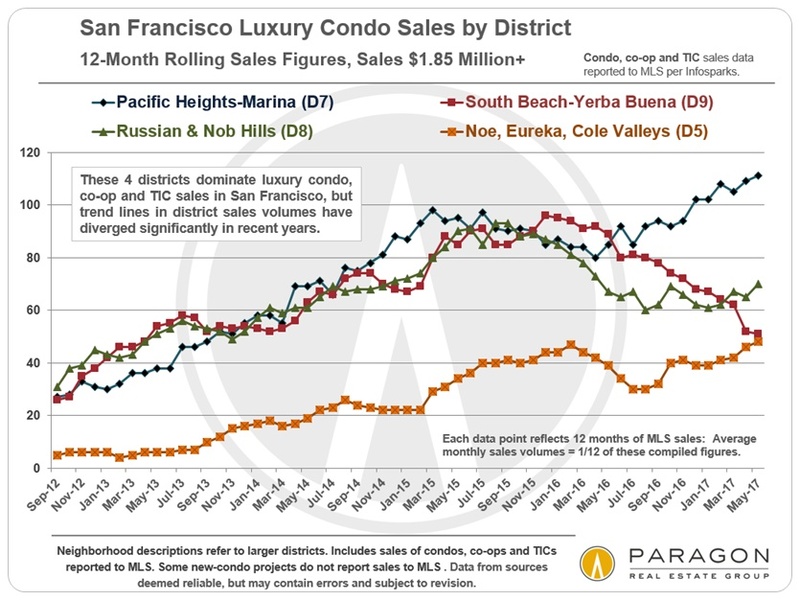 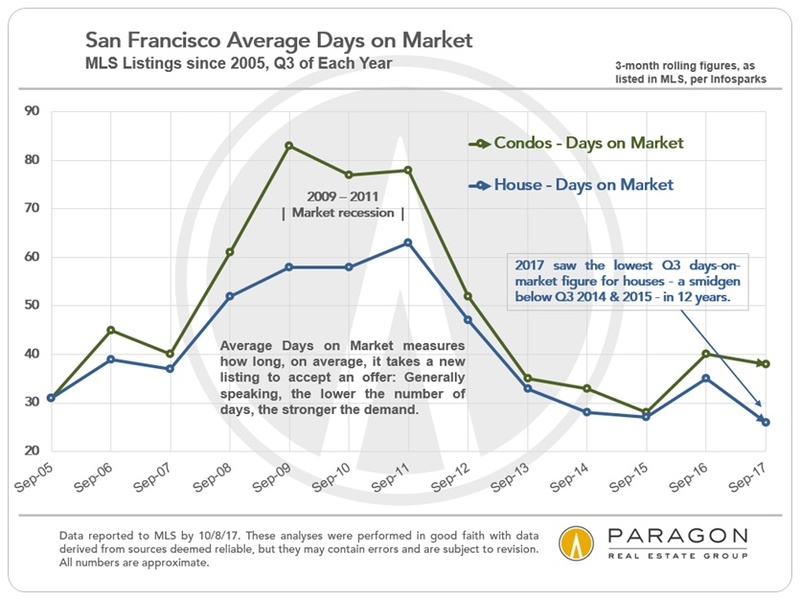 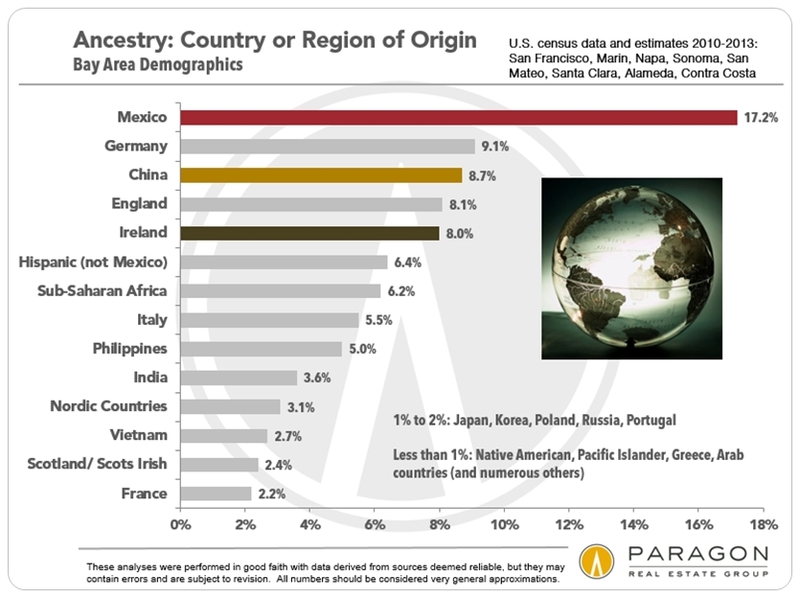 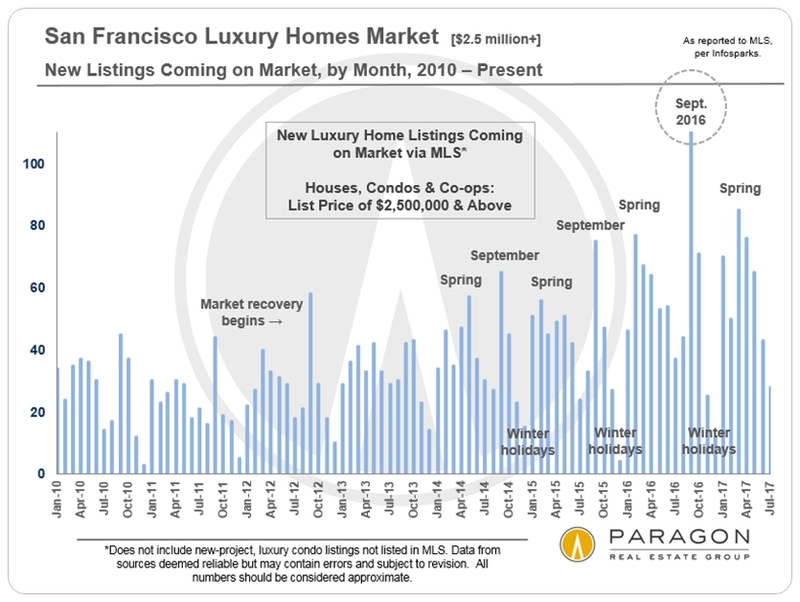 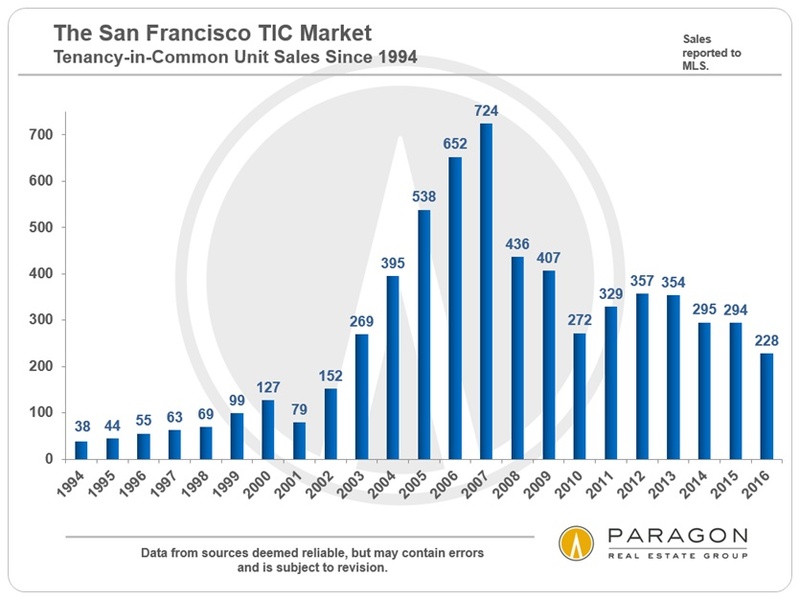 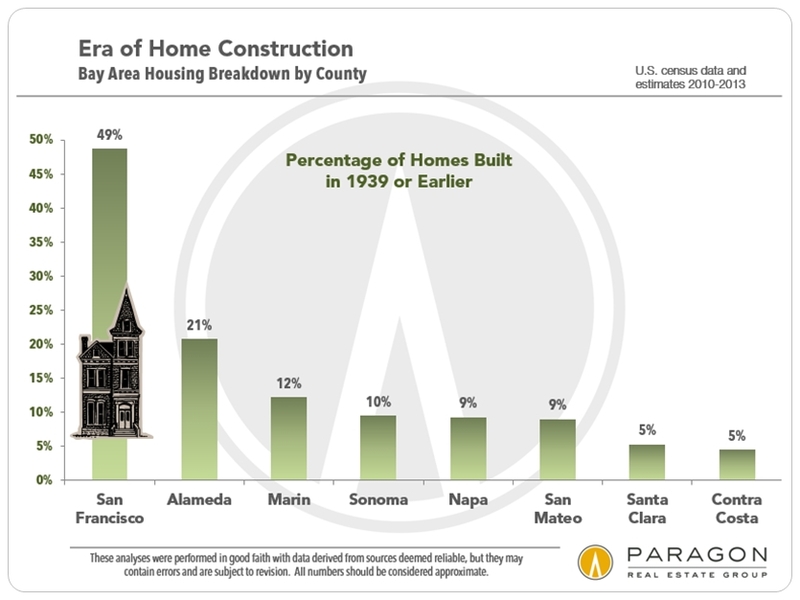 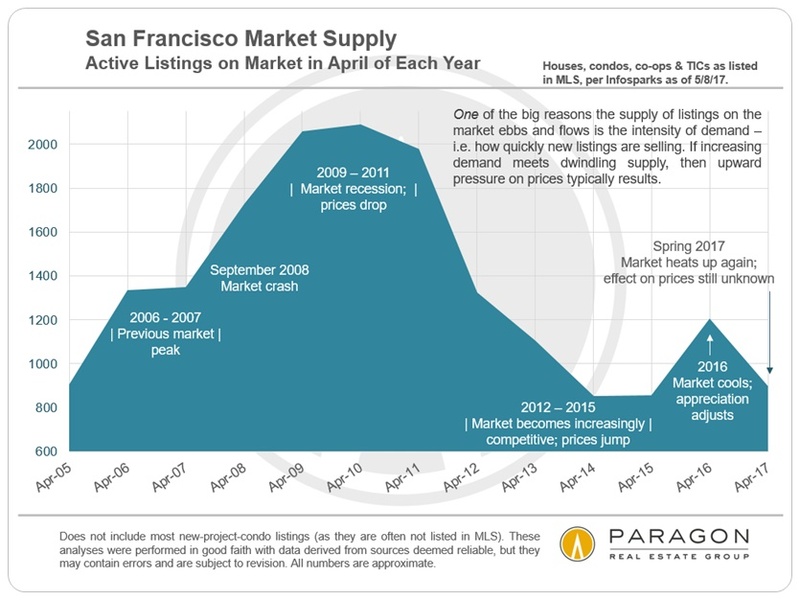 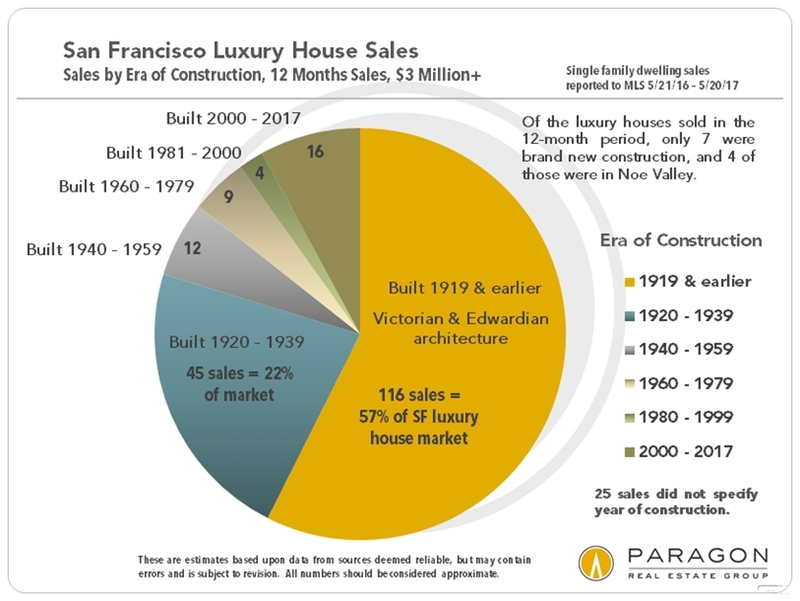 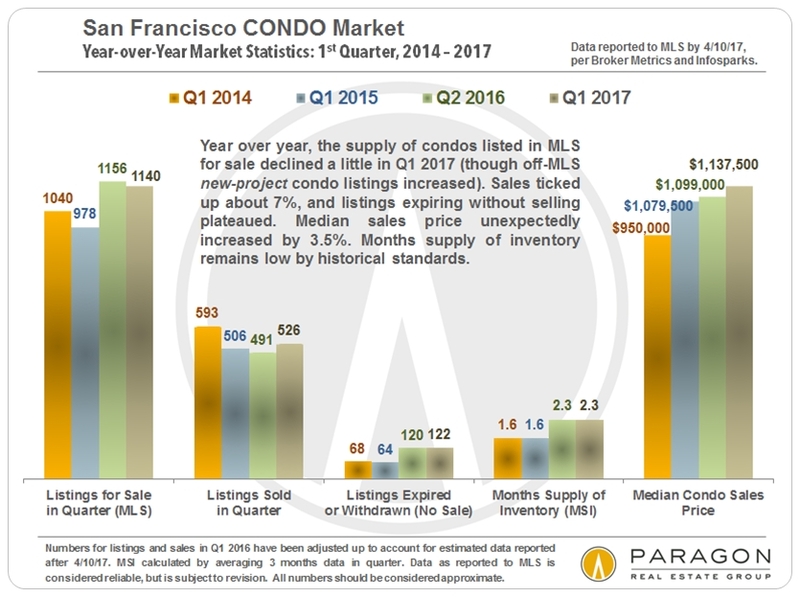 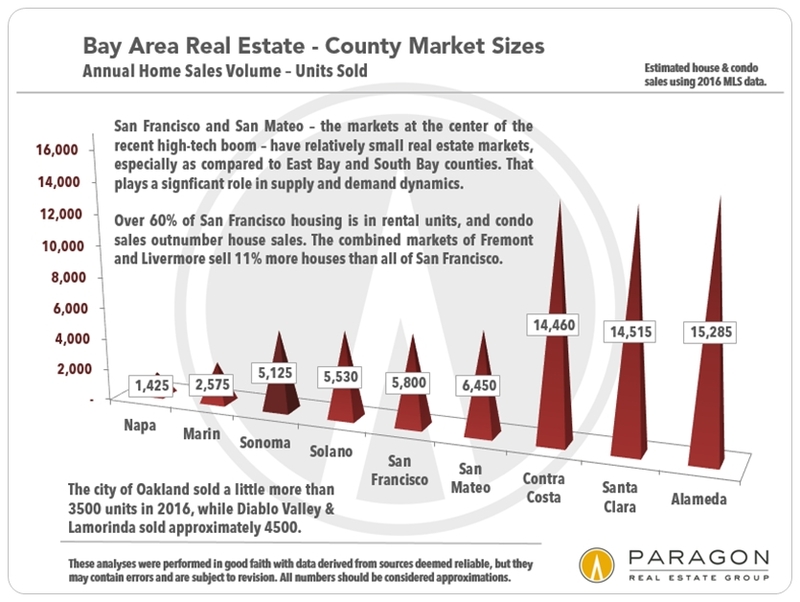 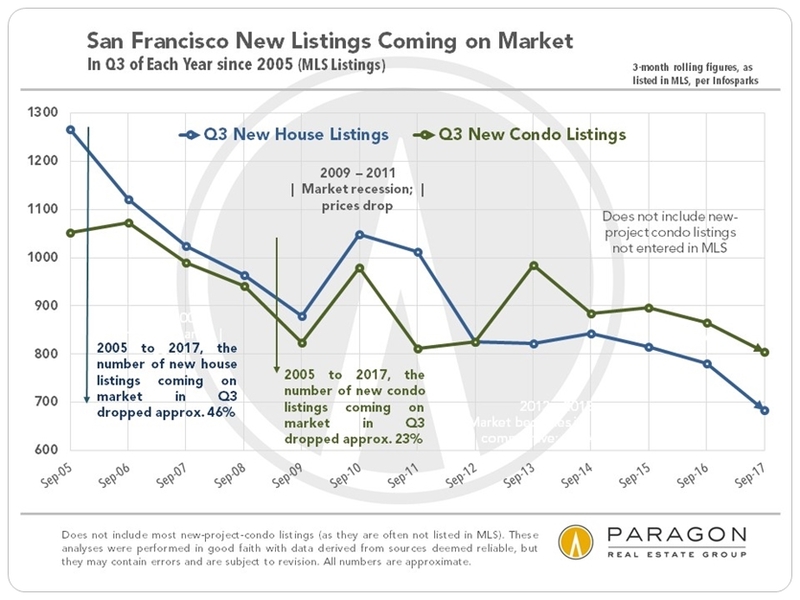 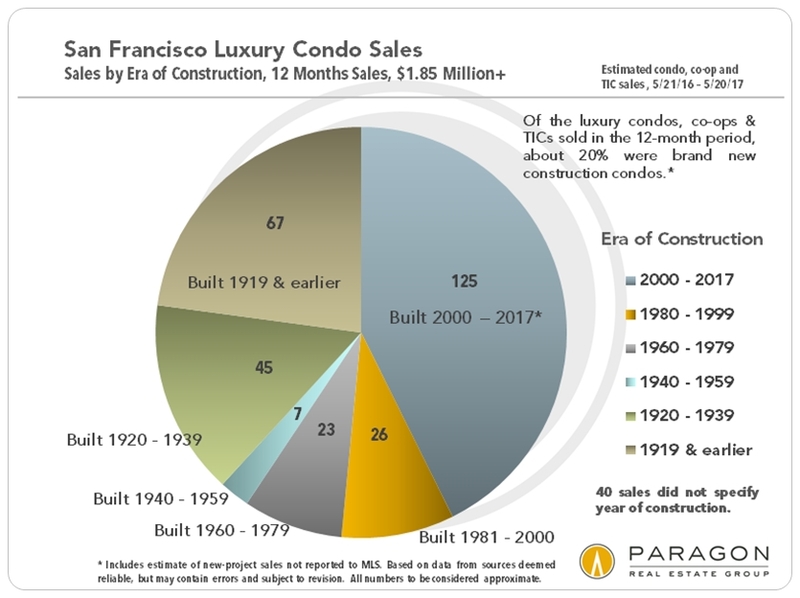 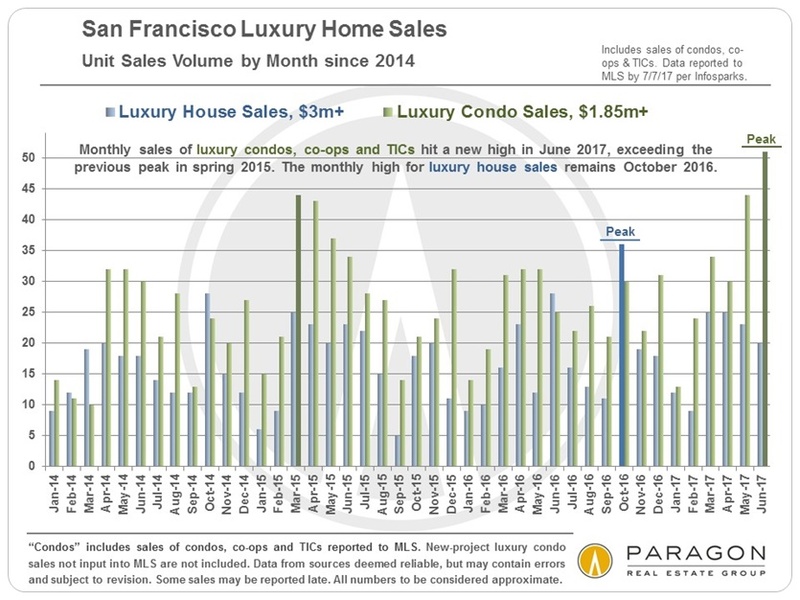 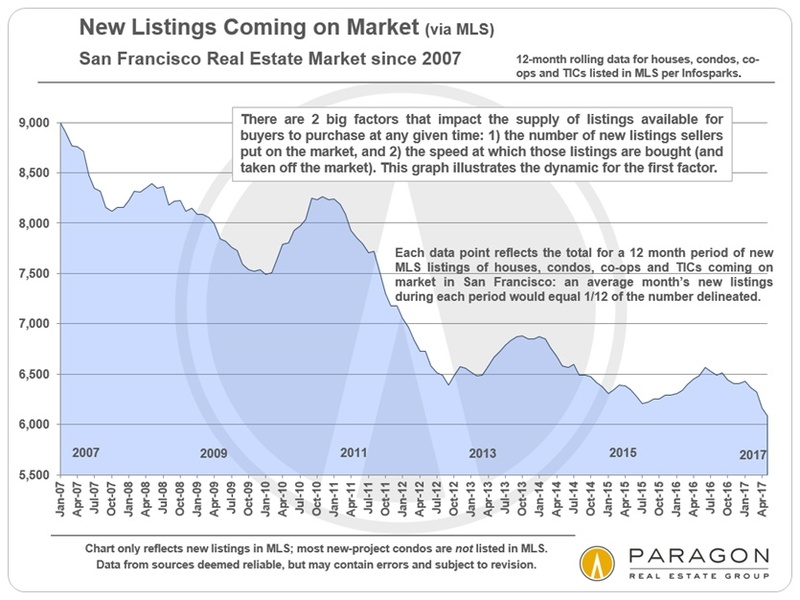 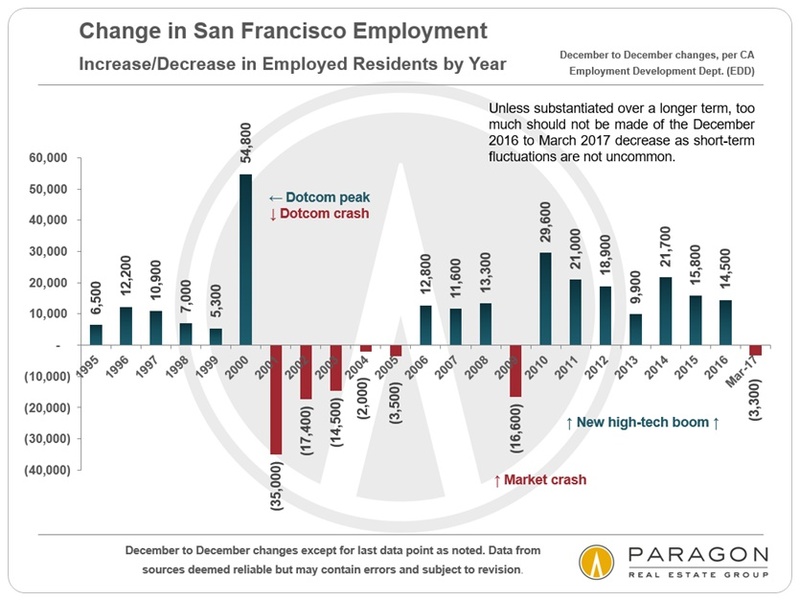 The inventory of new condos for sale is now at its highest level in 7 years, and, not surprisingly, this is impacting the supply and demand dynamic for condos, especially in those districts where new construction is concentrated. 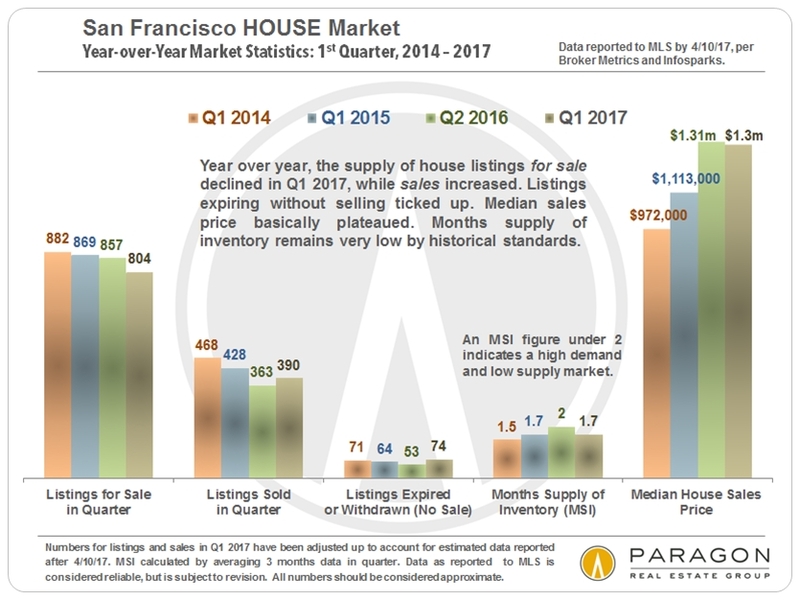 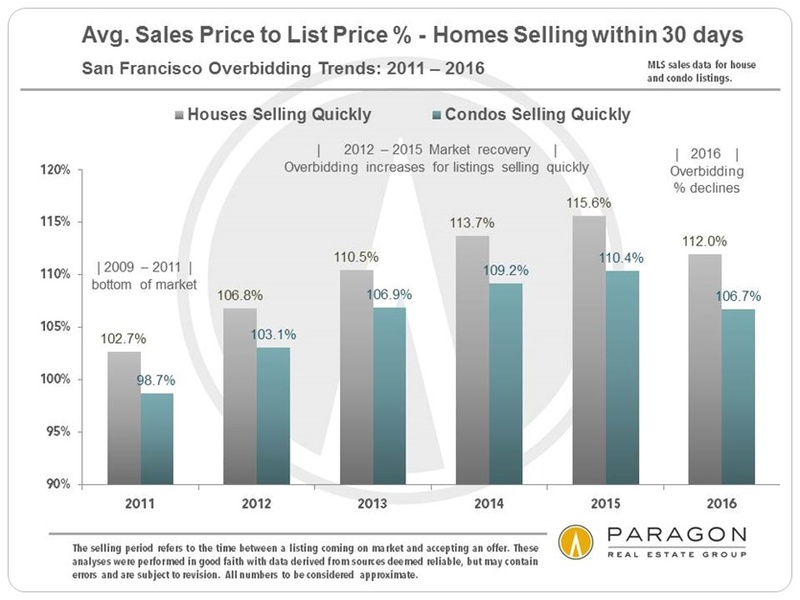 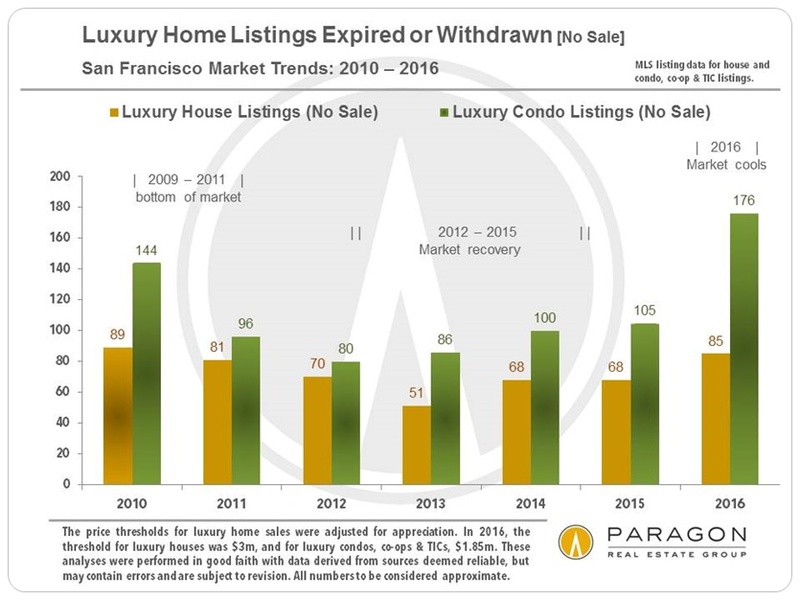 On the other hand, the inventory of house listings continues to remain at record lows, keeping that market, especially its more affordable segments, quite competitive. 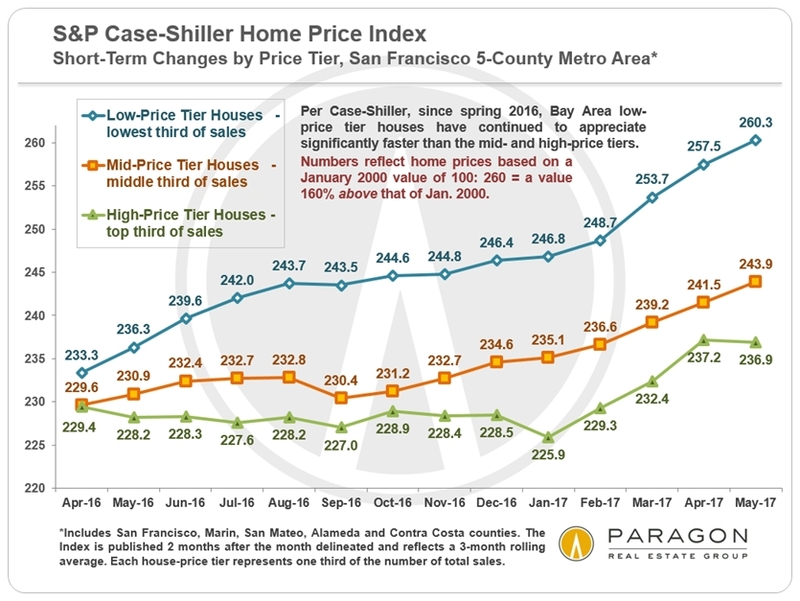 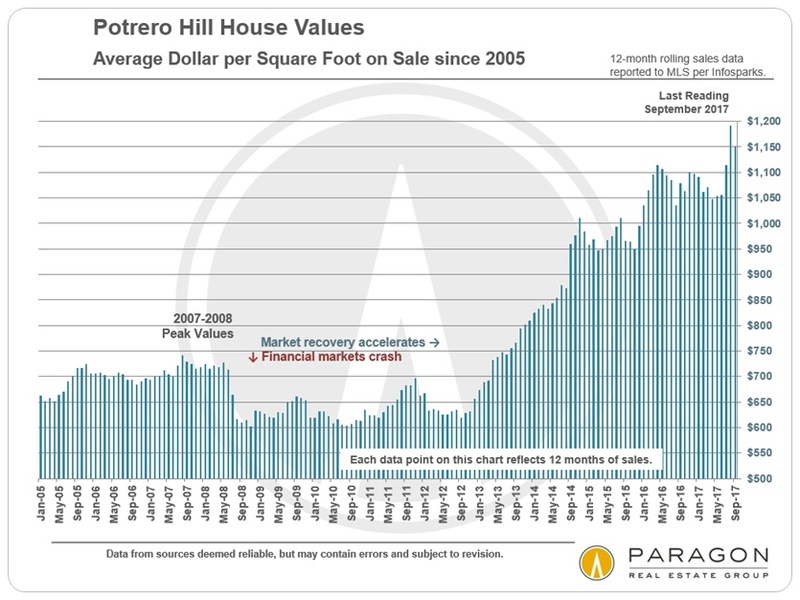 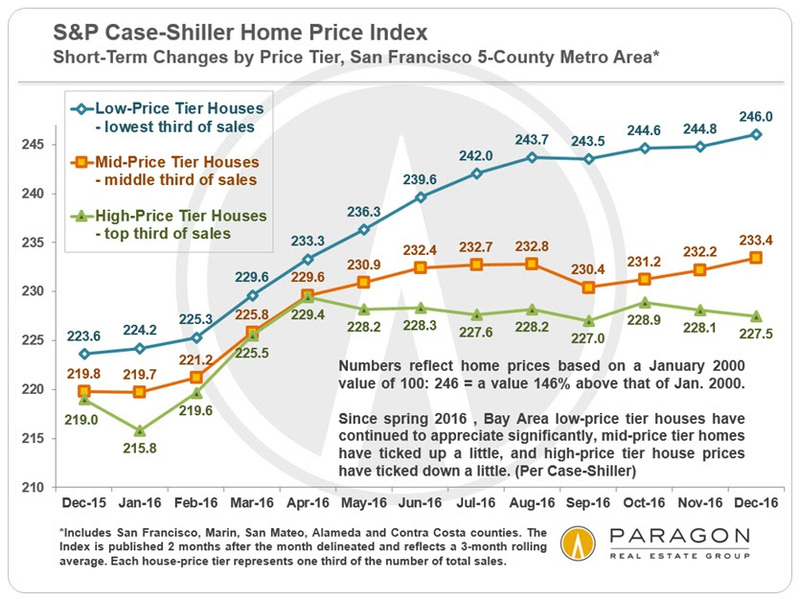 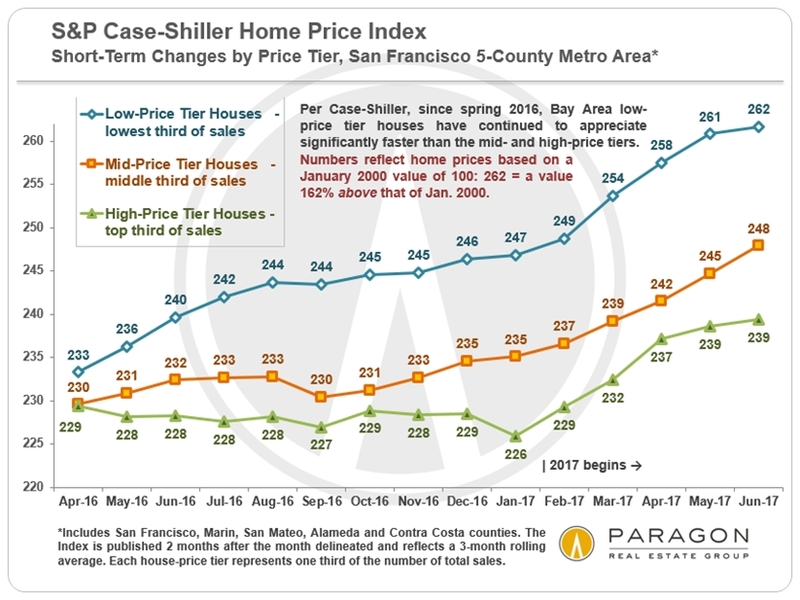 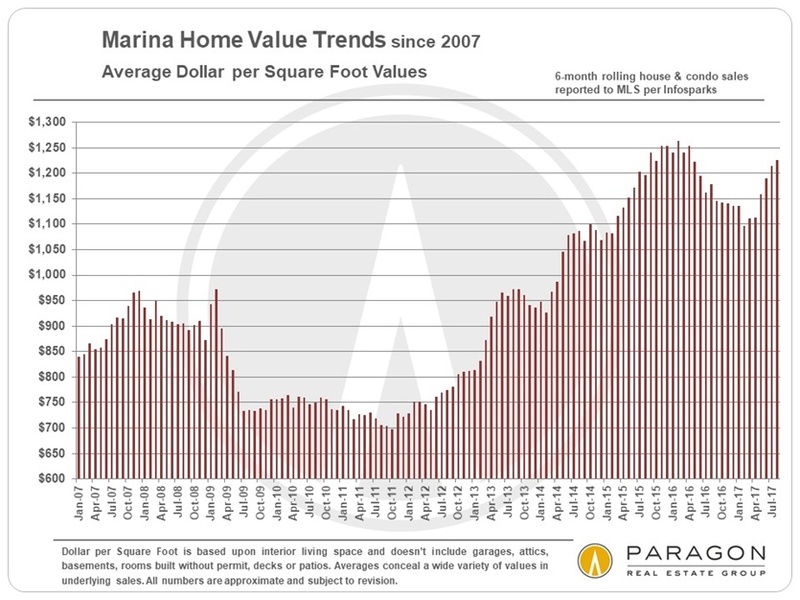 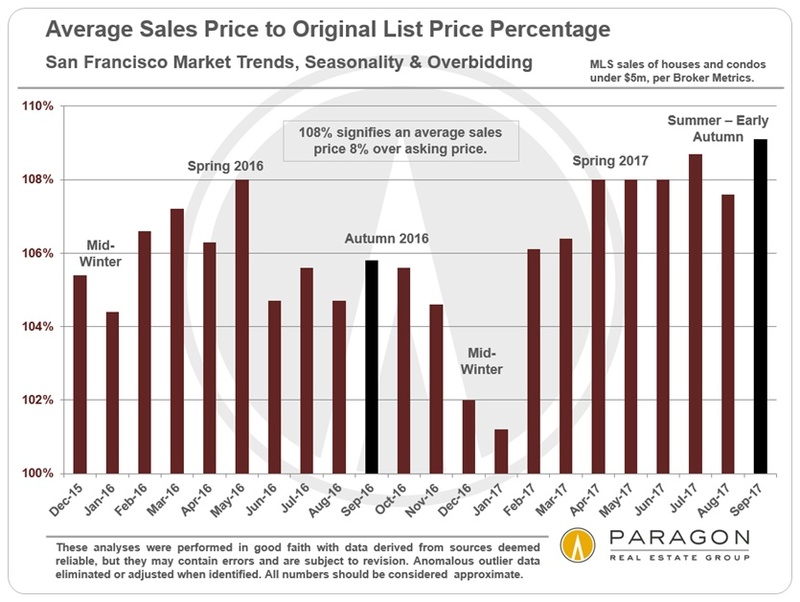 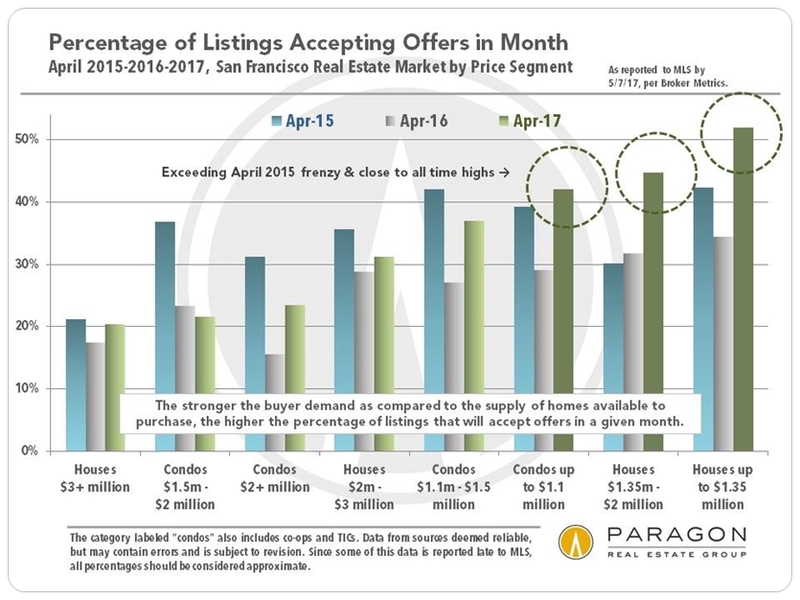 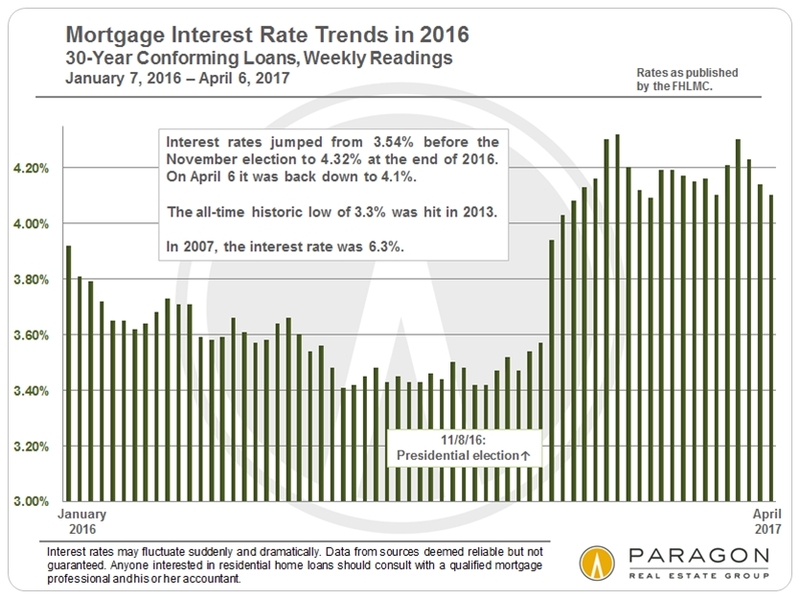 The period of March through May is usually the most active selling season of the year, and we will soon have more conclusive indications of where the 2017 market is headed. 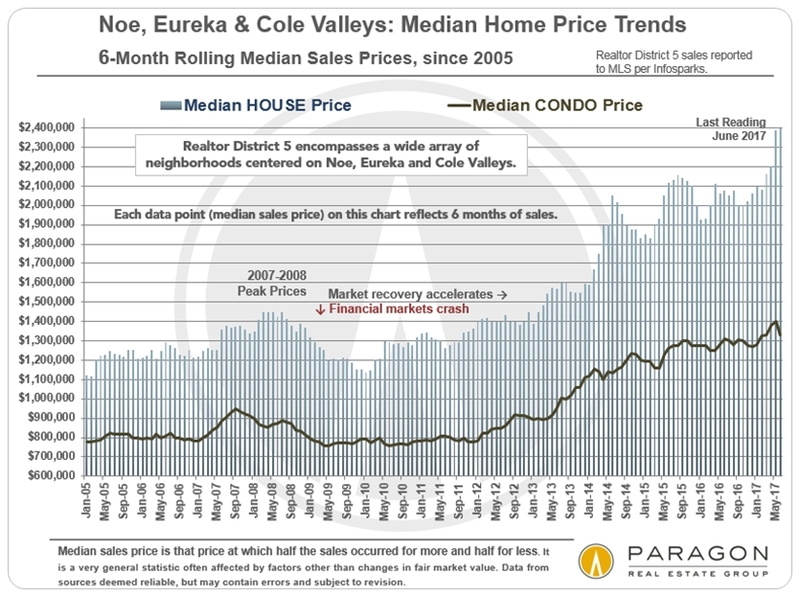 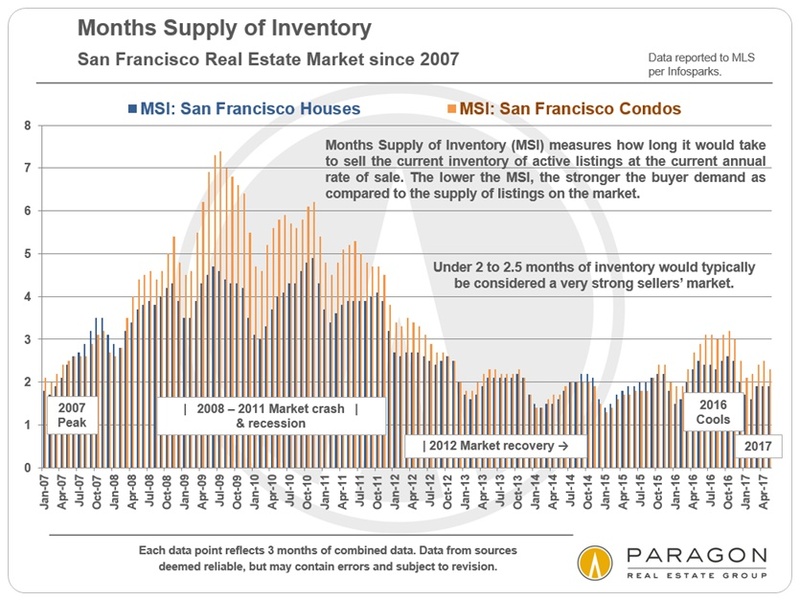 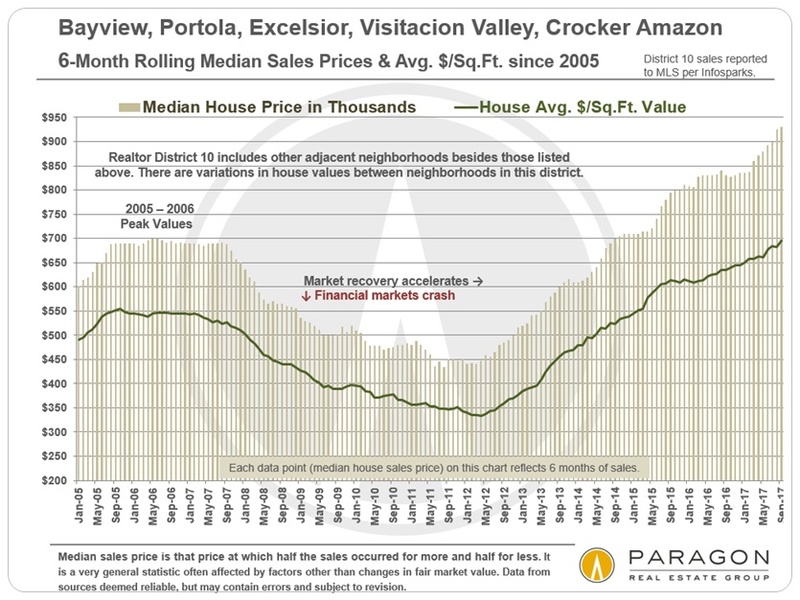 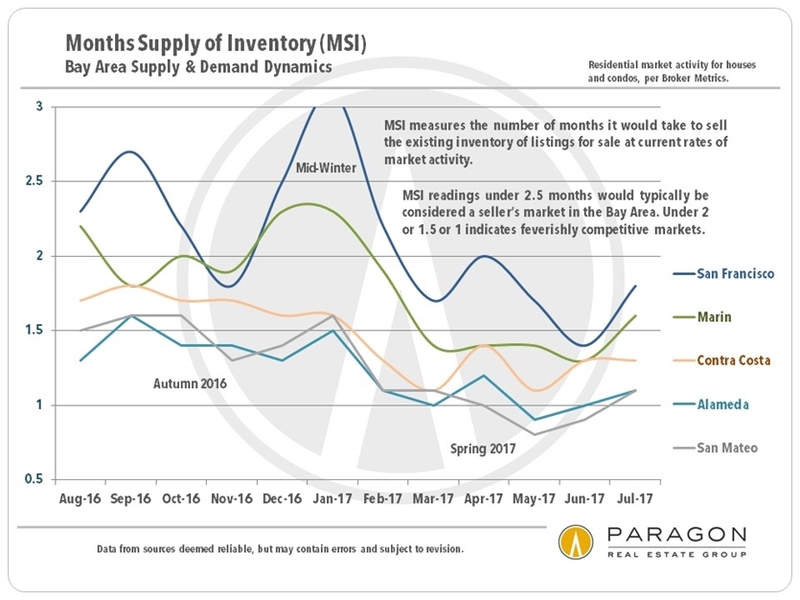 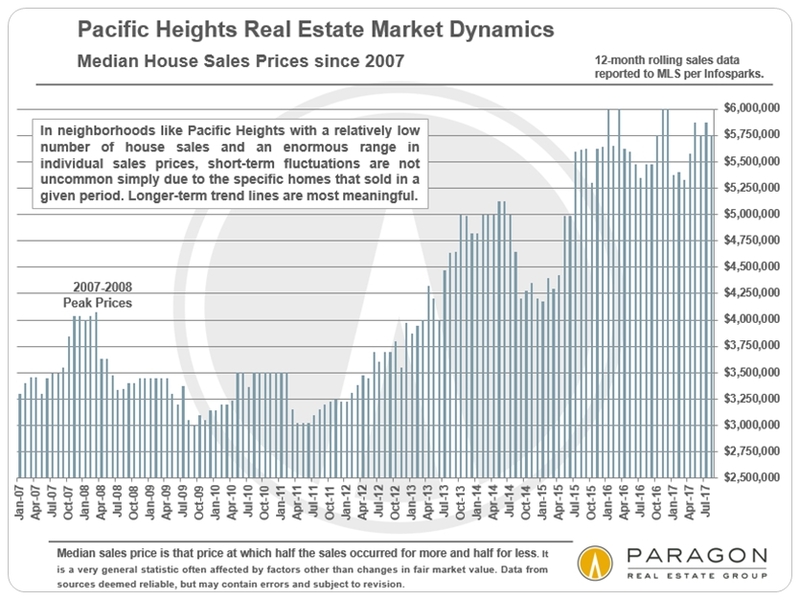 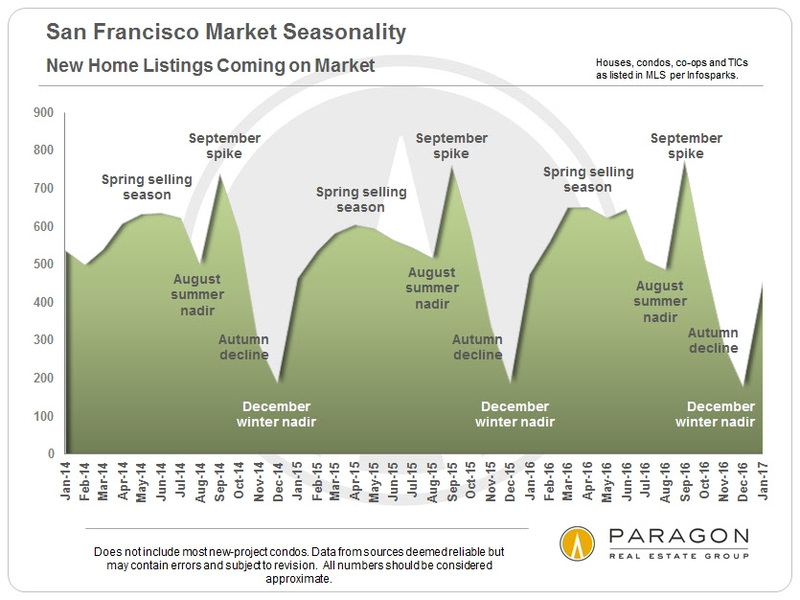 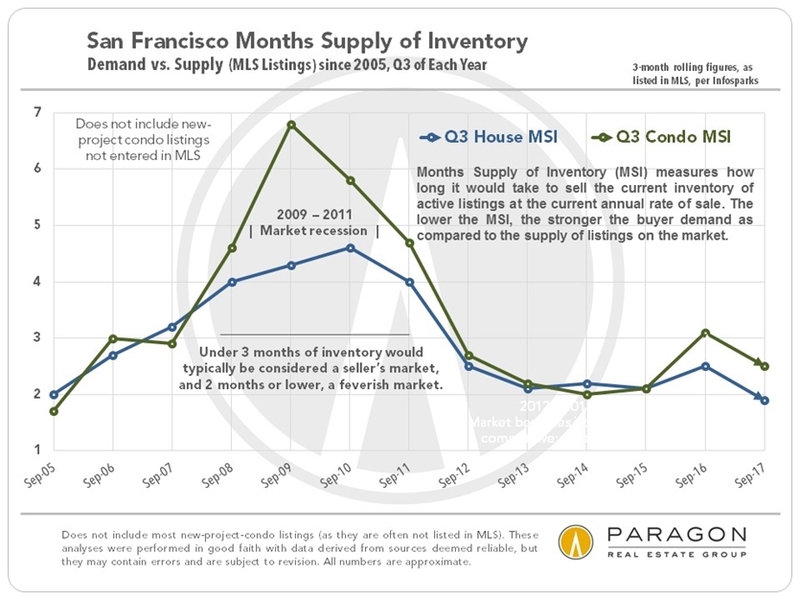 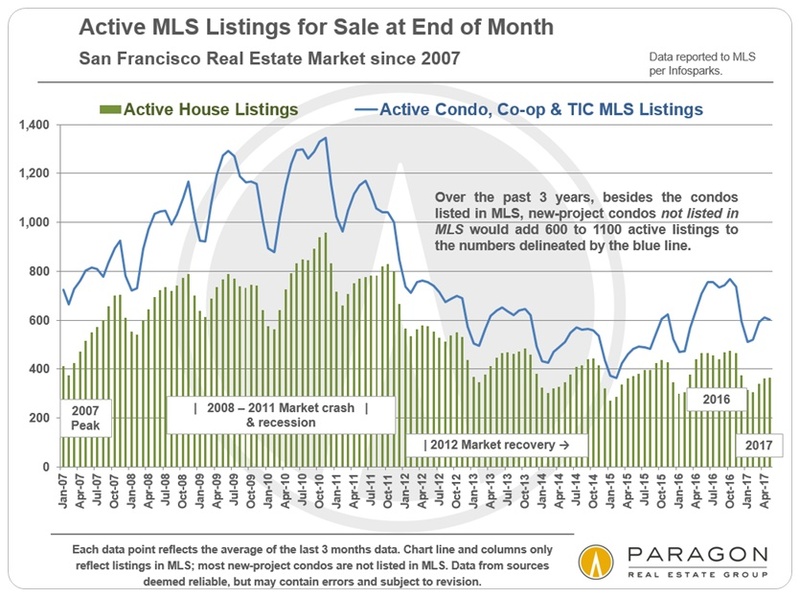 This next chart illustrates the typical, dramatic surge of new inventory that fuels sales during this season. 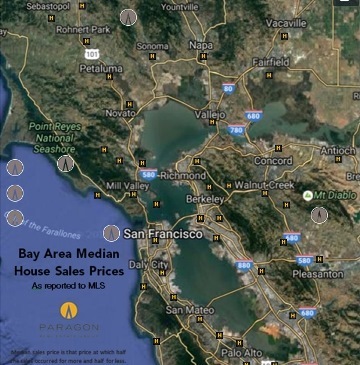 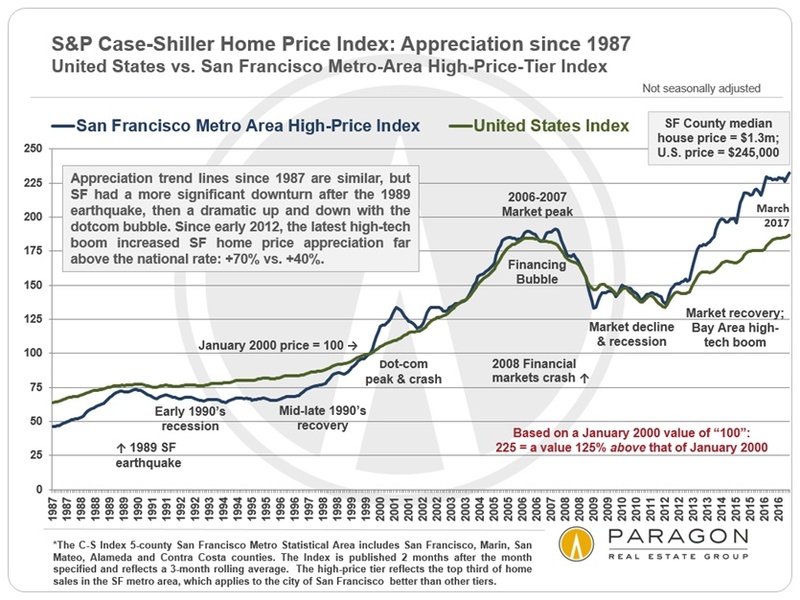 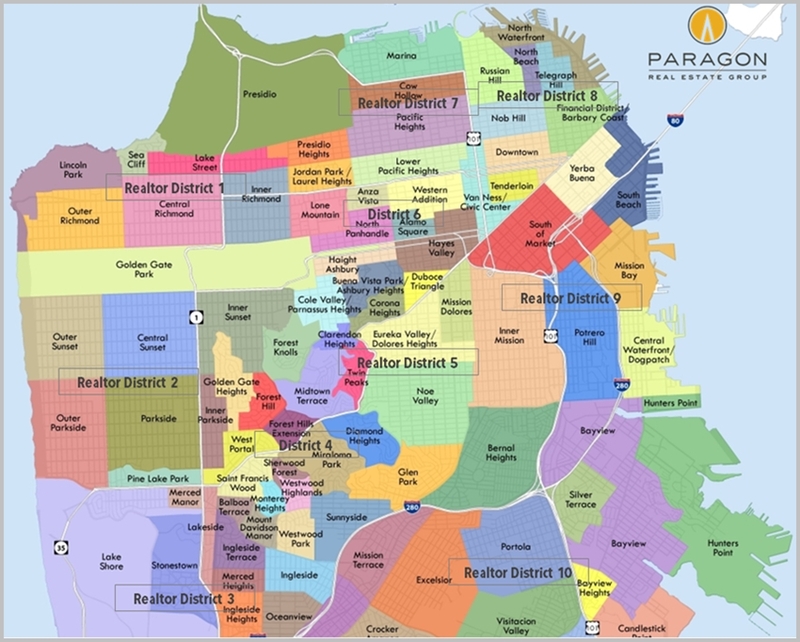 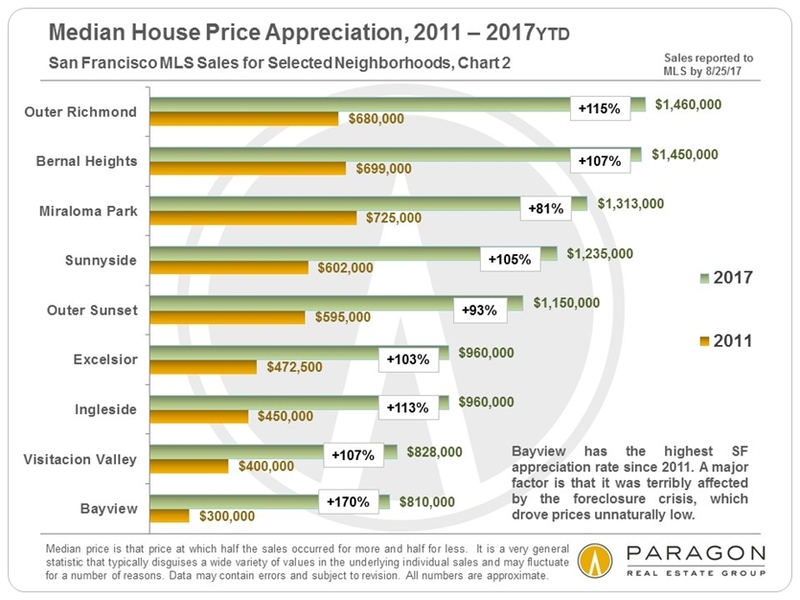 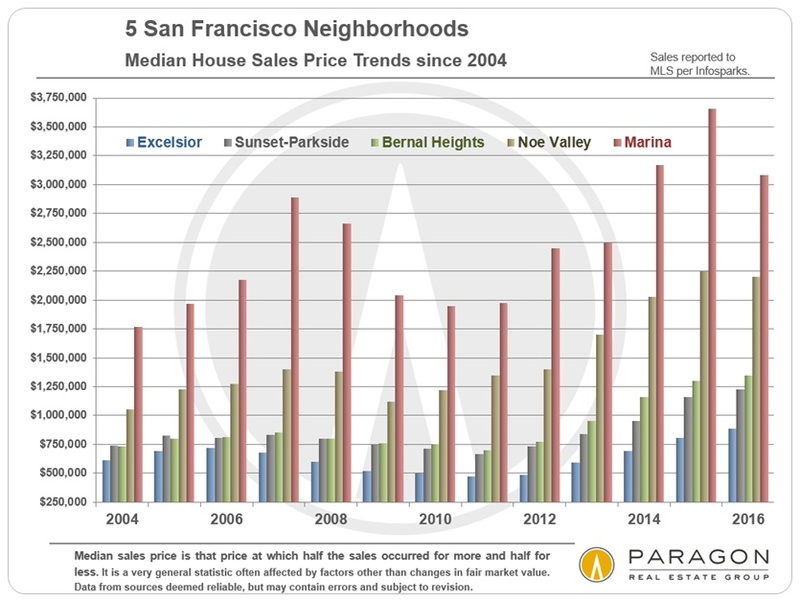 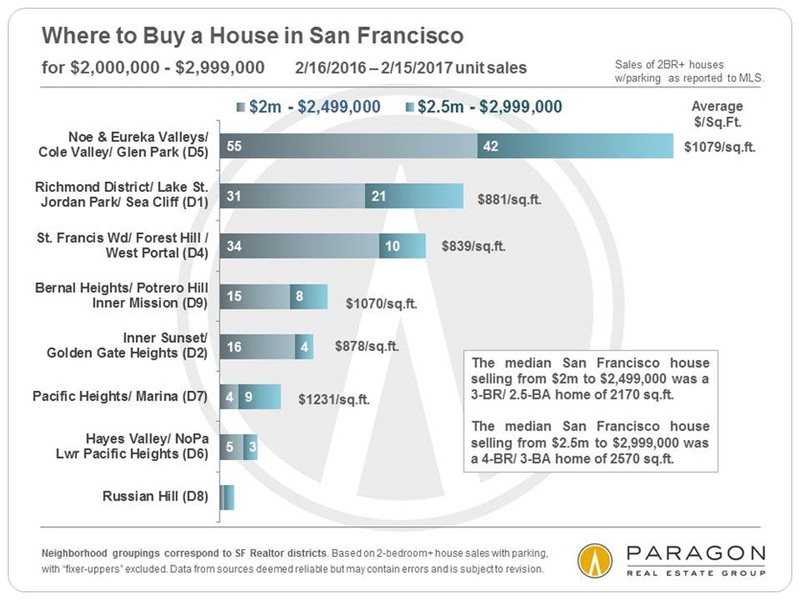 San Francisco Home Sales with ViewsSF is a city known for its wide variety of gorgeous views, which can add substantially to the value of a home so graced. 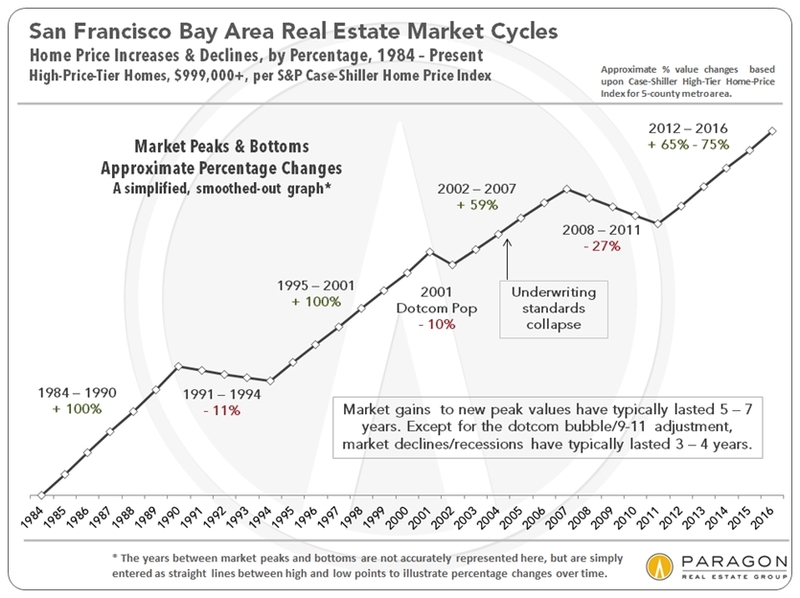 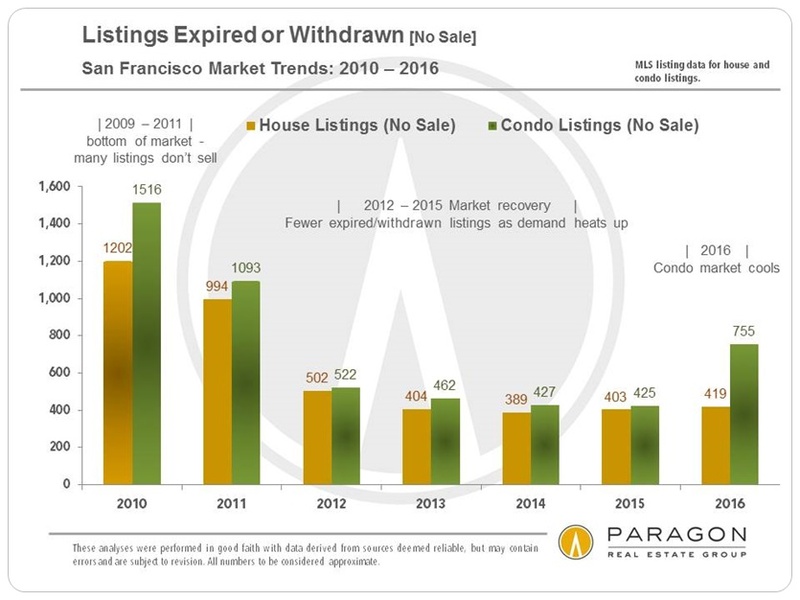 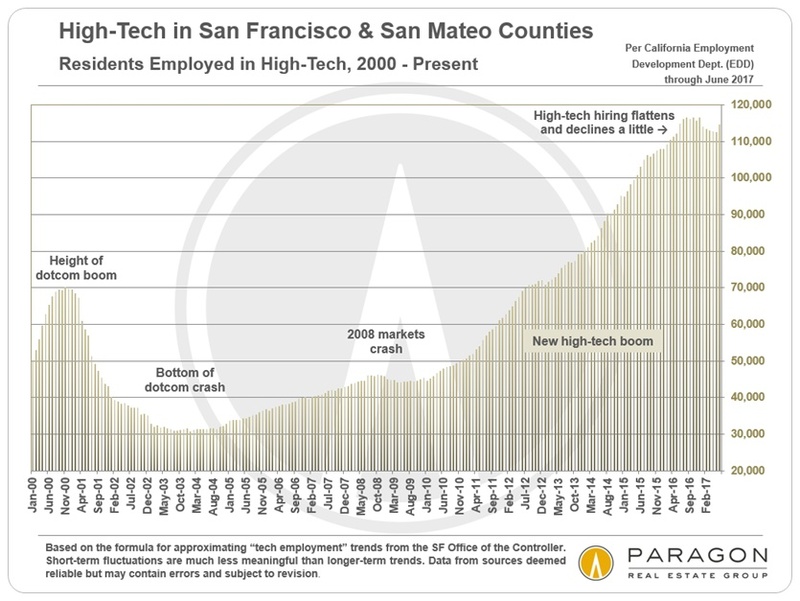 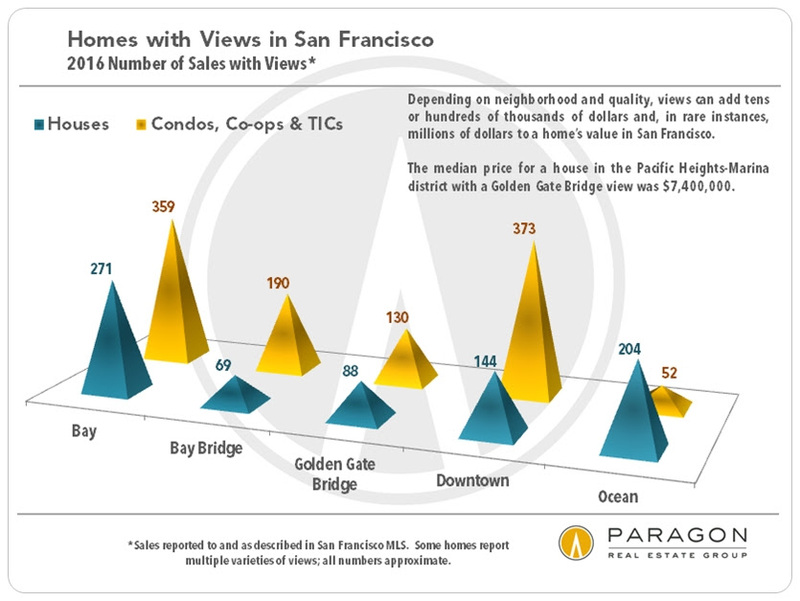 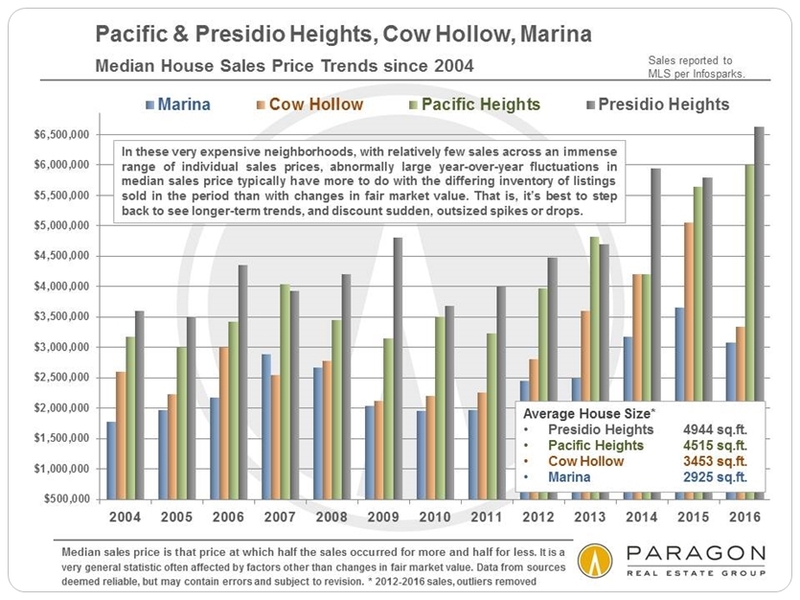 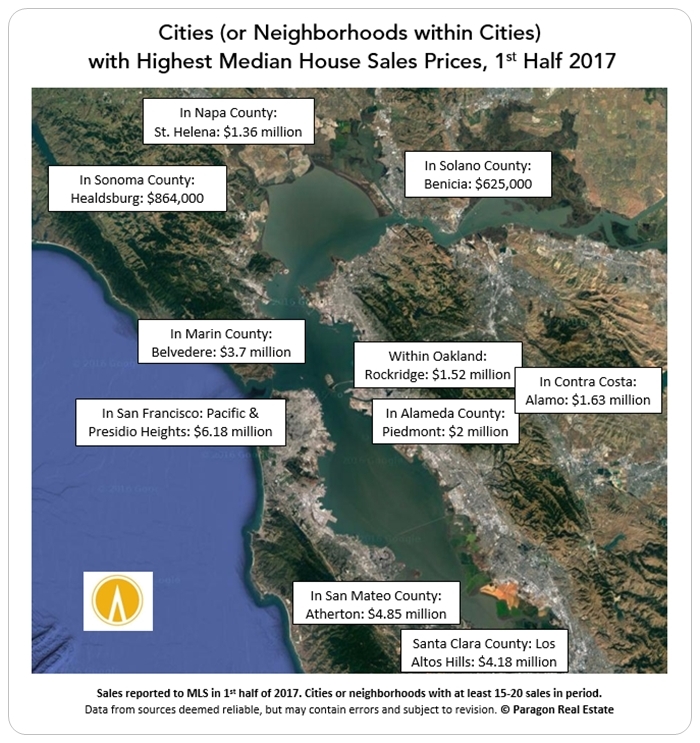 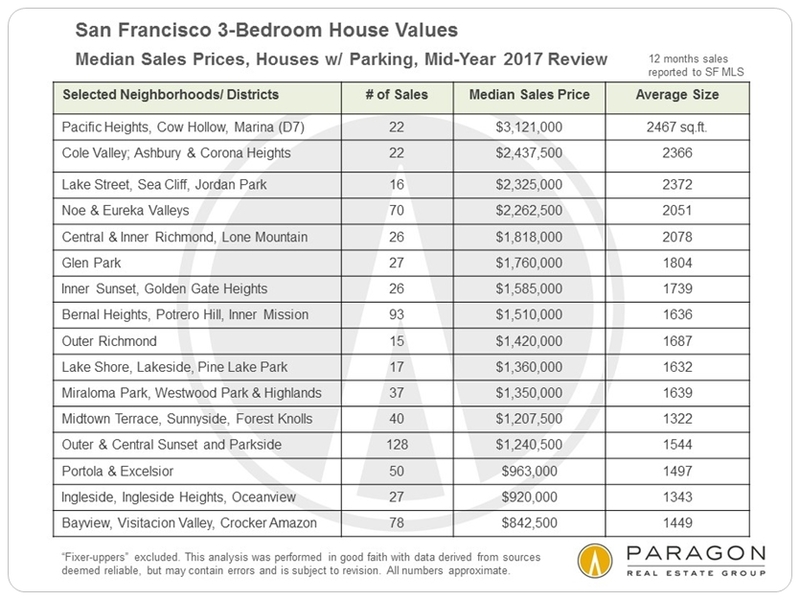 Of all the house sales in 2016, only 88 reported having a Golden Gate Bridge view, and some of those were peek-a-boo views (i.e. 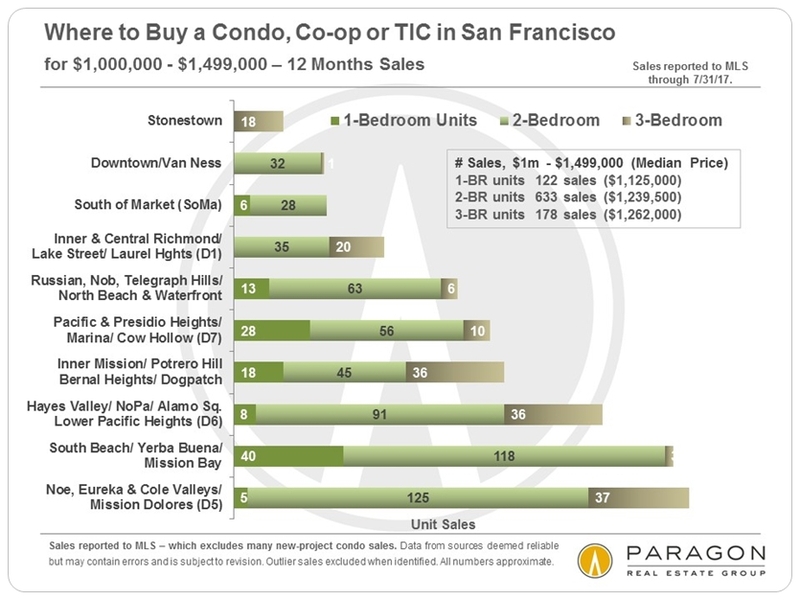 if you lean out the bathroom window on the top floor) or roof deck views. 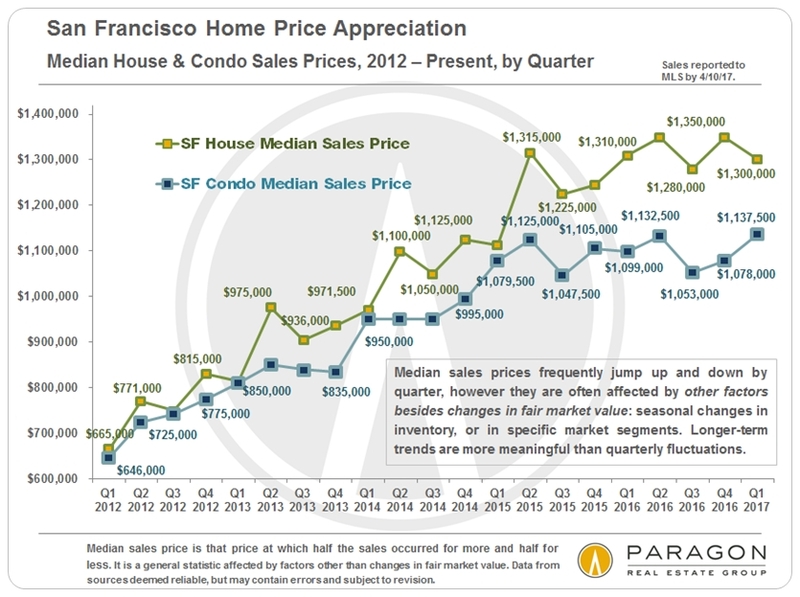 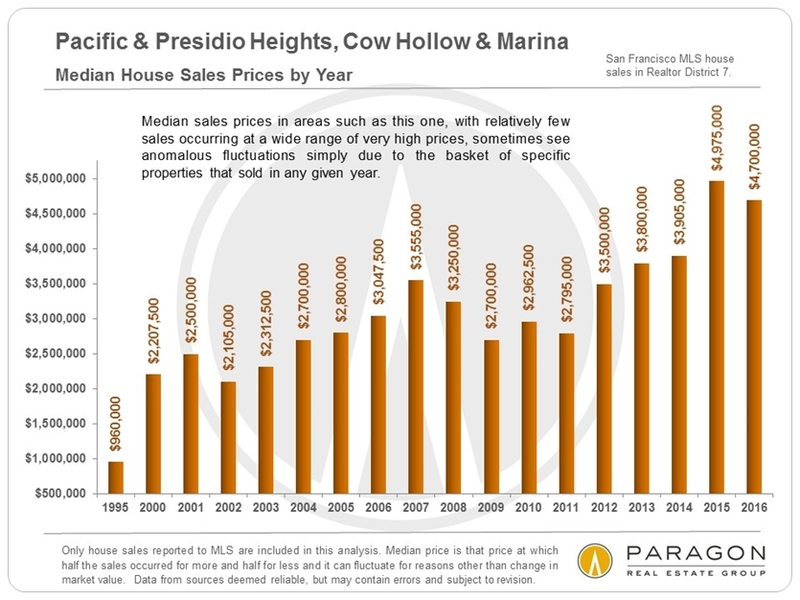 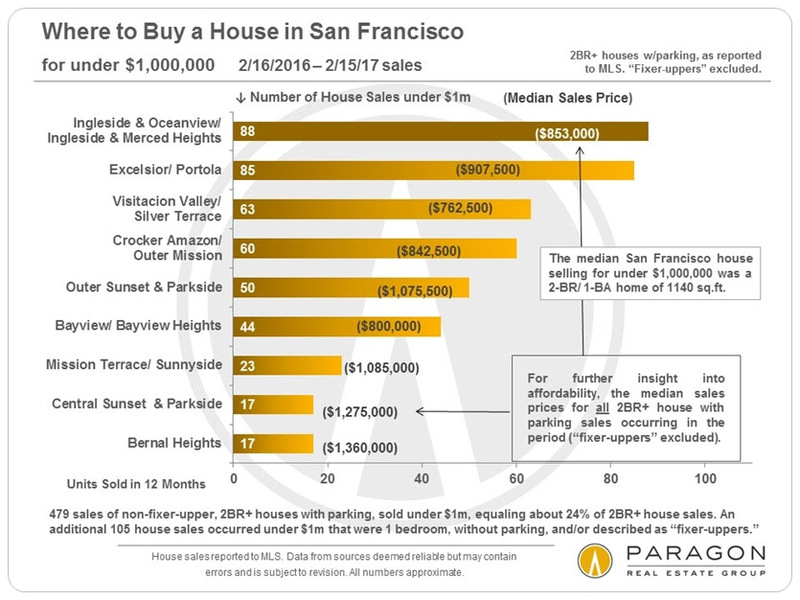 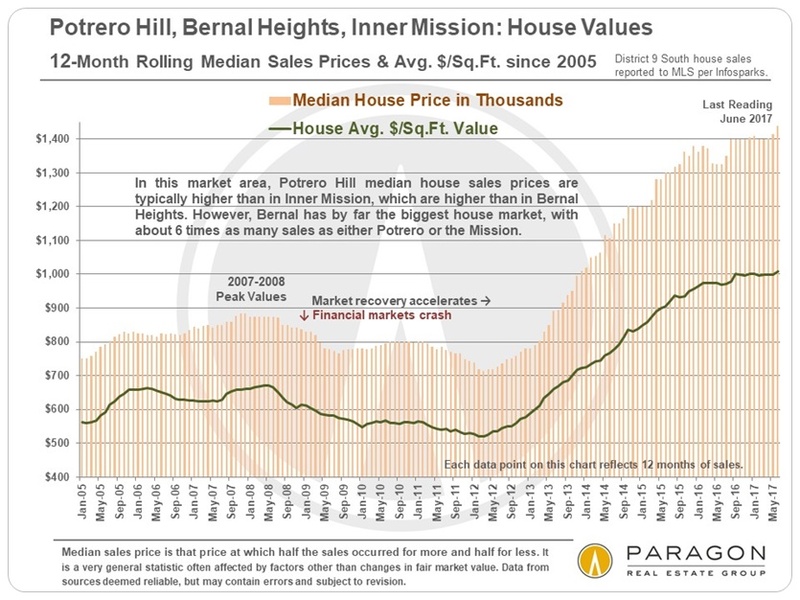 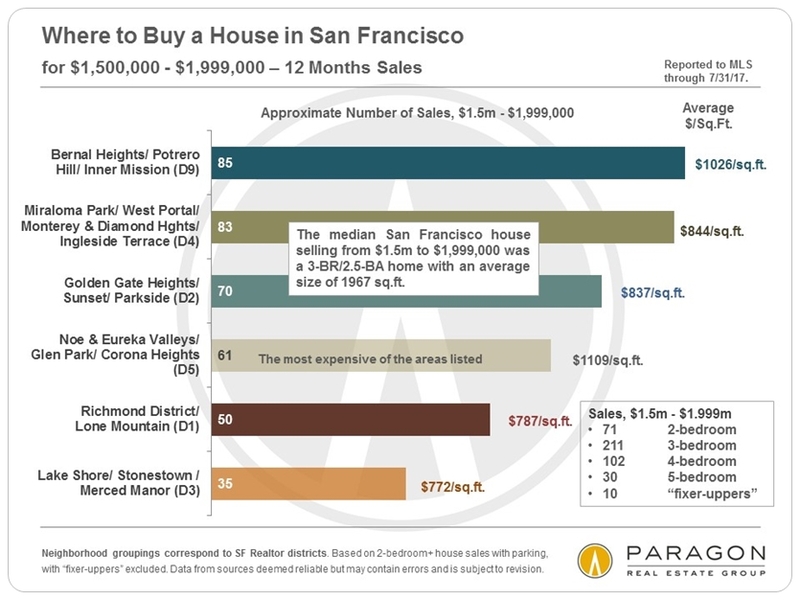 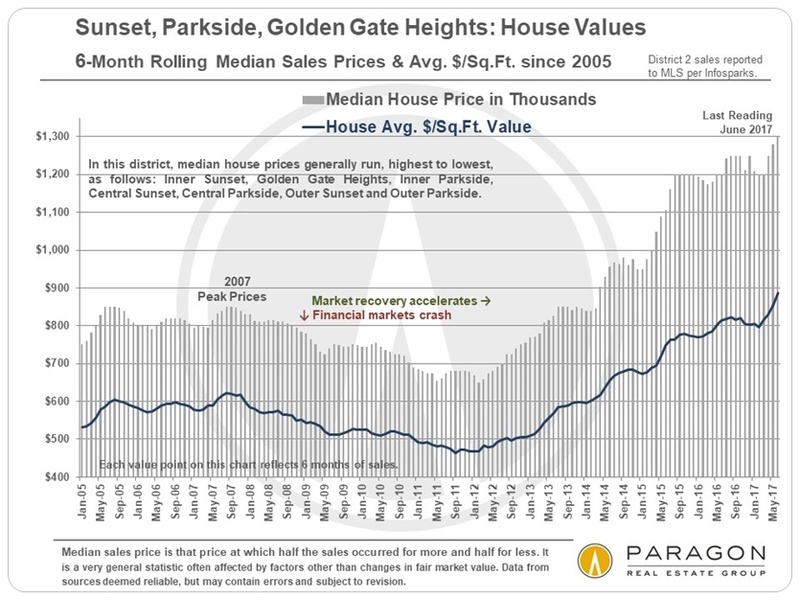 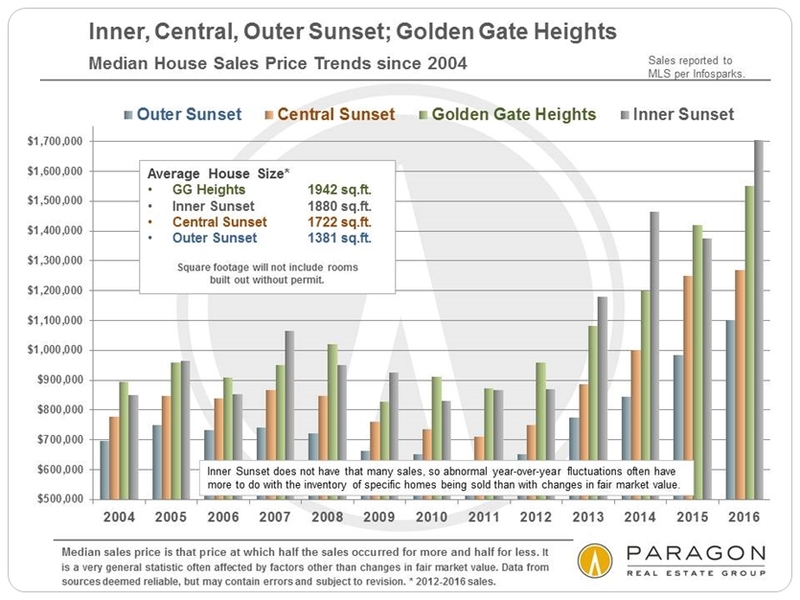 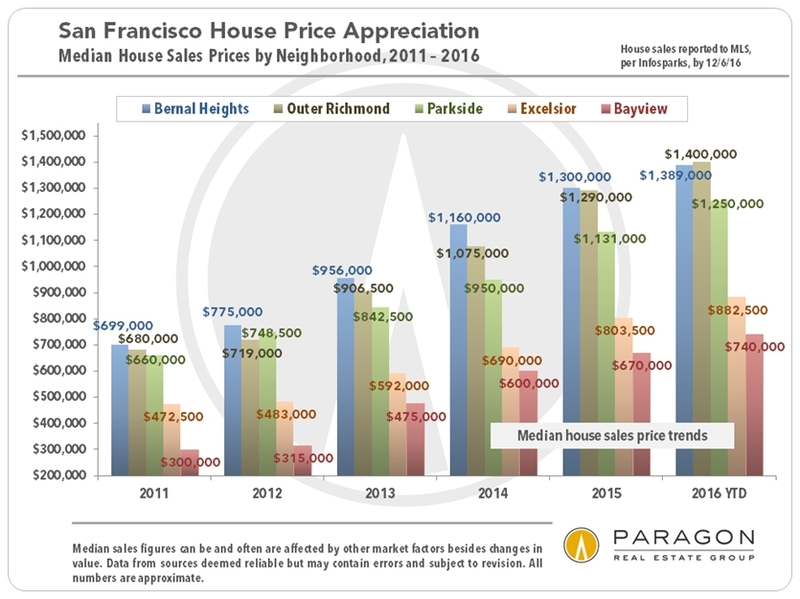 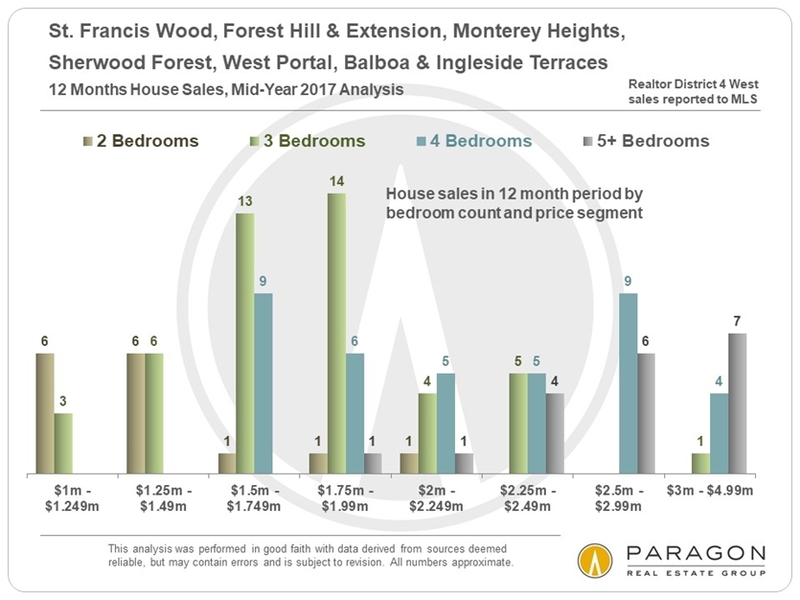 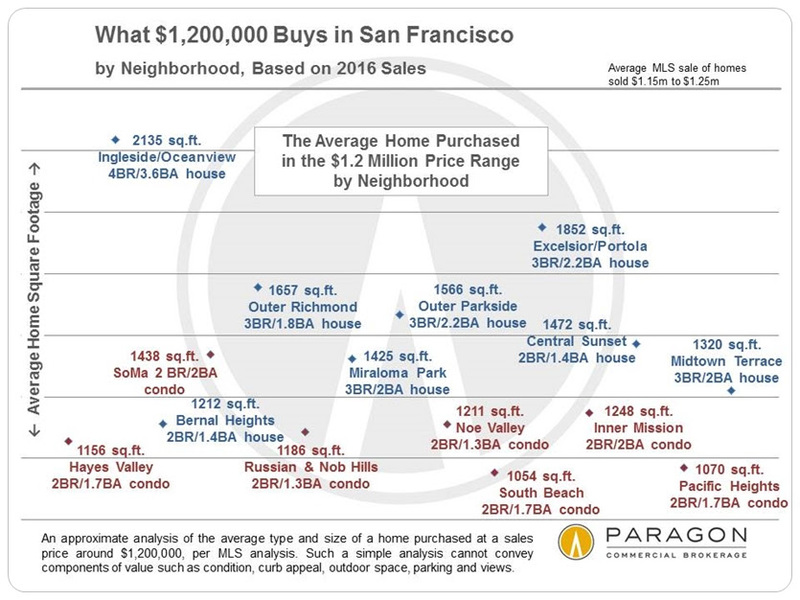 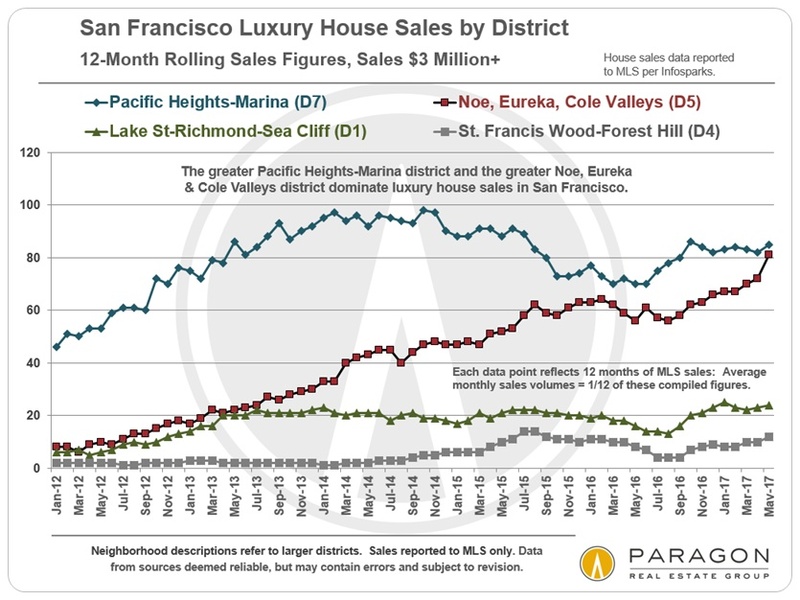 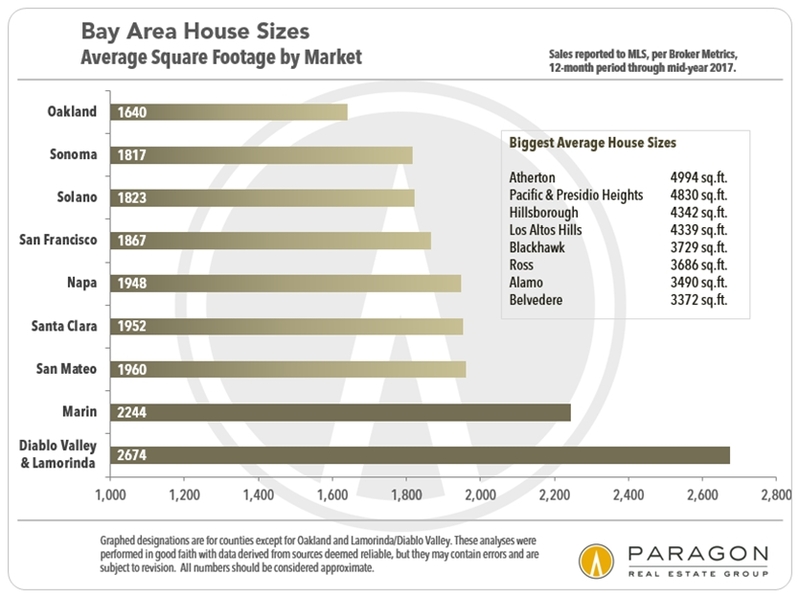 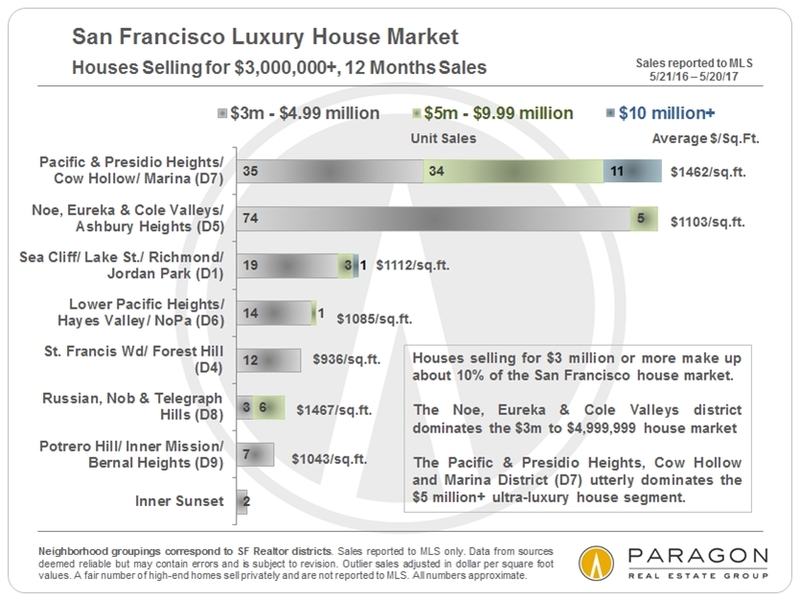 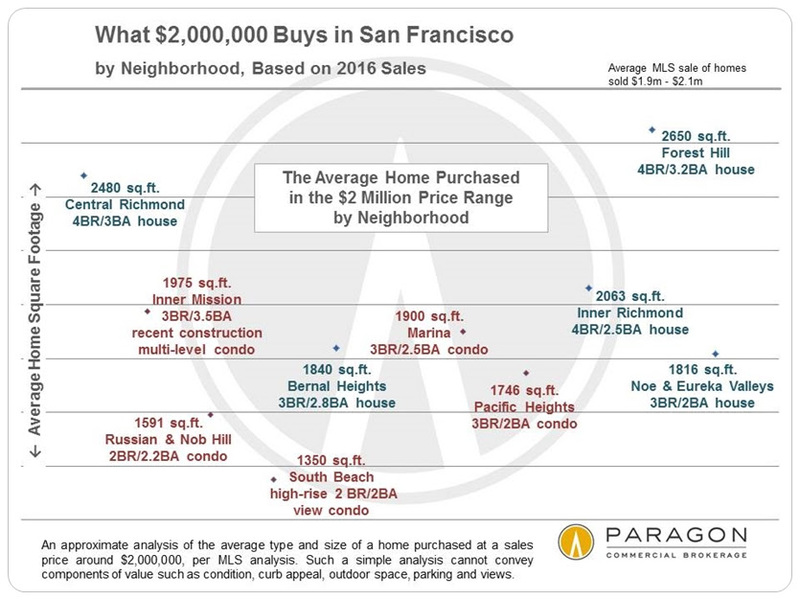 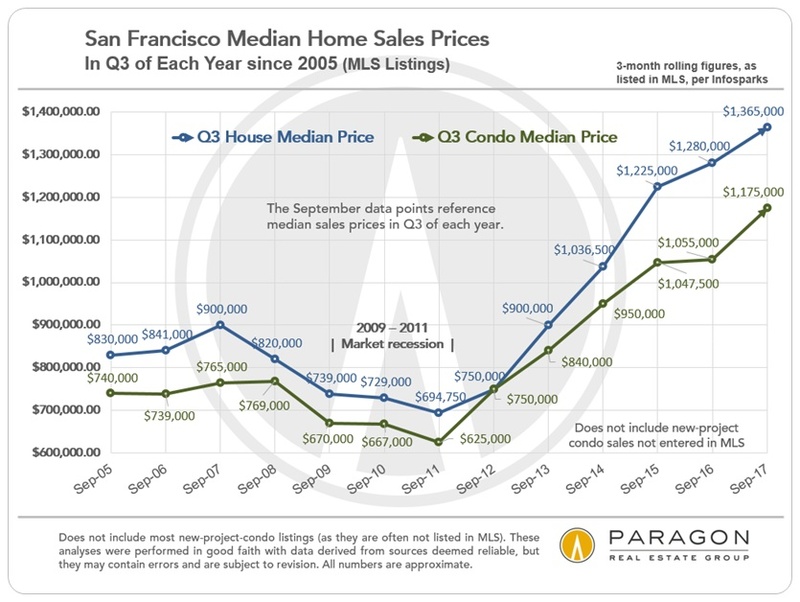 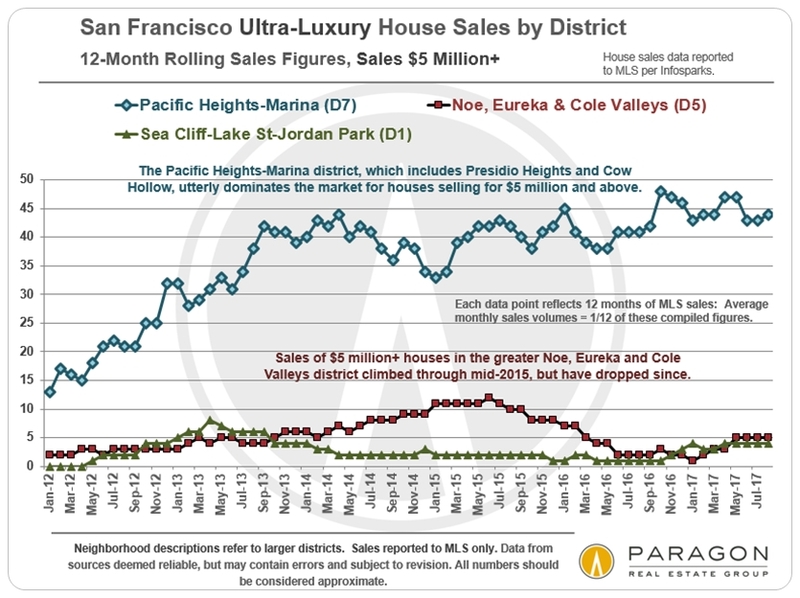 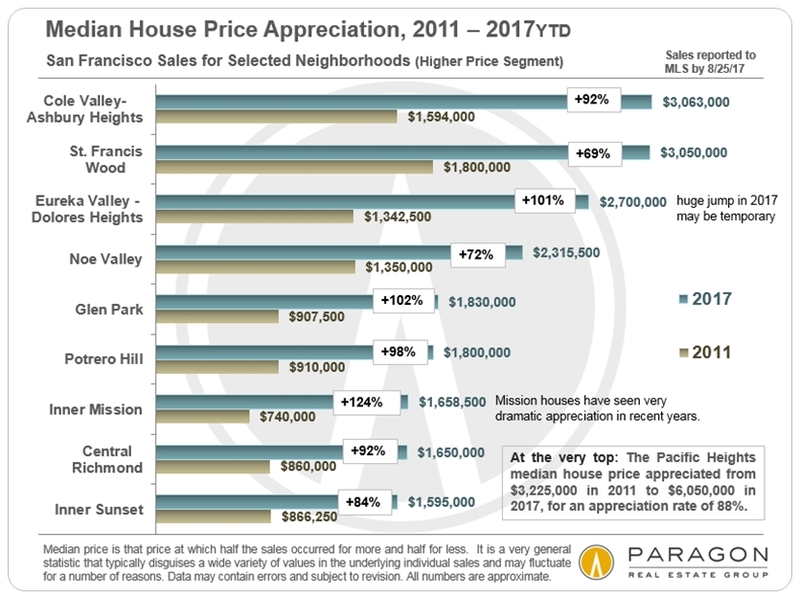 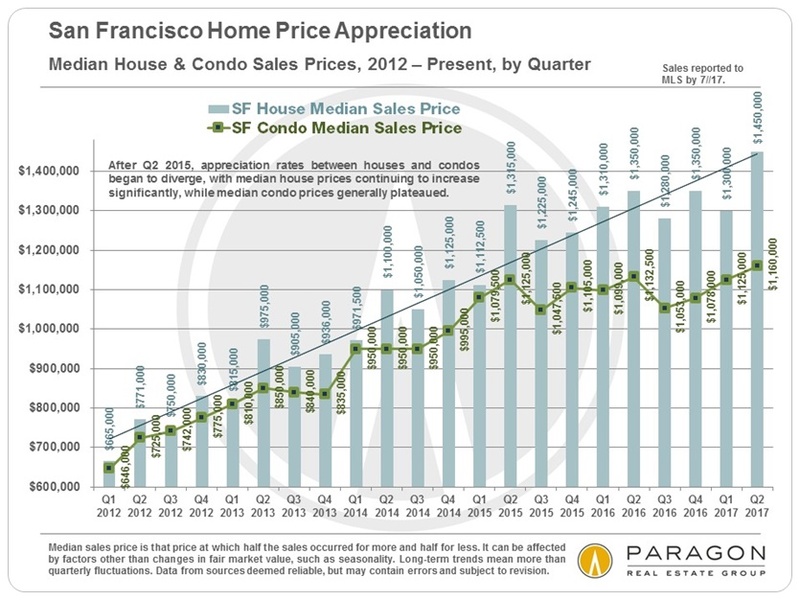 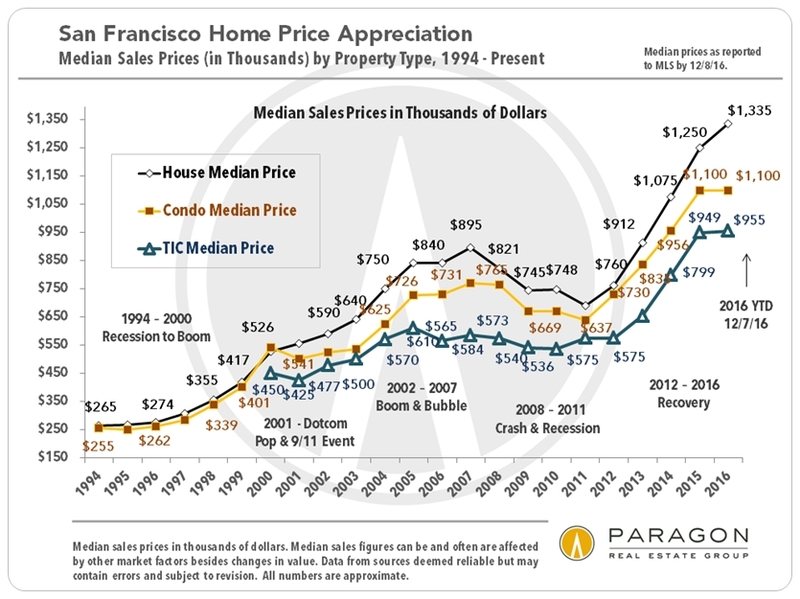 A full-on, panoramic view of the GG Bridge from Pacific Heights adds over $1 million to the median house price there. 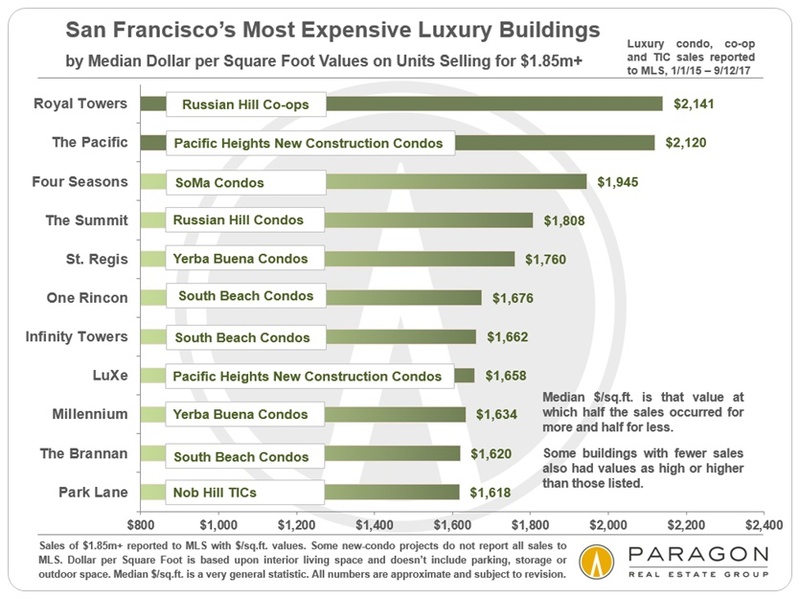 Unsurprisingly, condos have the most, and most spectacular, views due to high-rise condo projects. 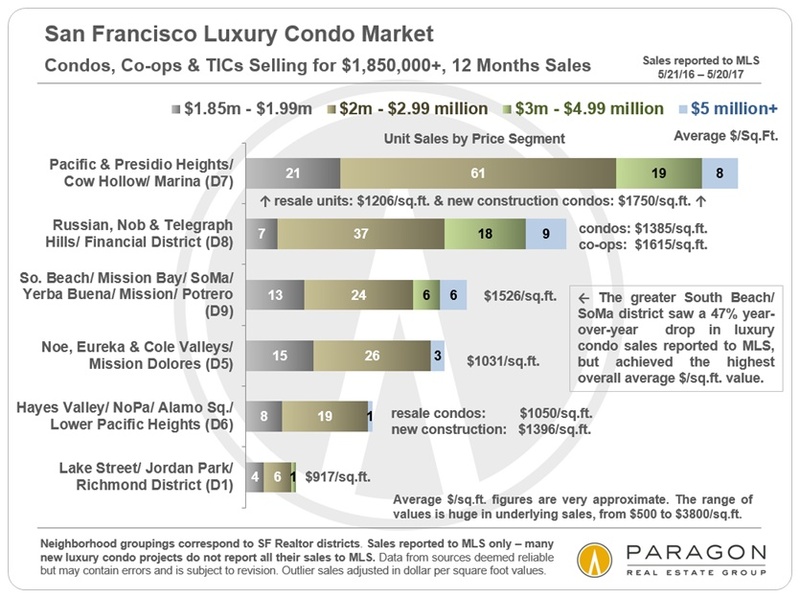 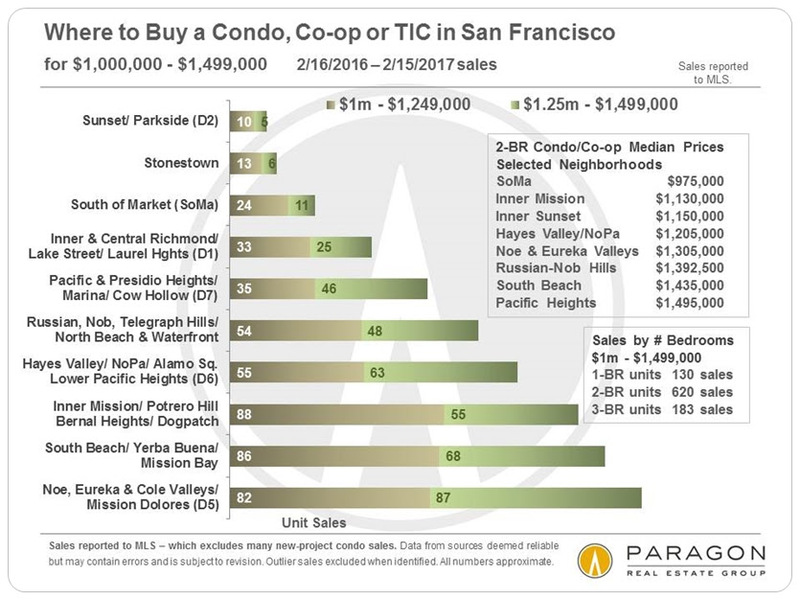 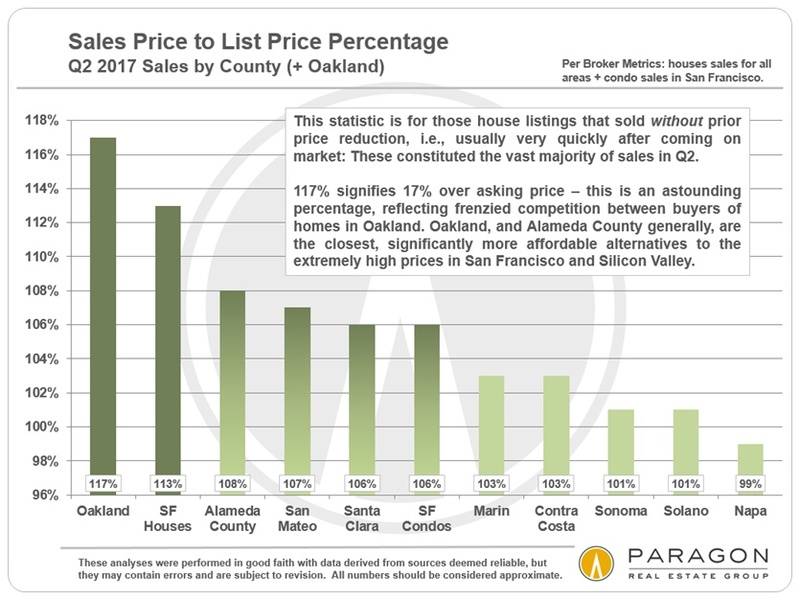 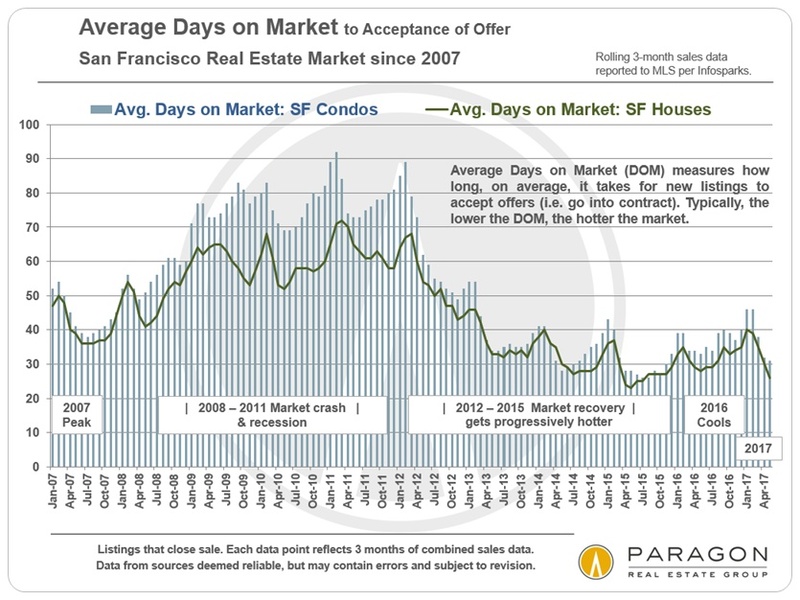 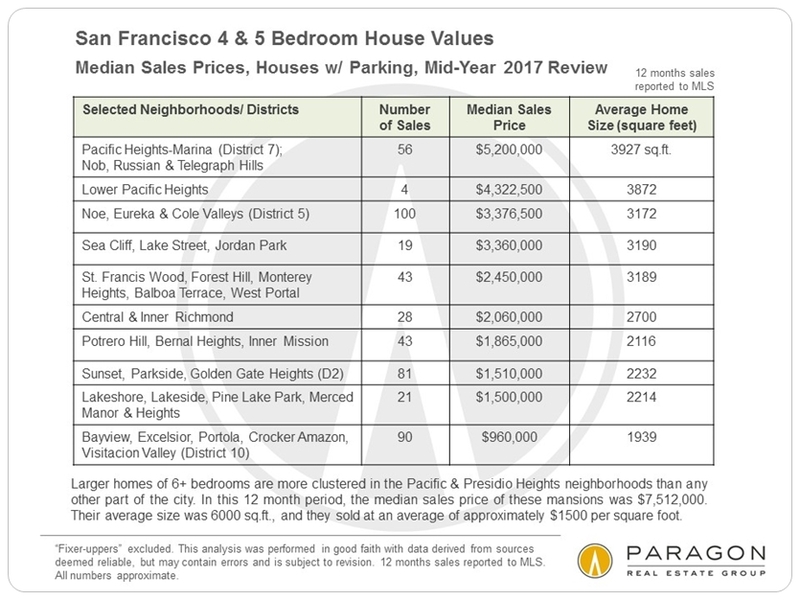 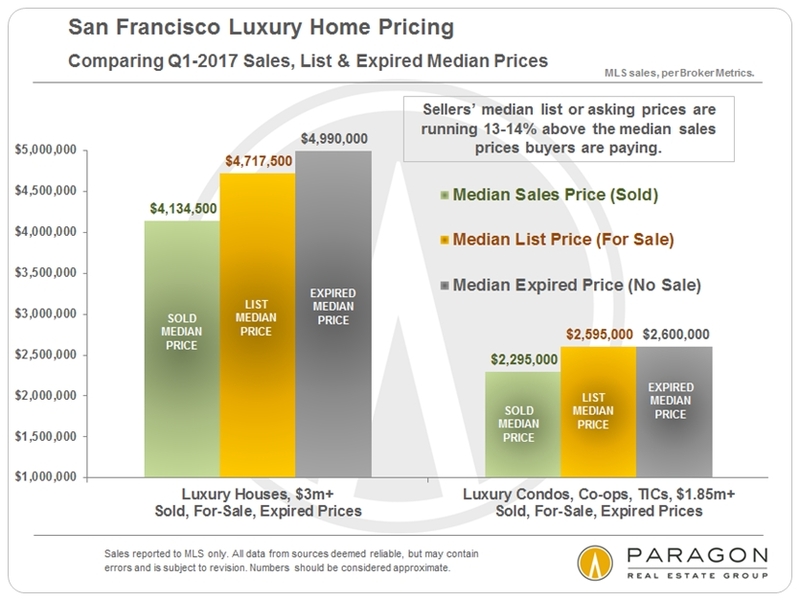 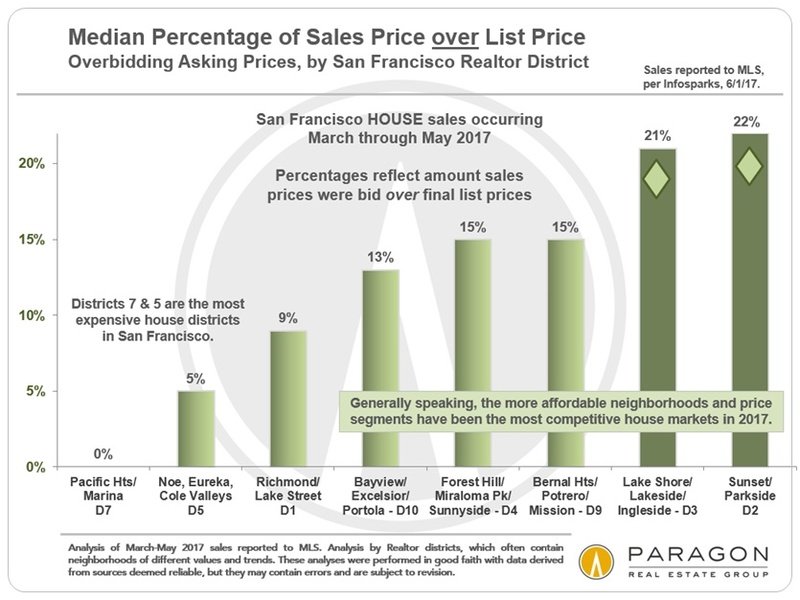 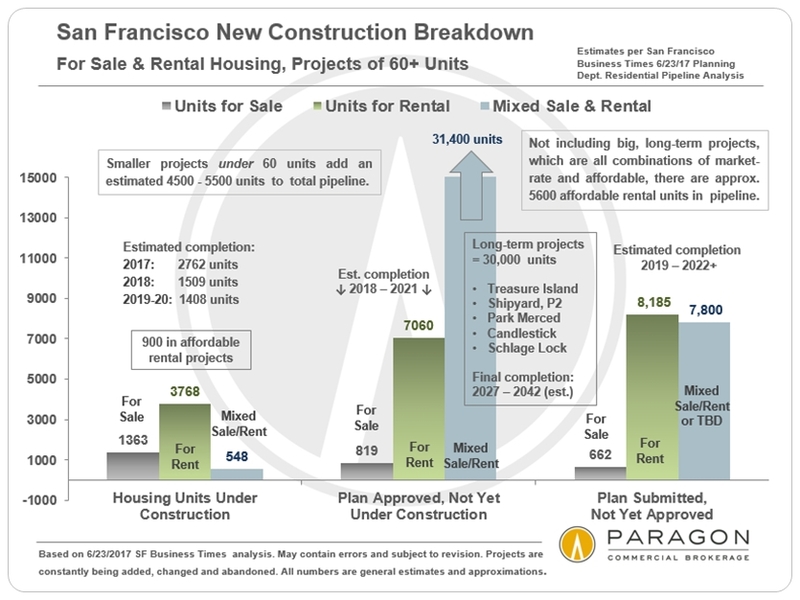 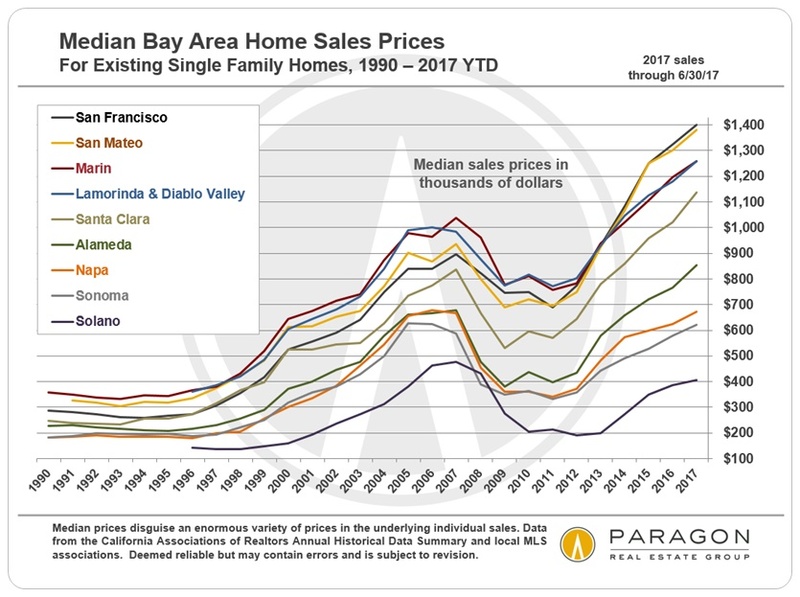 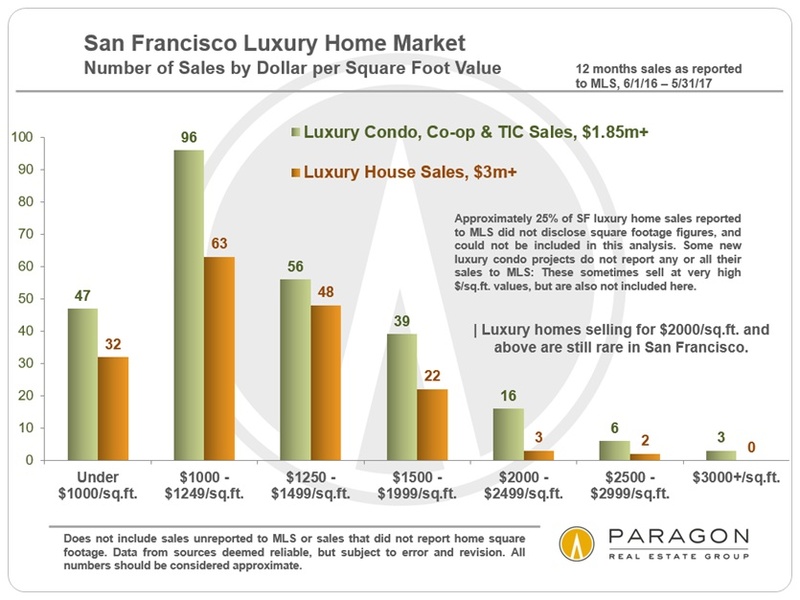 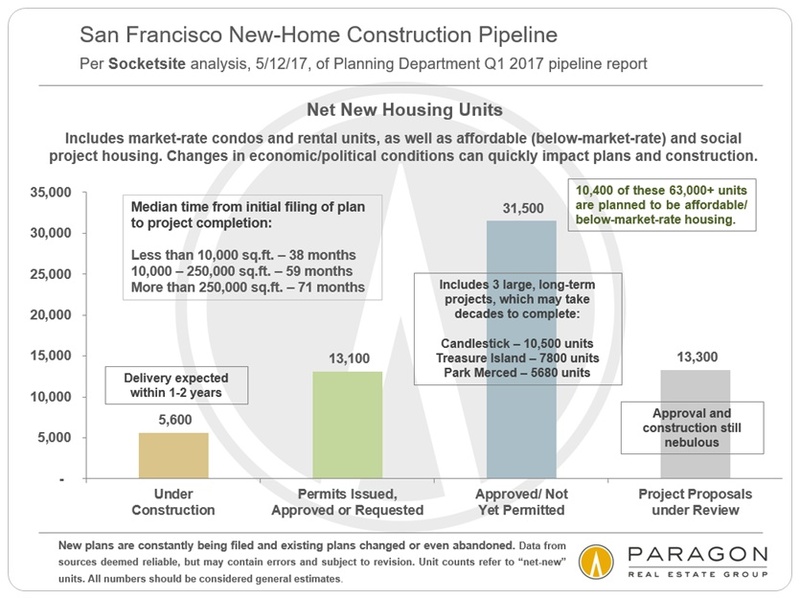 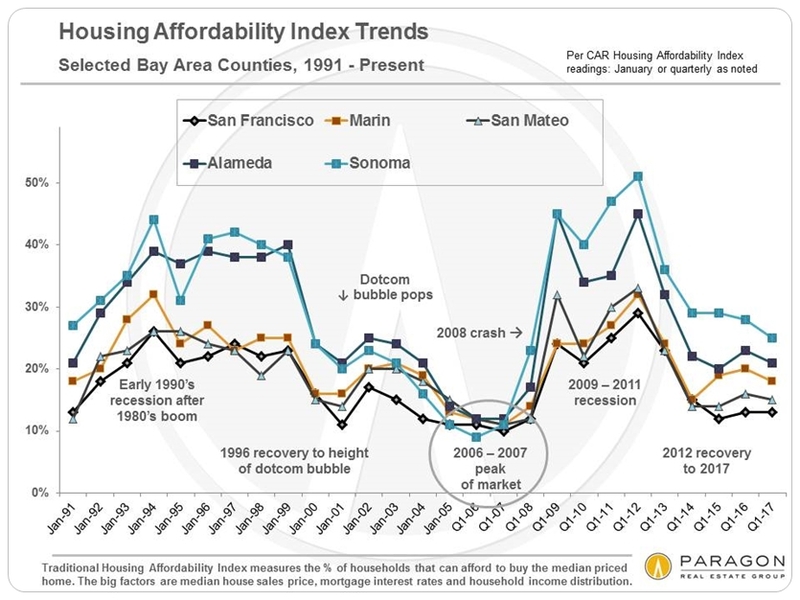 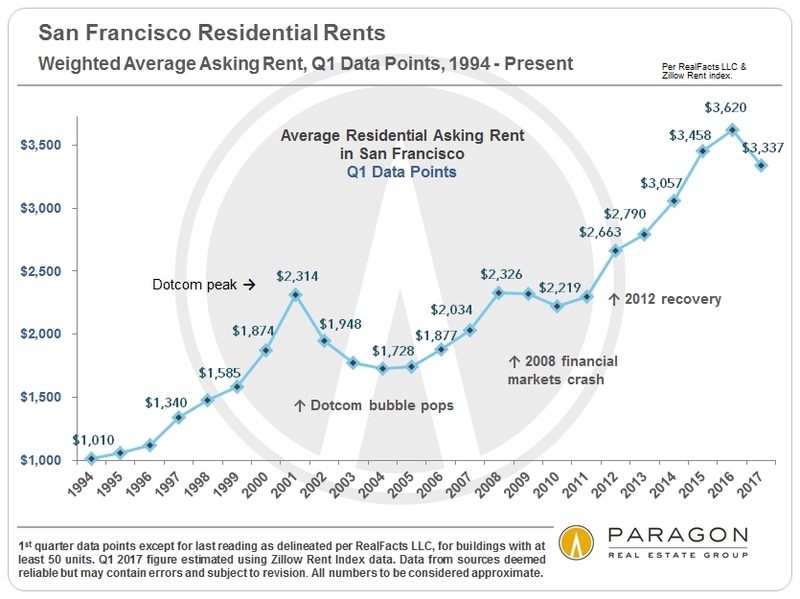 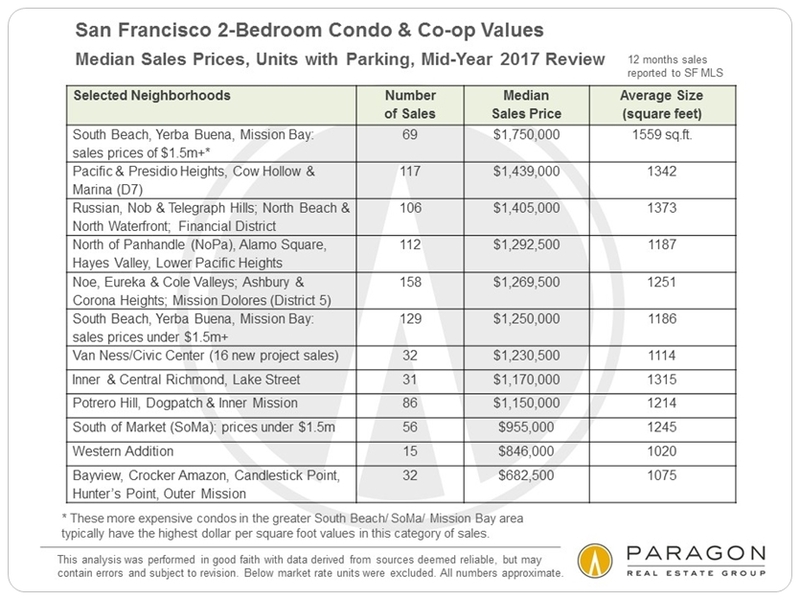 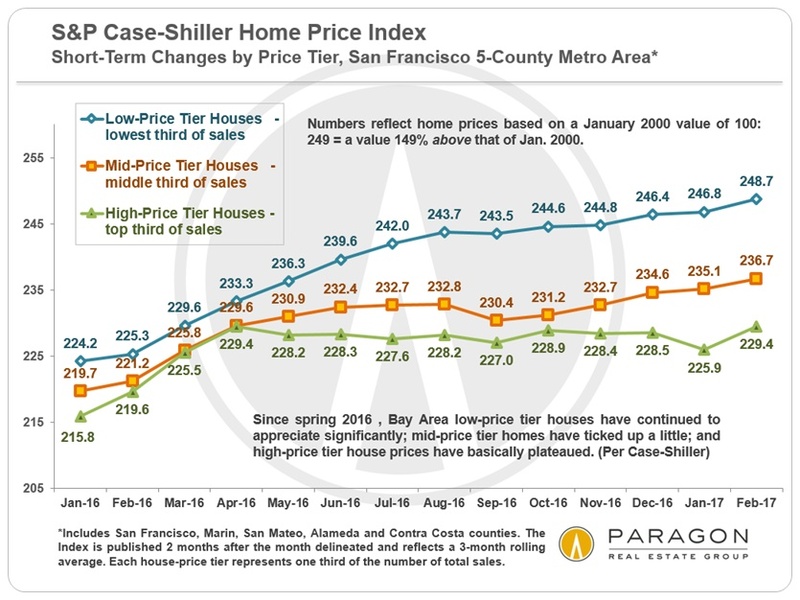 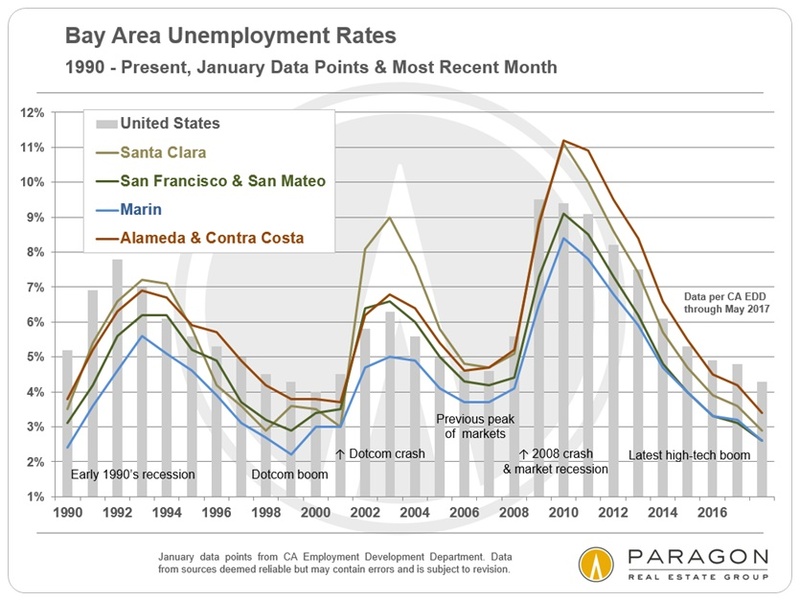 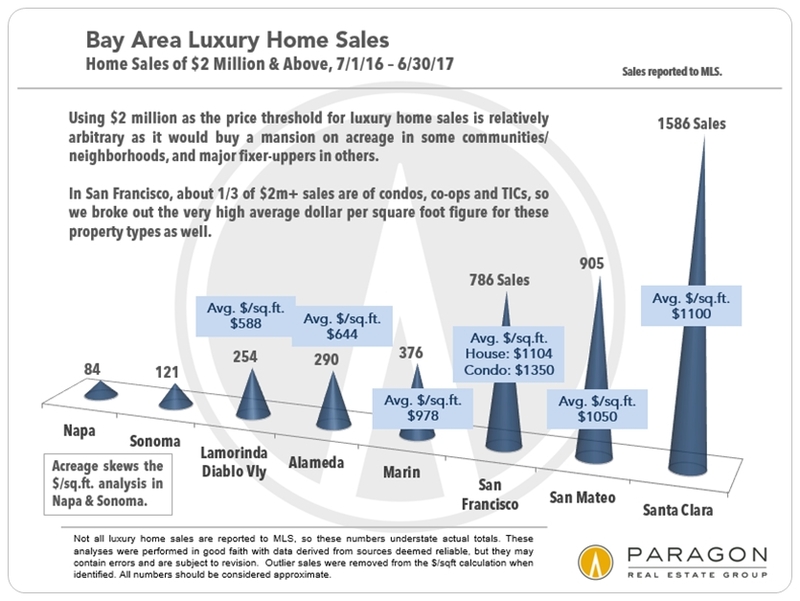 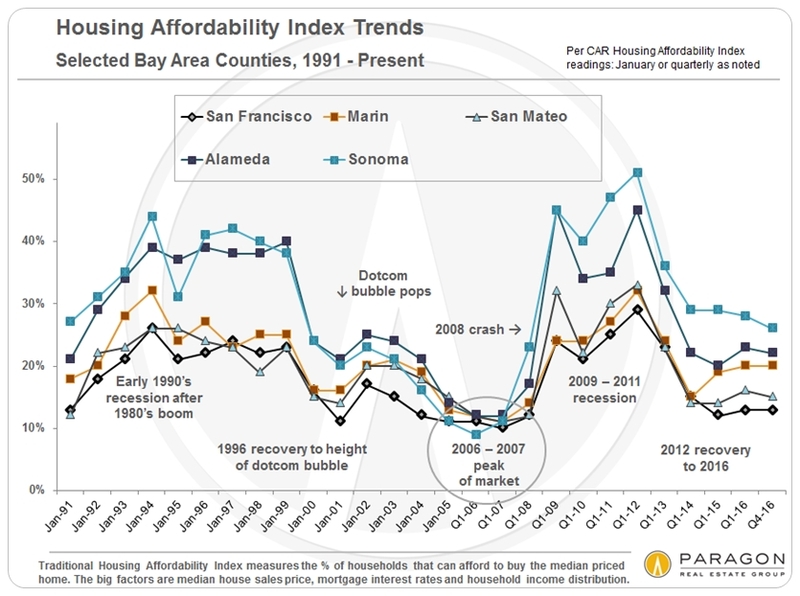 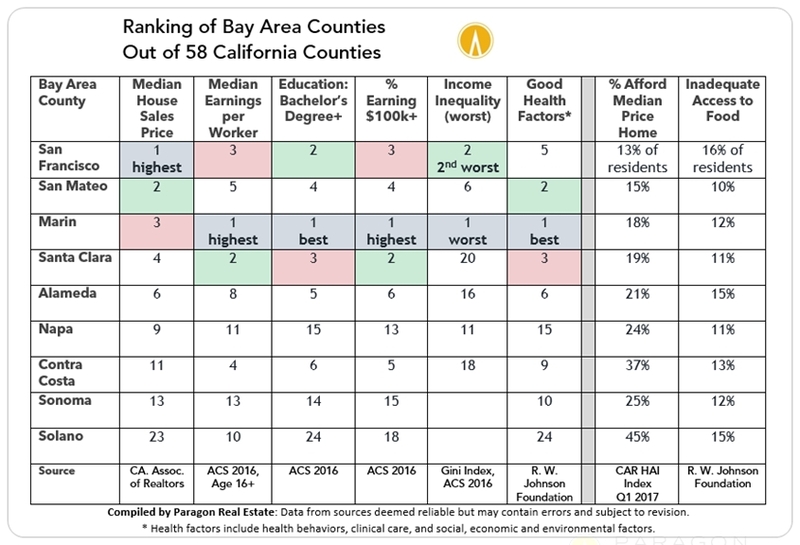 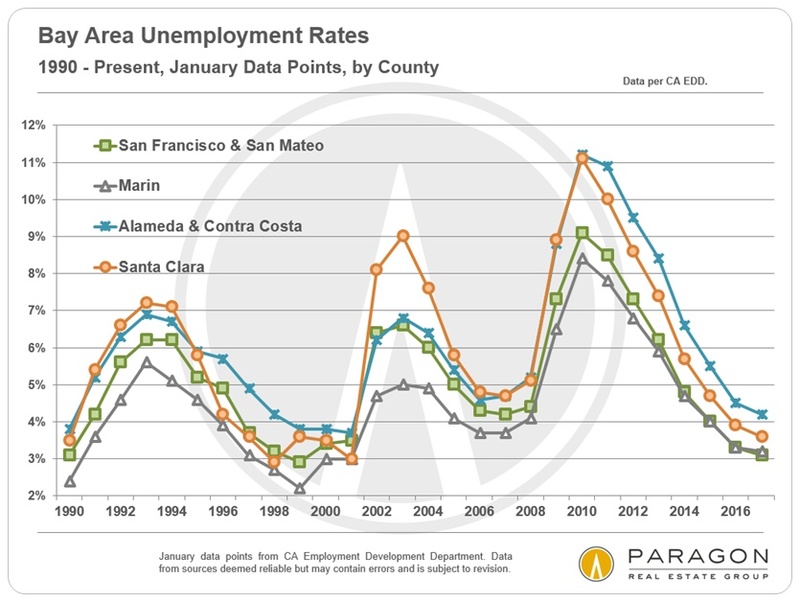 Comparing the purchase, with 20% down, of a 2-bedroom/2-bath condo with the rental of a comparable apartment in San Francisco. 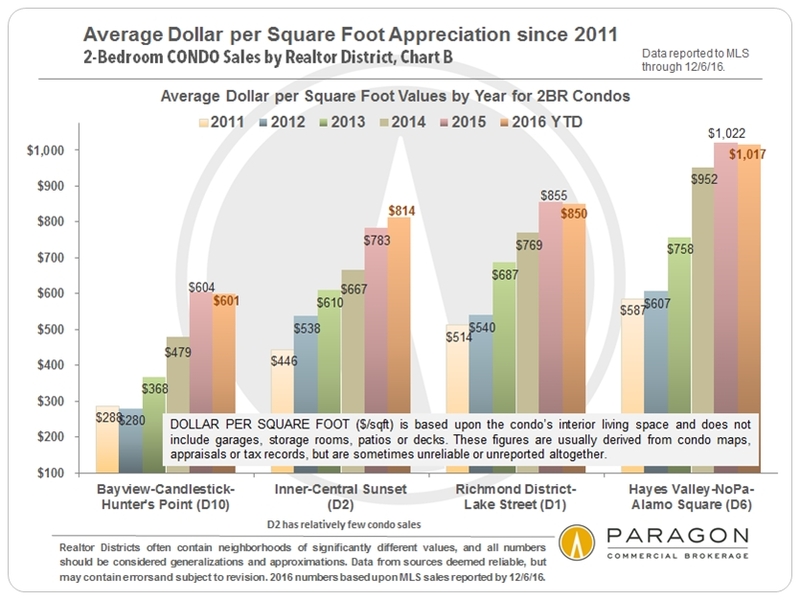 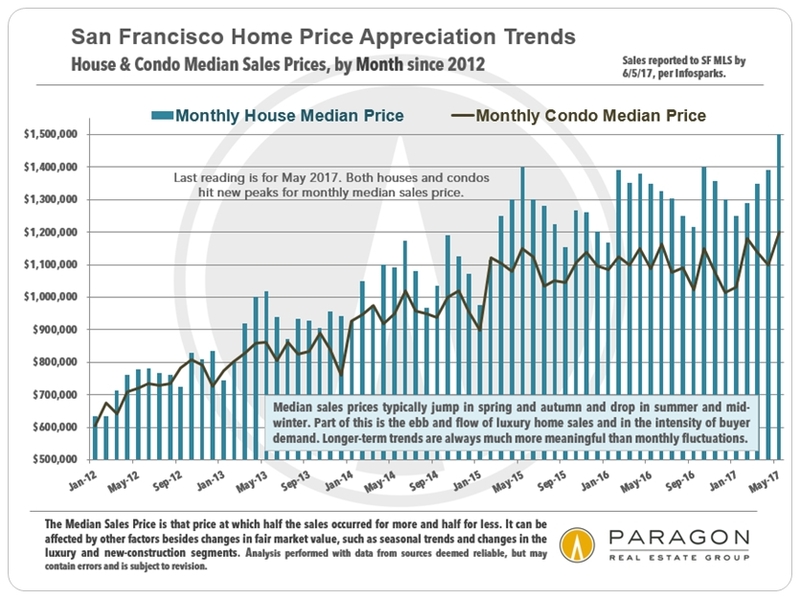 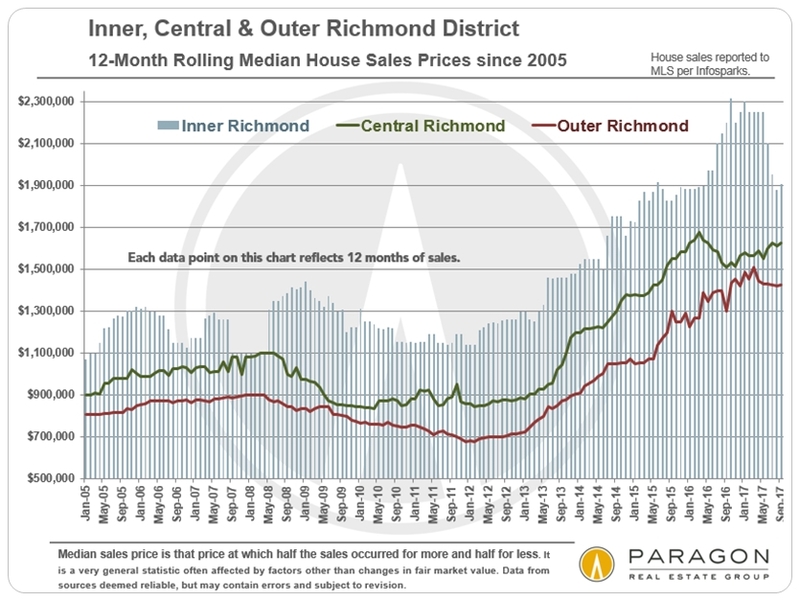 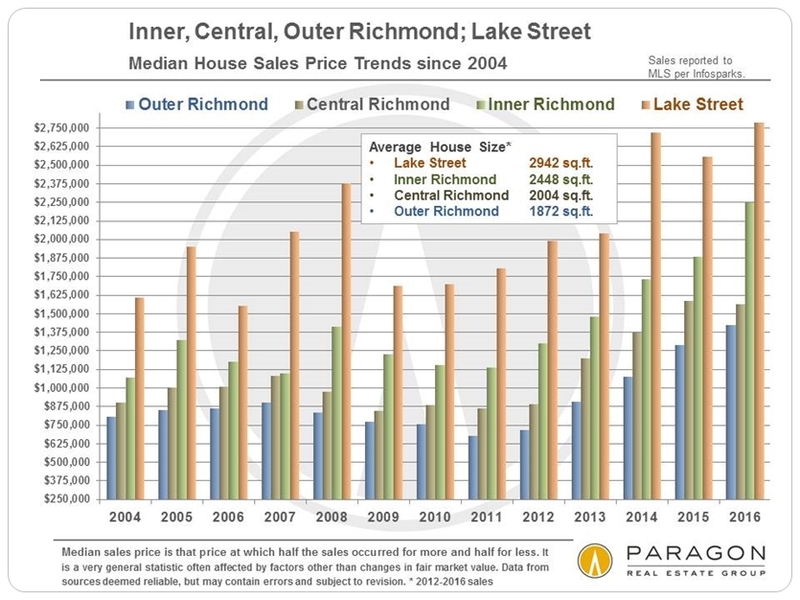 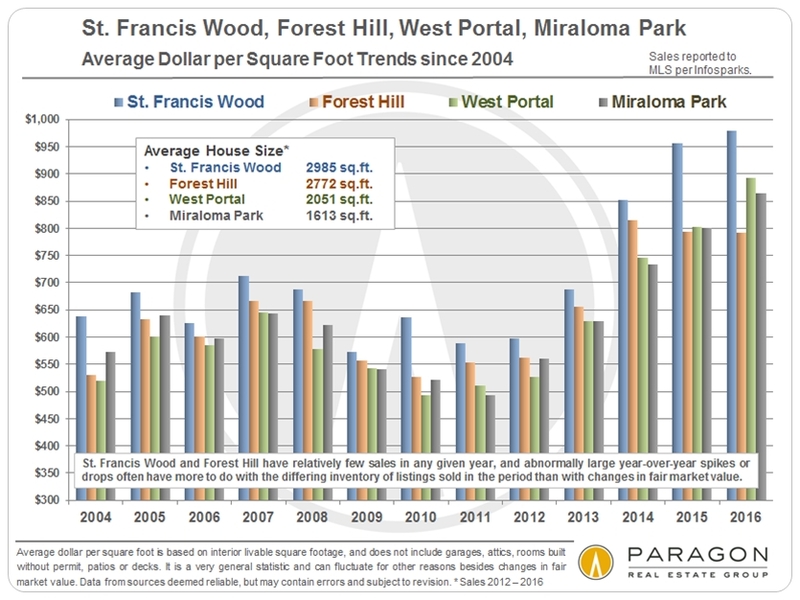 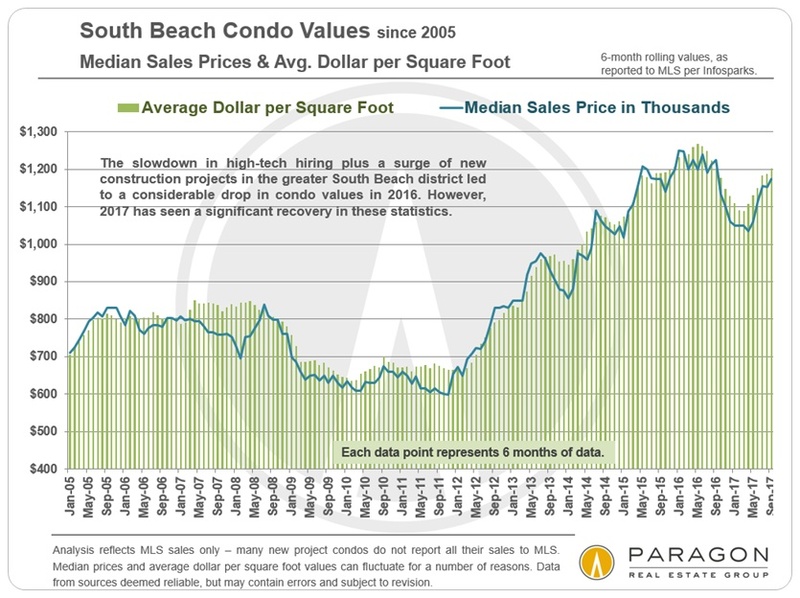 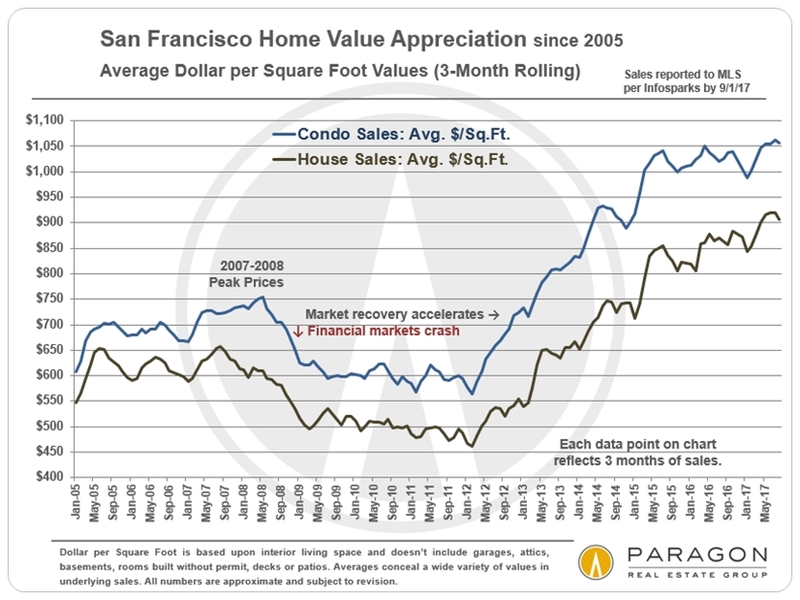 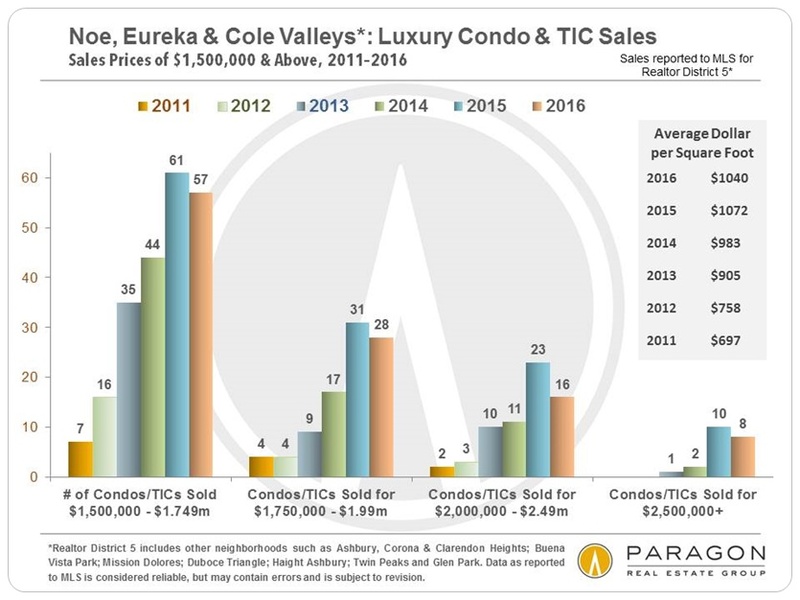 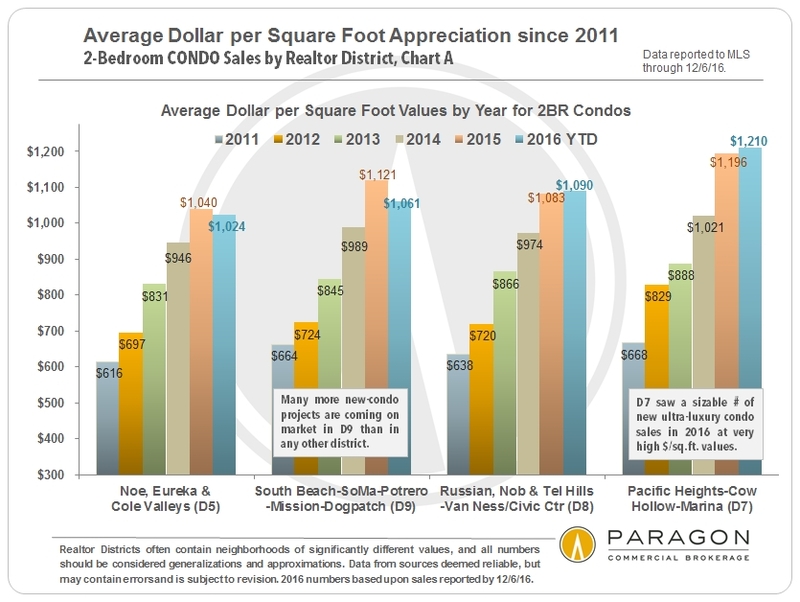 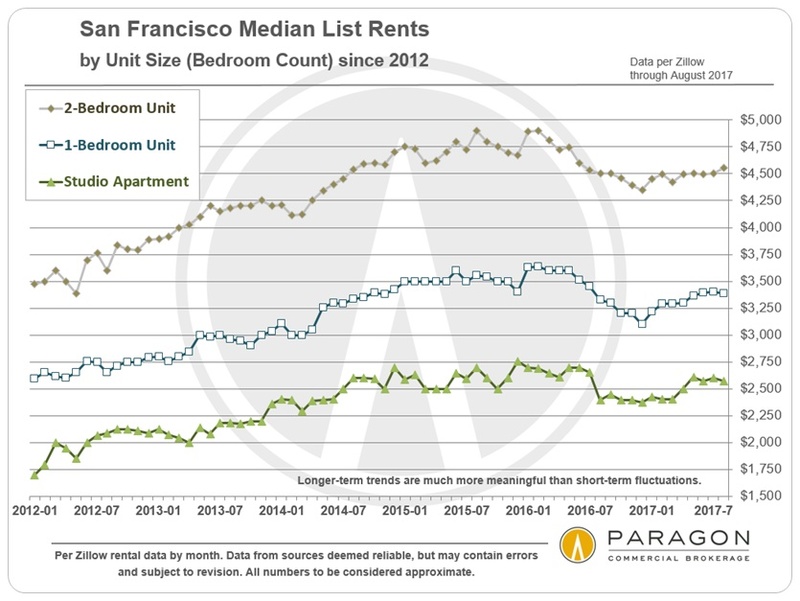 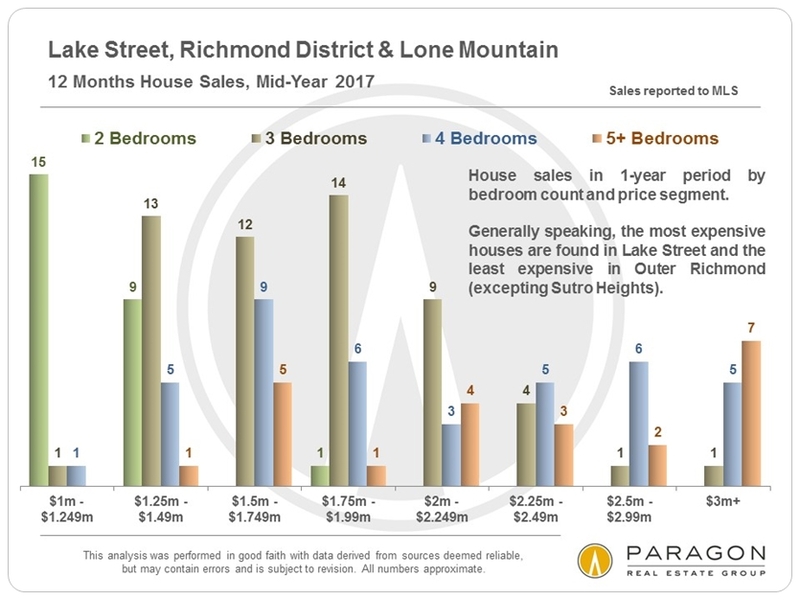 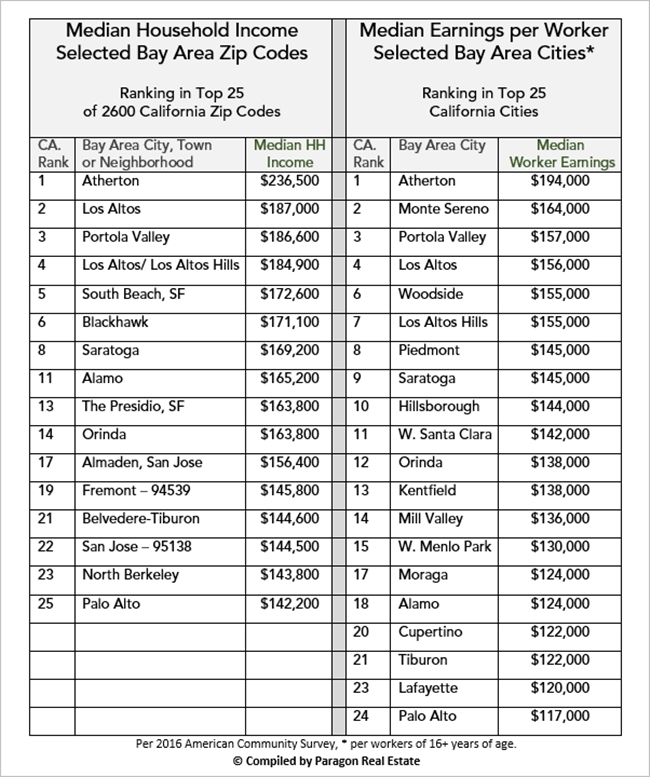 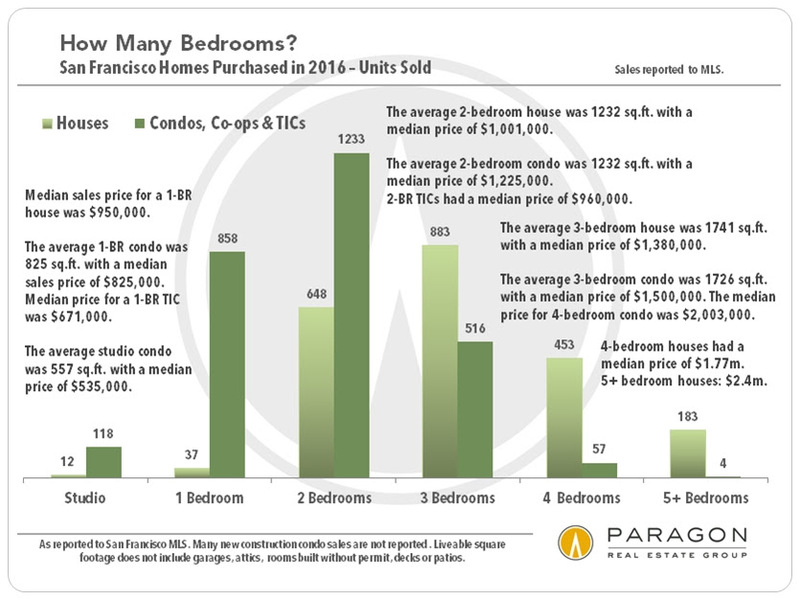 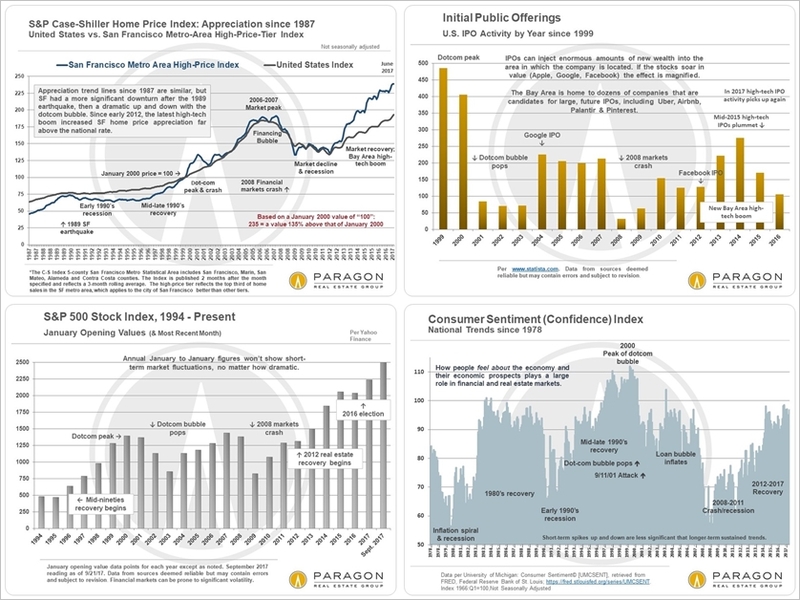 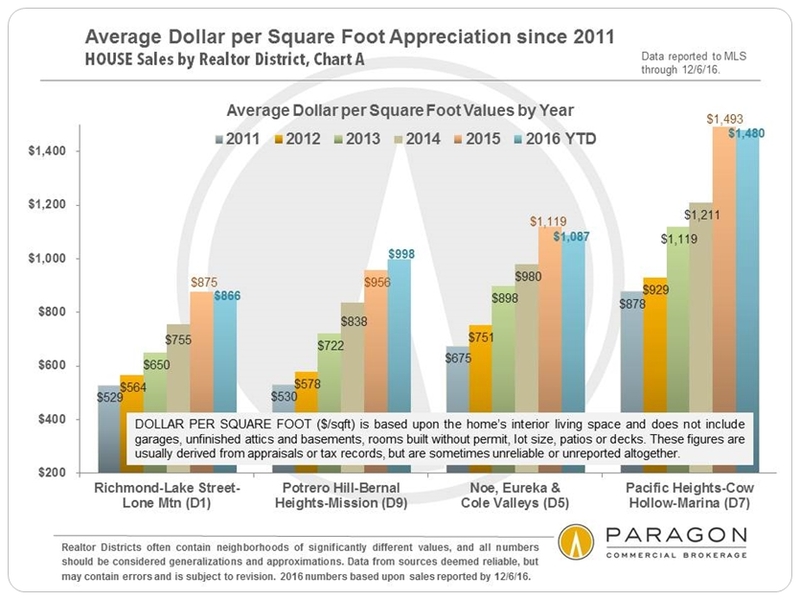 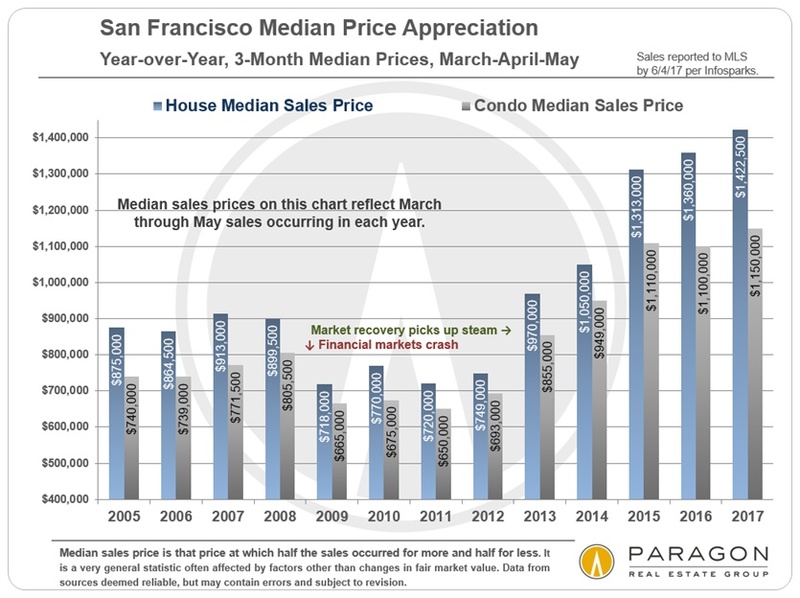 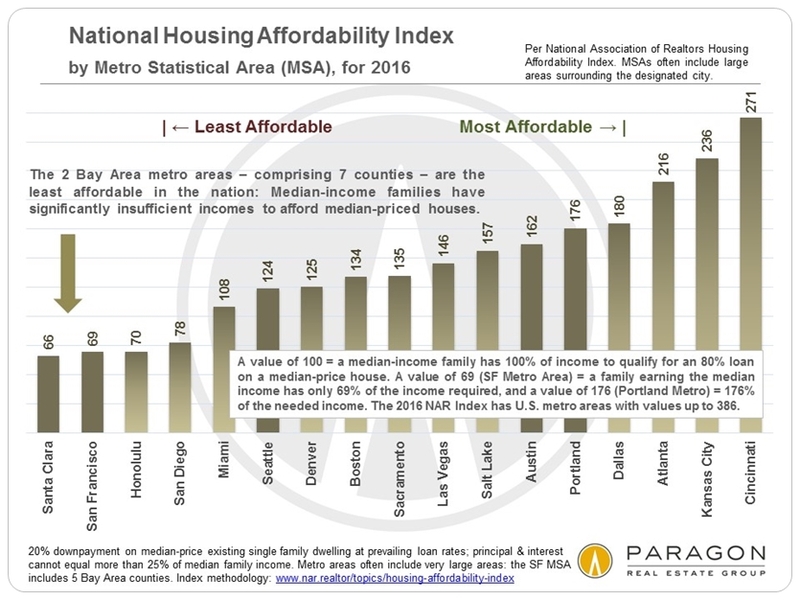 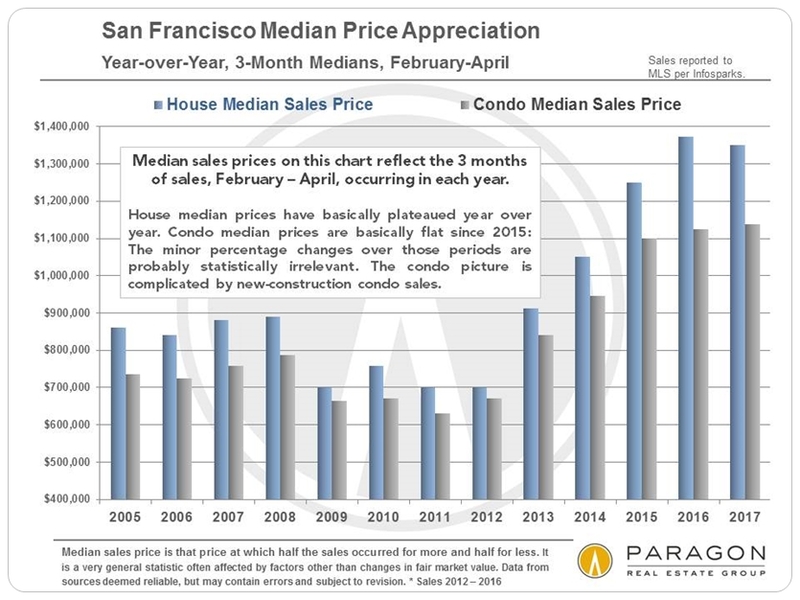 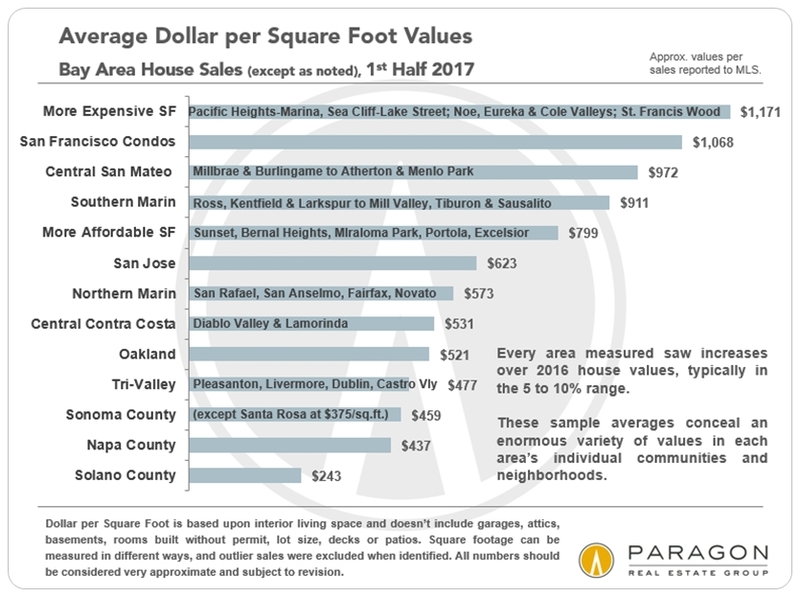 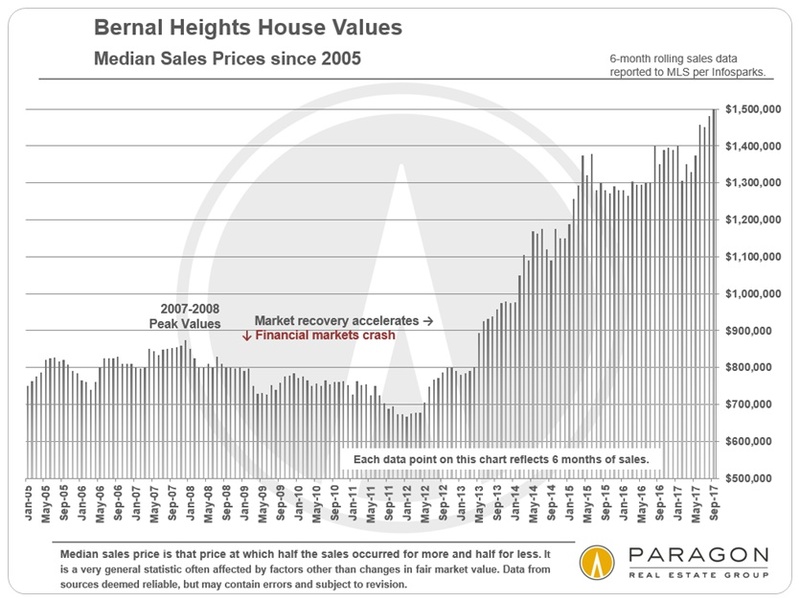 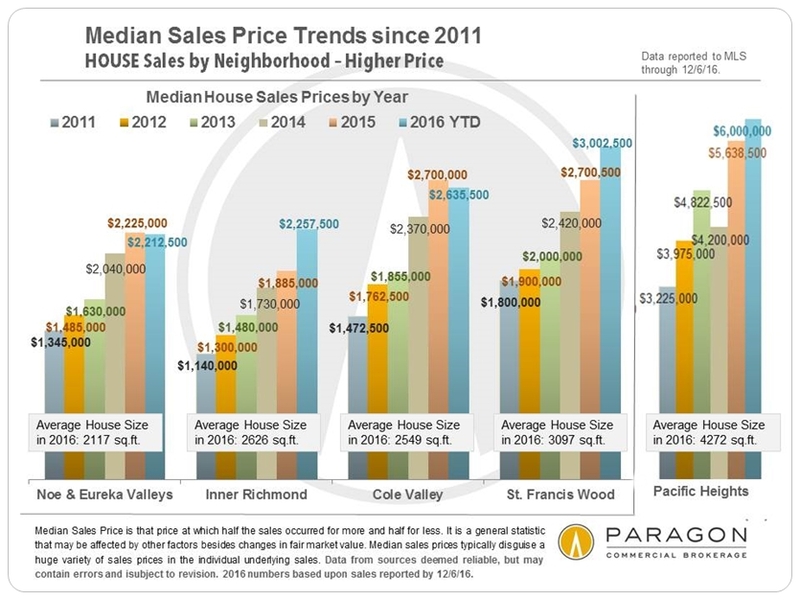 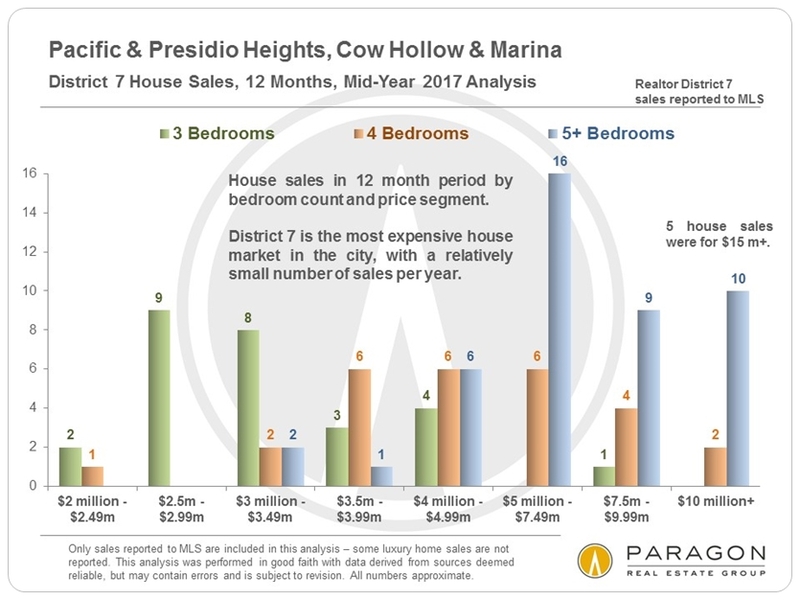 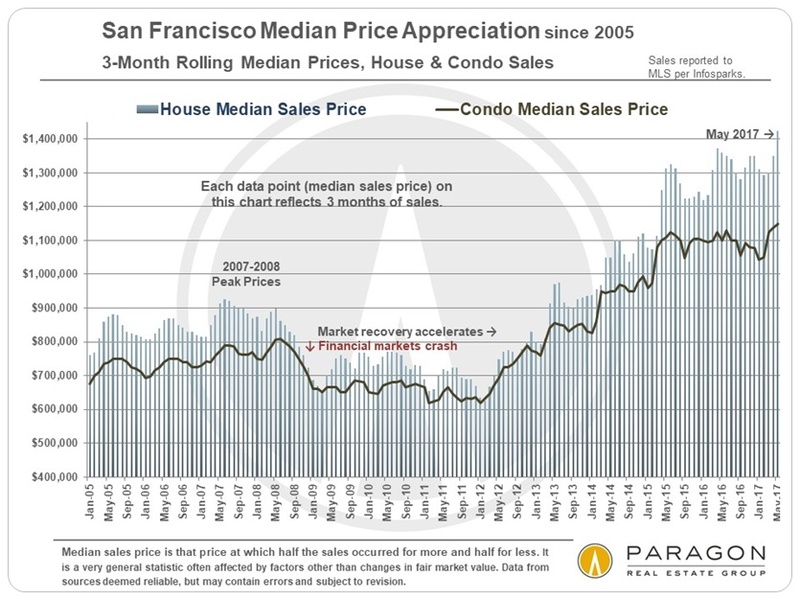 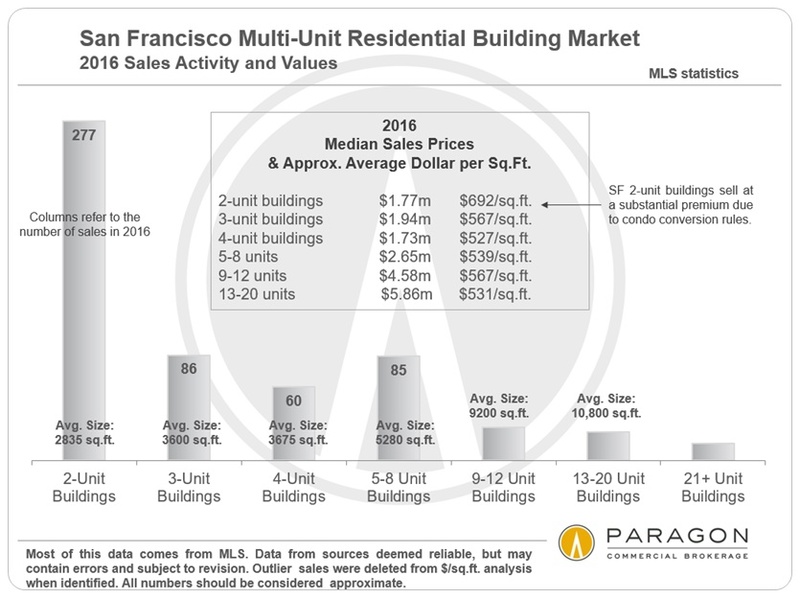 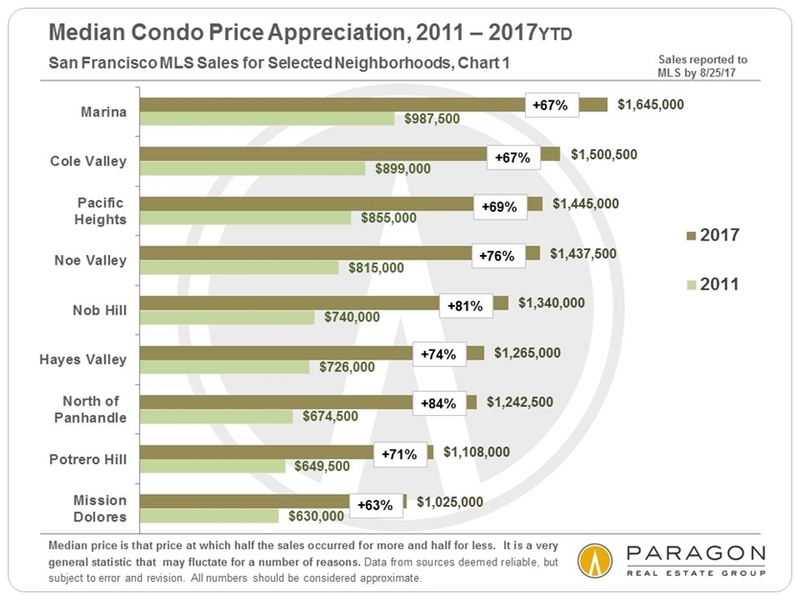 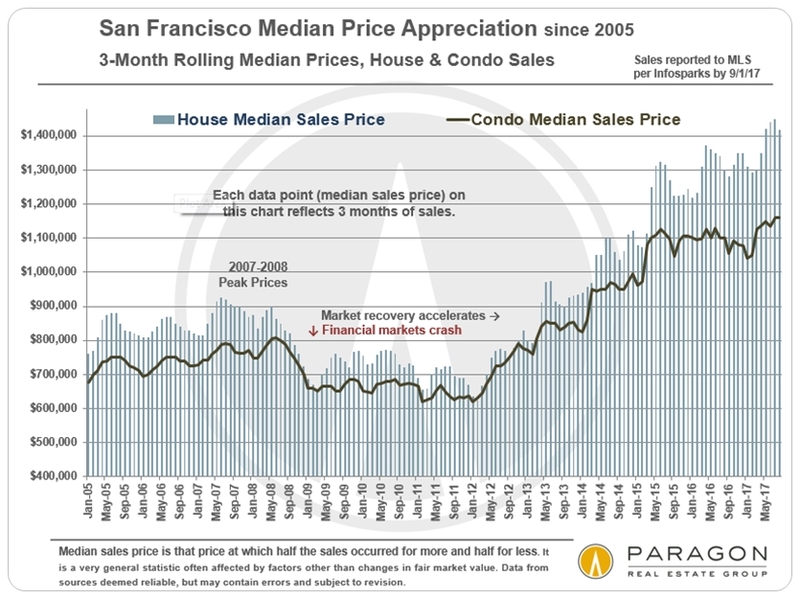 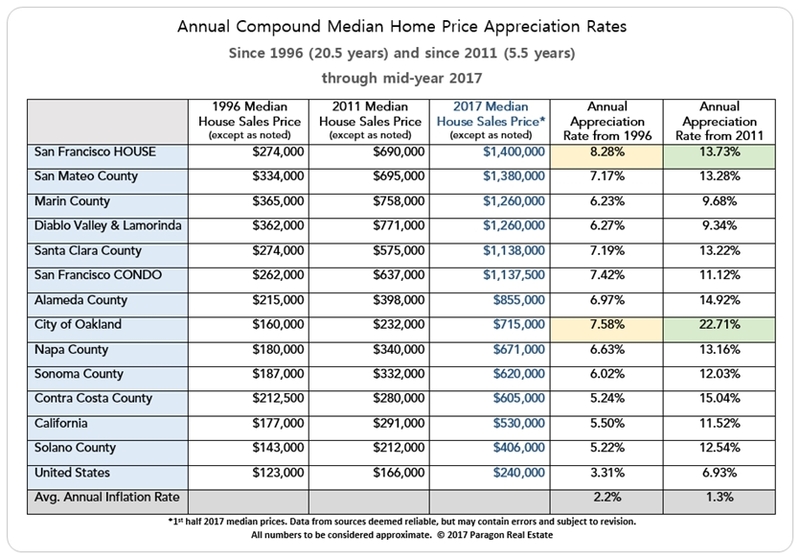 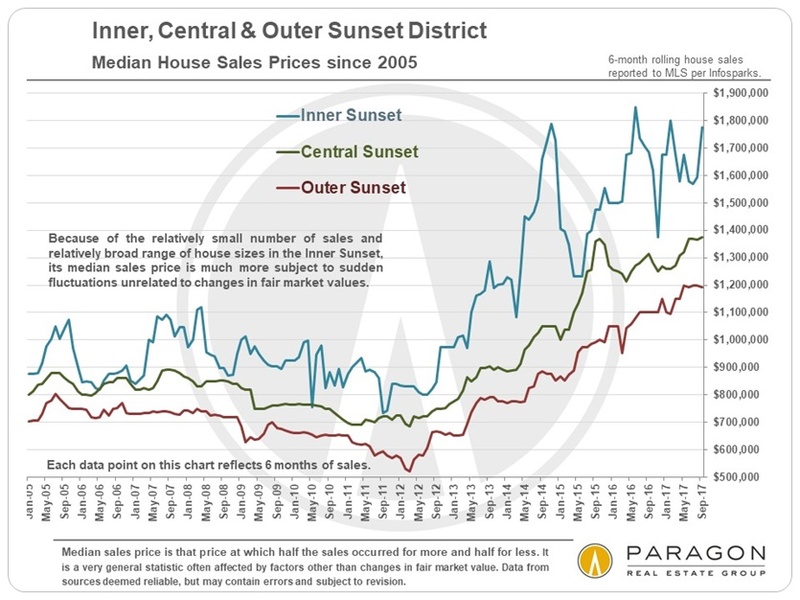 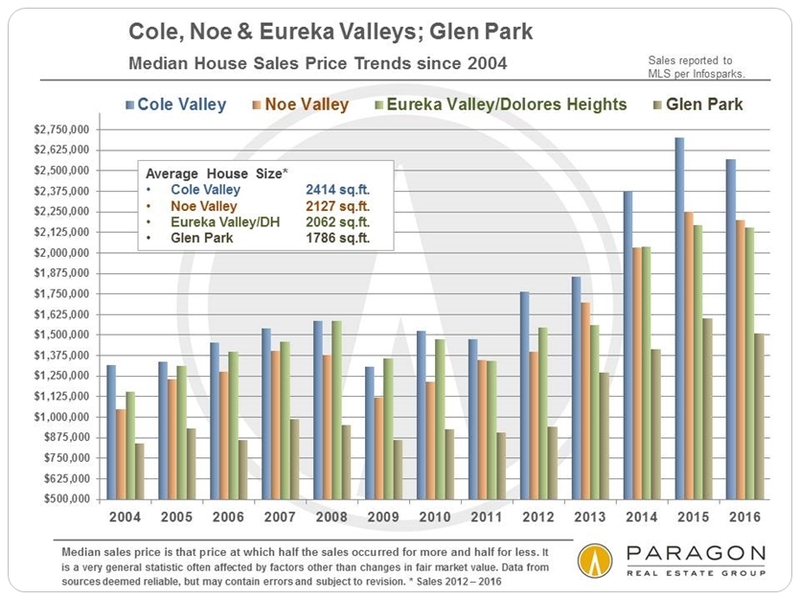 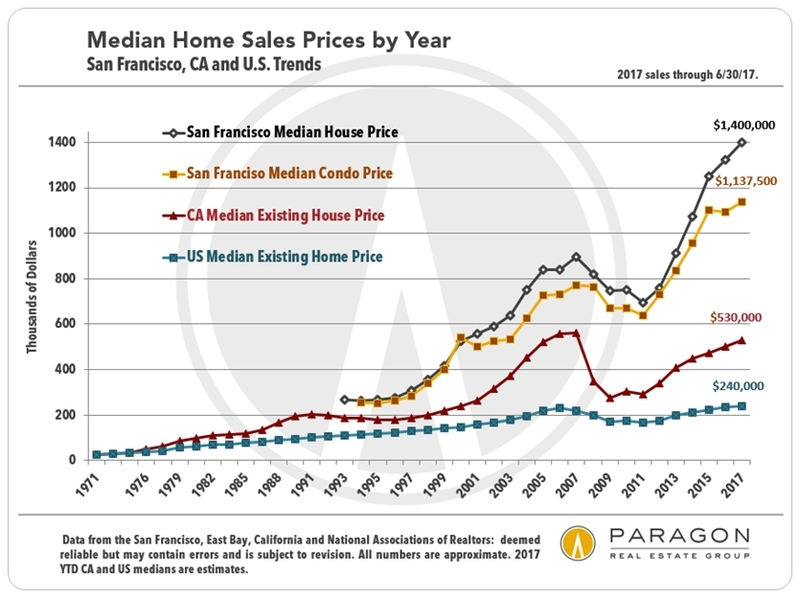 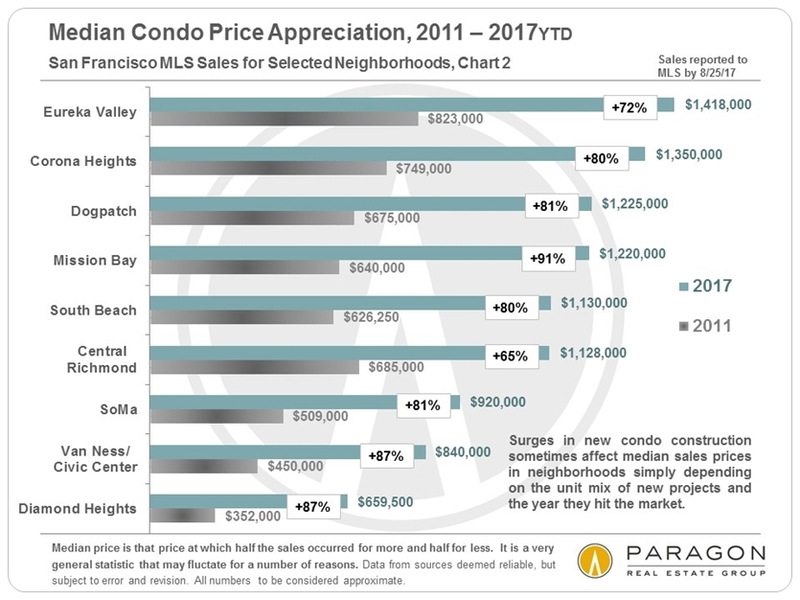 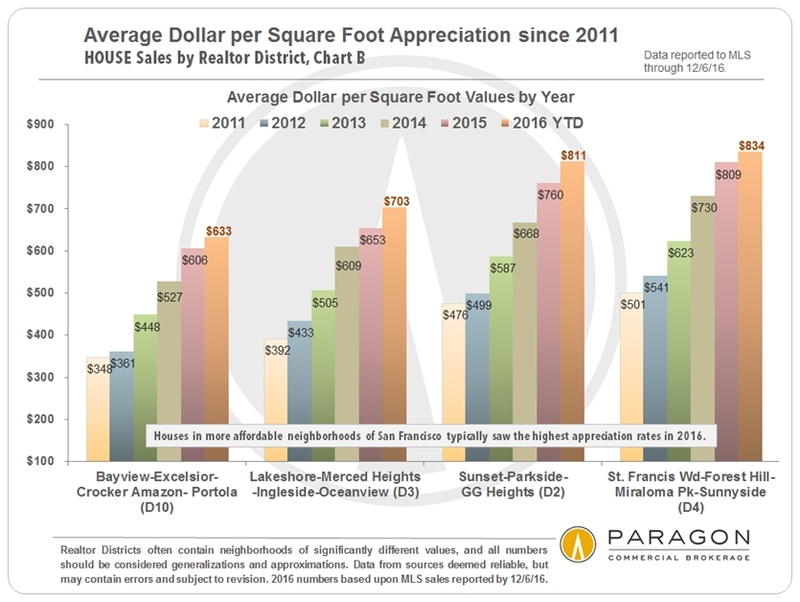 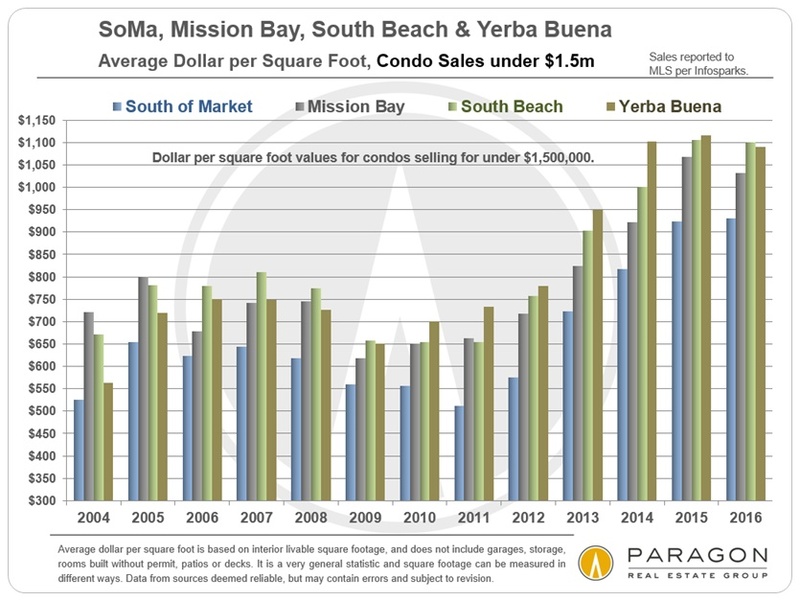 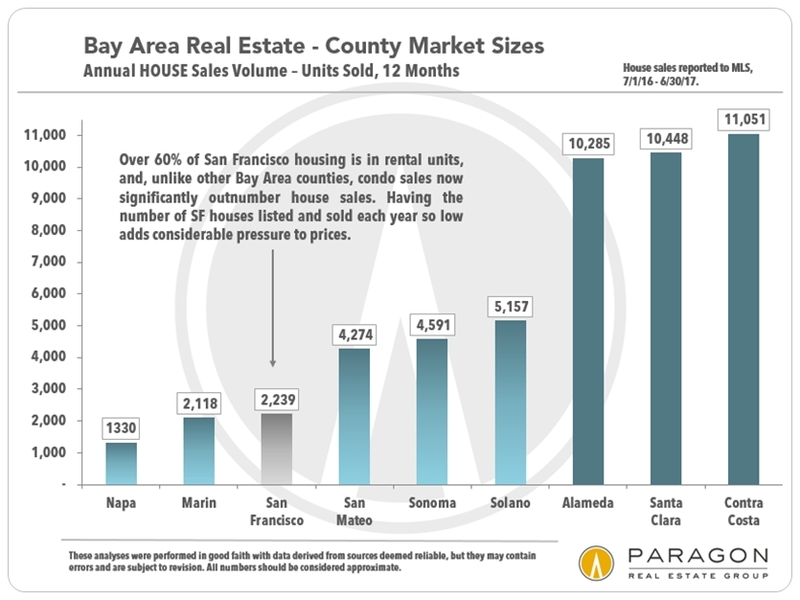 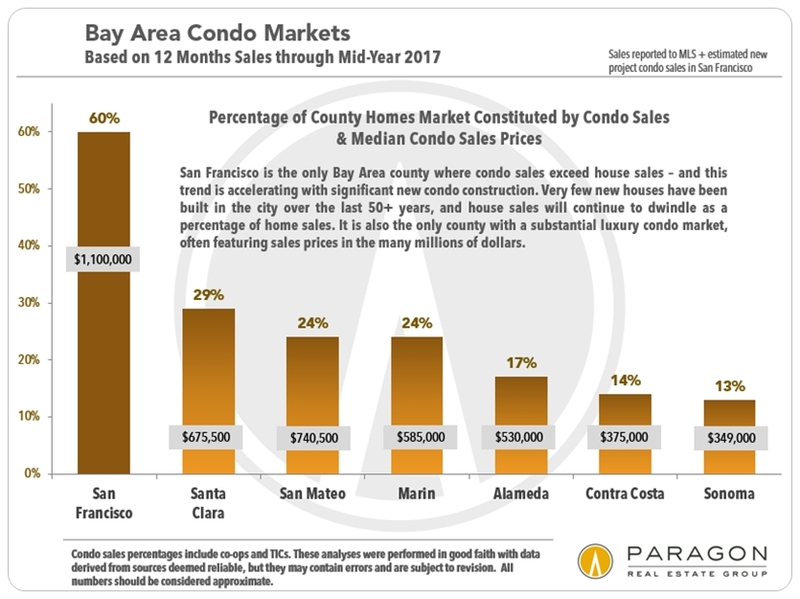 Every year or so, we like to update this analysis using current median sales prices and average rents for comparable 2-bedroom condos and apartments. 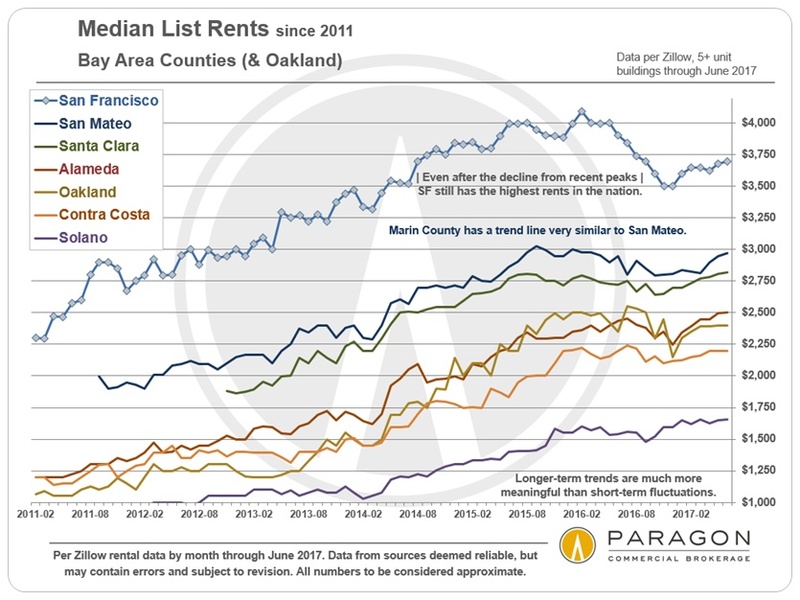 Rent vs. buy calculations can be performed a wide variety of ways, and results will depend on your own financial circumstances and economic projections, which you should review with your accountant. 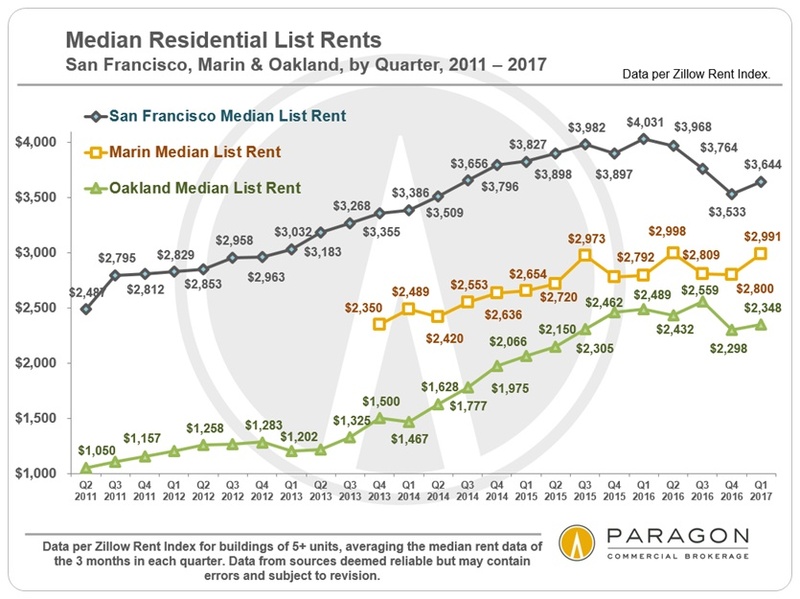 There is a versatile calculator published by The New York Times, where one can play with all the financial factors involved: NYT Rent vs. Buy Calculator. 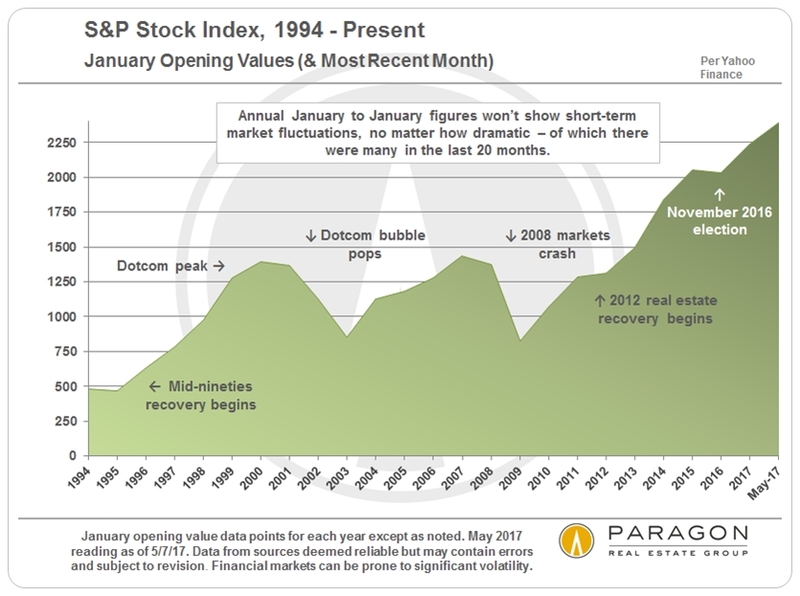 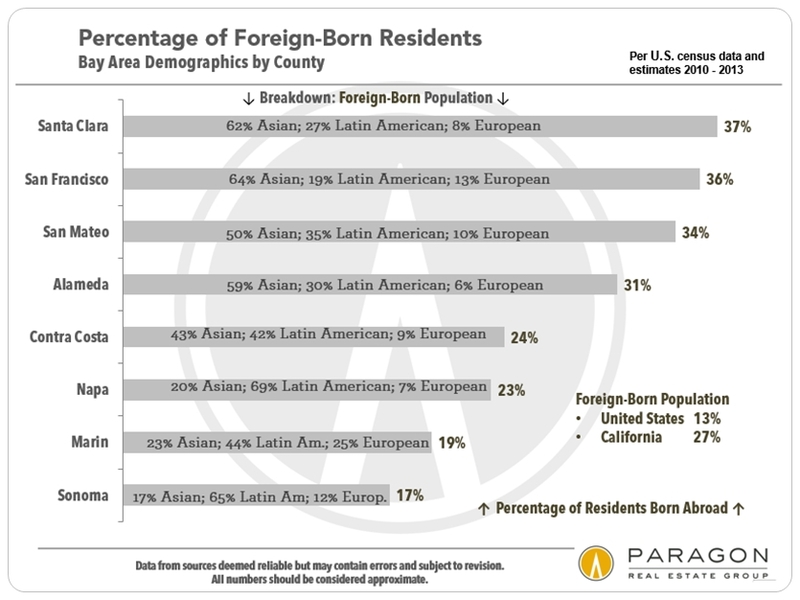 Our analysis represents simply one scenario, which is meant to be more of an invitation to perform your own calculations than a definitive conclusion on the subject. 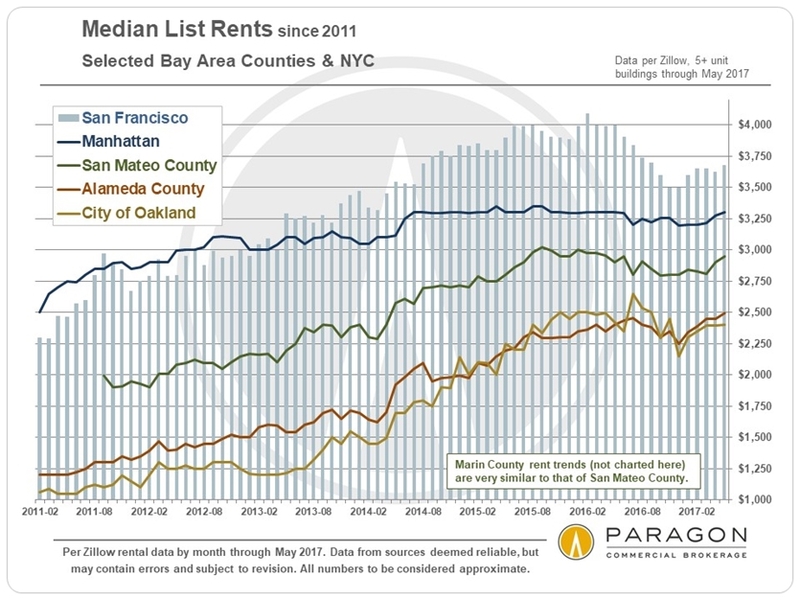 Depending on your circumstances, plans and predictions for the future, renting may well be the best choice for you. 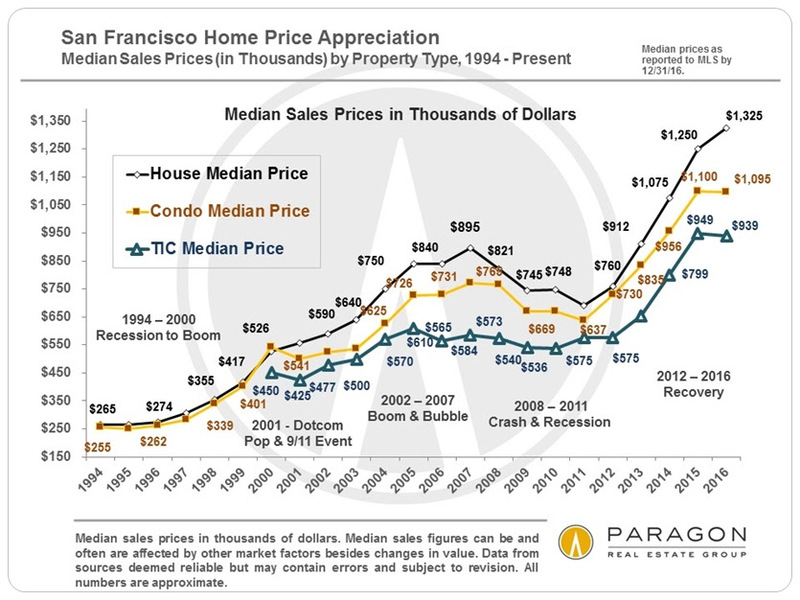 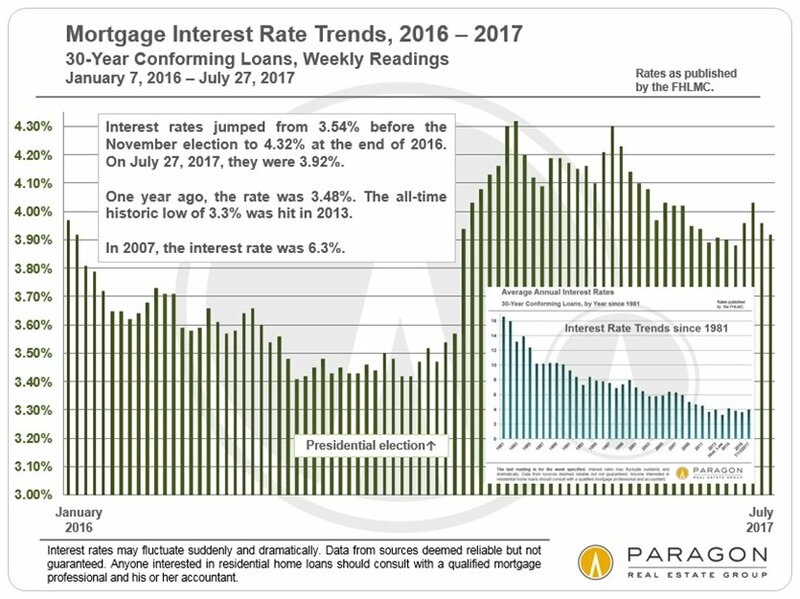 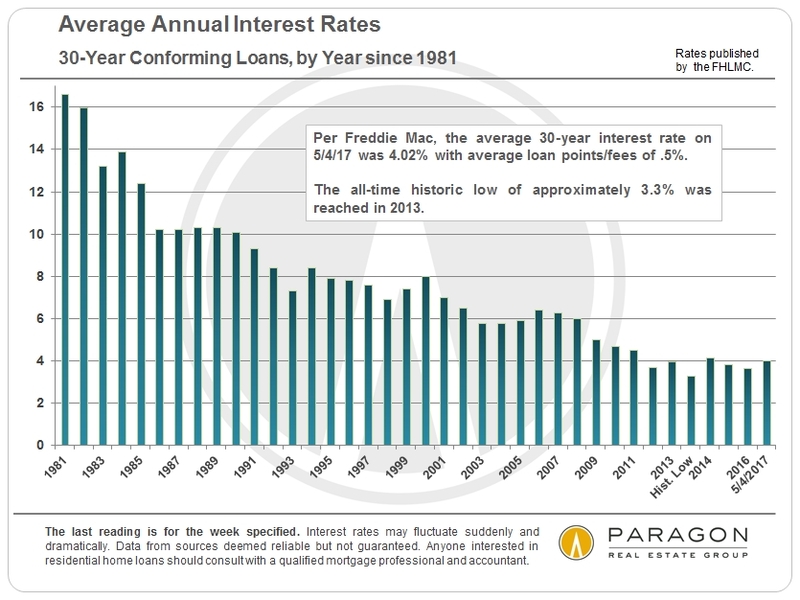 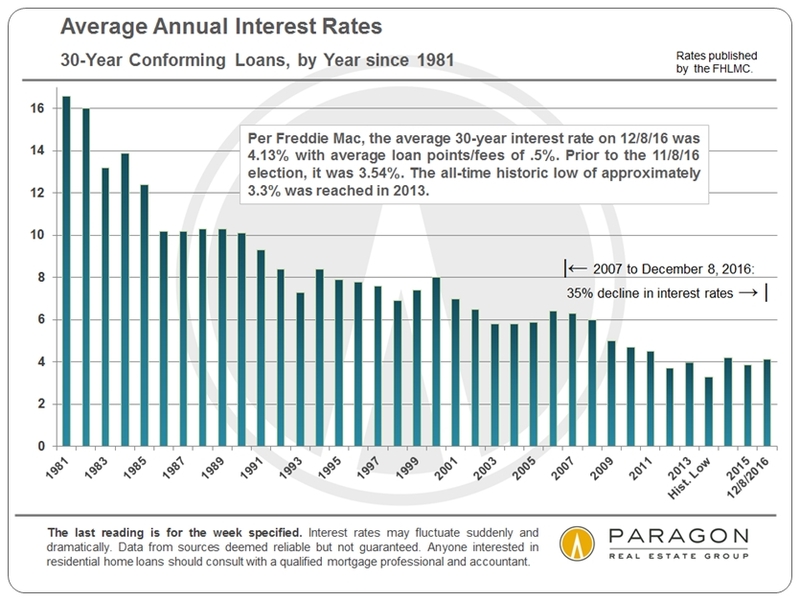 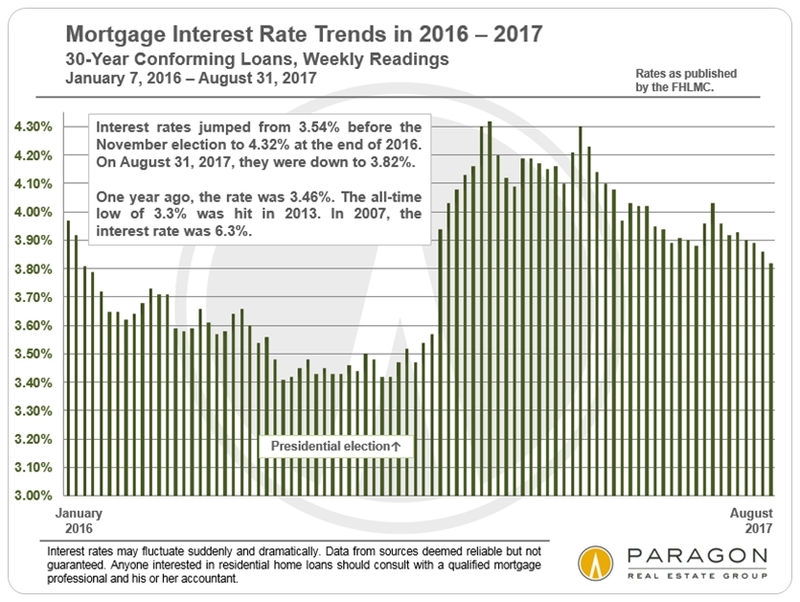 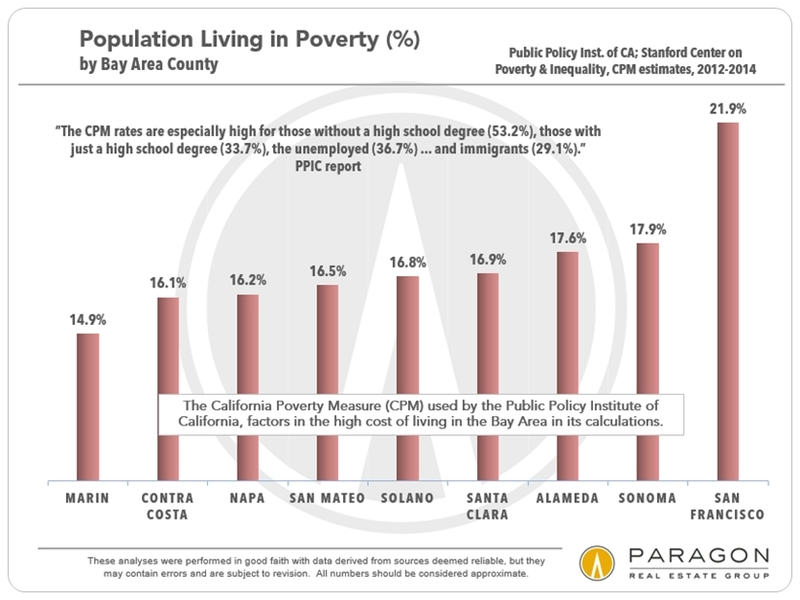 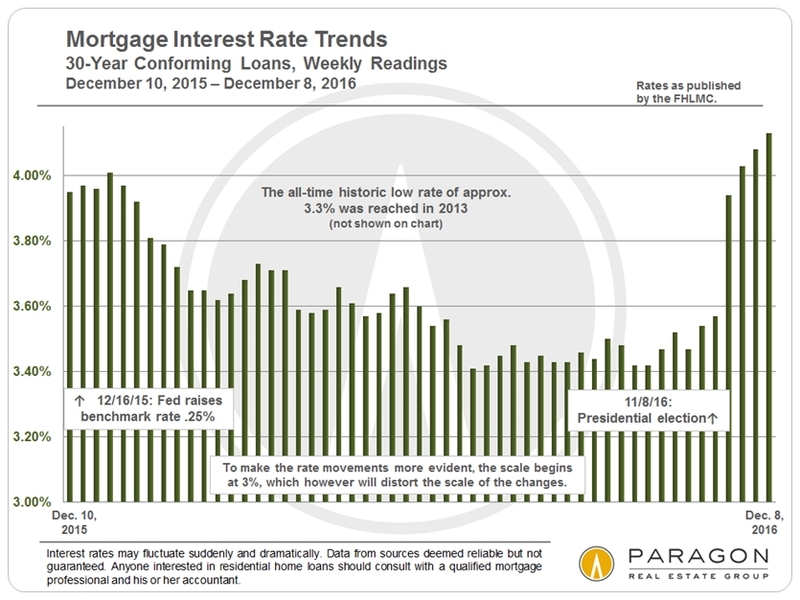 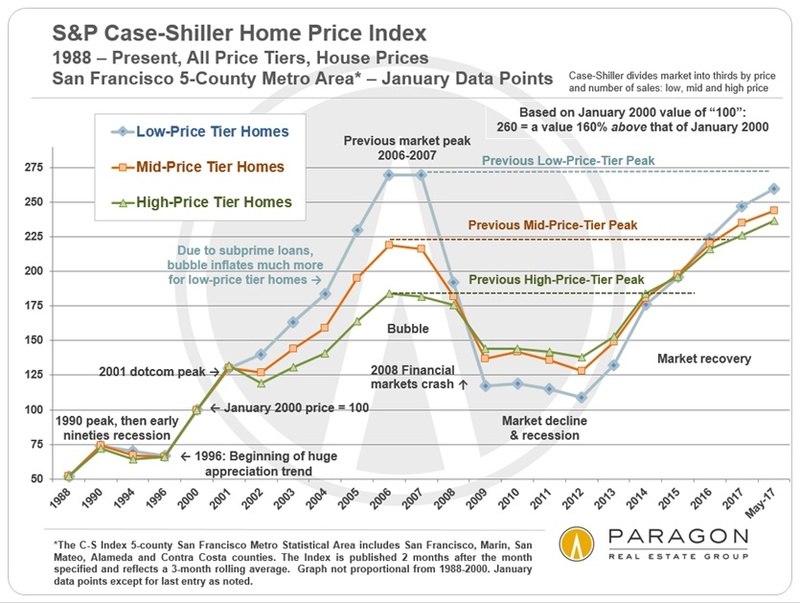 However, low interest rates, high rents, loan principal pay-down over time, inflation and appreciation rates, and the large tax benefits that accrue to homeownership typically give a large long-term financial advantage to buying, if you have the funds for the cash down-payment. 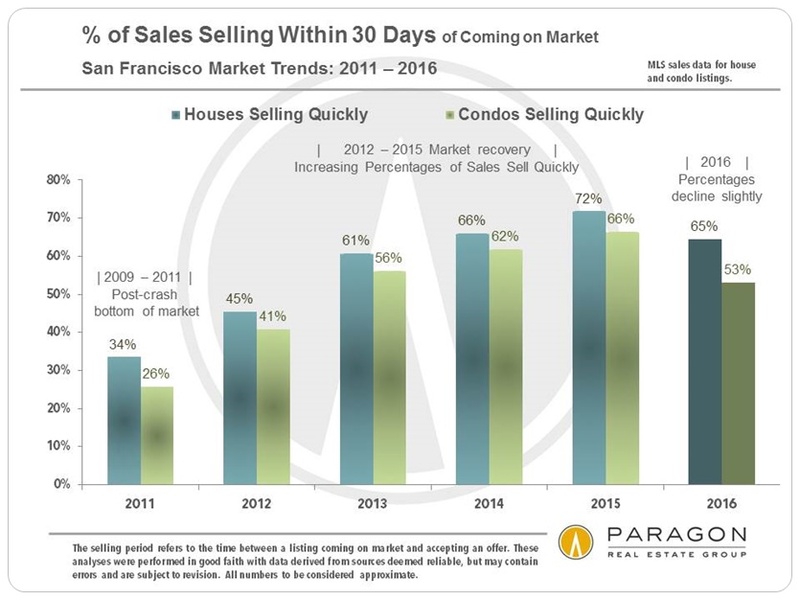 (Of course, as with any investment, financial results will ultimately depend on your purchase and sale dates.) 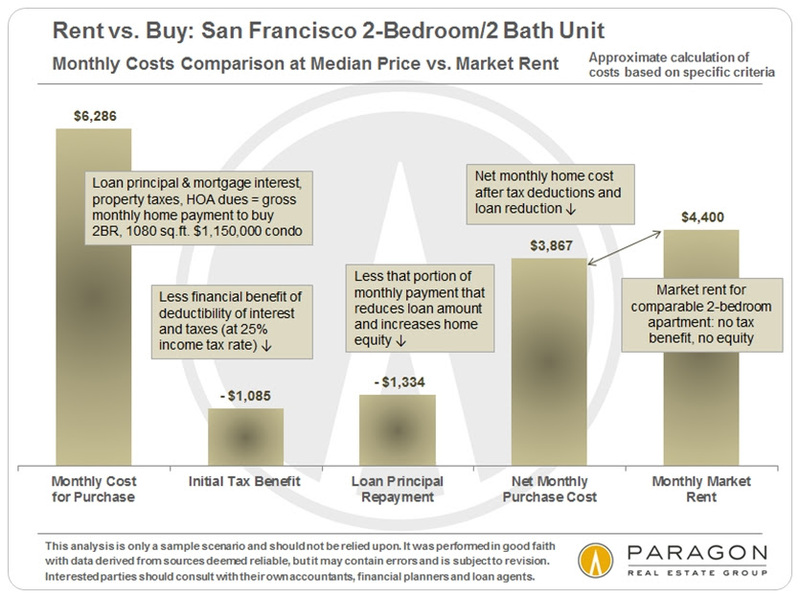 This next chart compares net monthly housing costs between renting and buying after tax deductions and principal repayment are accounted for. 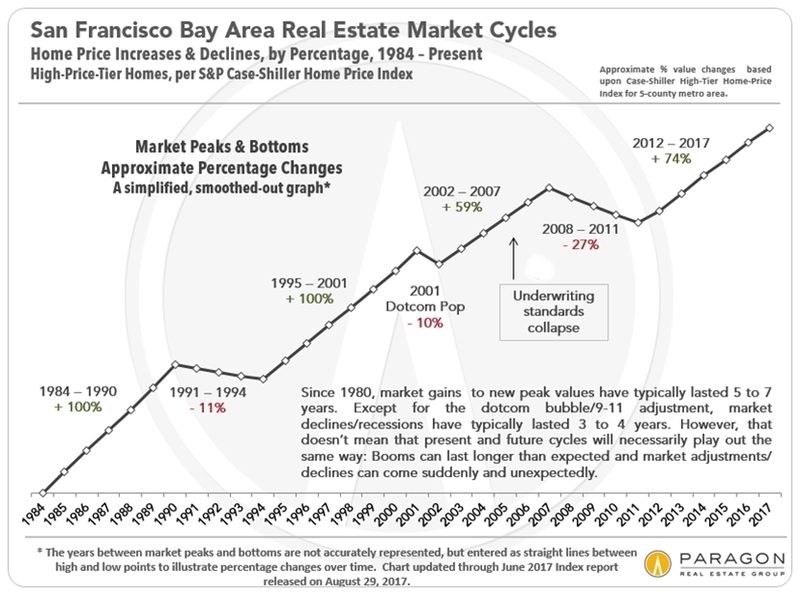 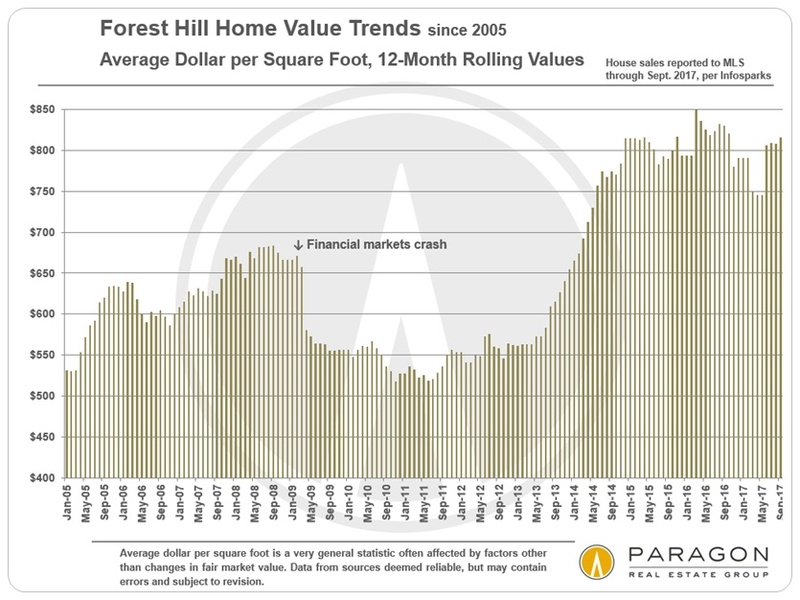 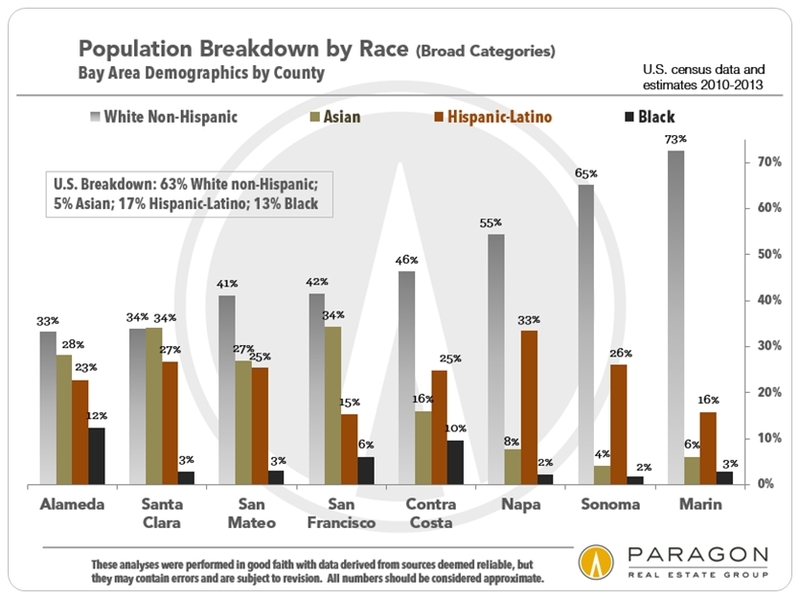 Our full report goes into much greater detail, such as the accumulation of wealth, in the form of home equity, over time. 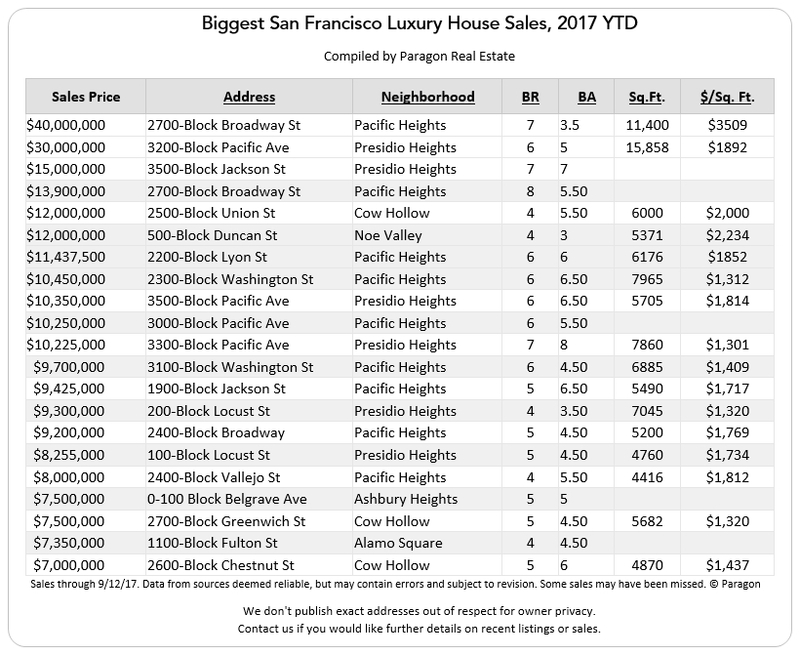 Please contact me if you would like a copy.